Shown set on our model HD work bench this housing is 60" long x 30" deep x housing is 79" high with a 60" high opening, add uprights for louvered panels or steel pegboards for secure storage. Pad Lock Drawer 18" x 18" x 18" shown suspended from the bottom of a 3" drawer, what makes this set up unique is that the drawer is set on a slide system so that the drawer can be moved left to right under the surface. 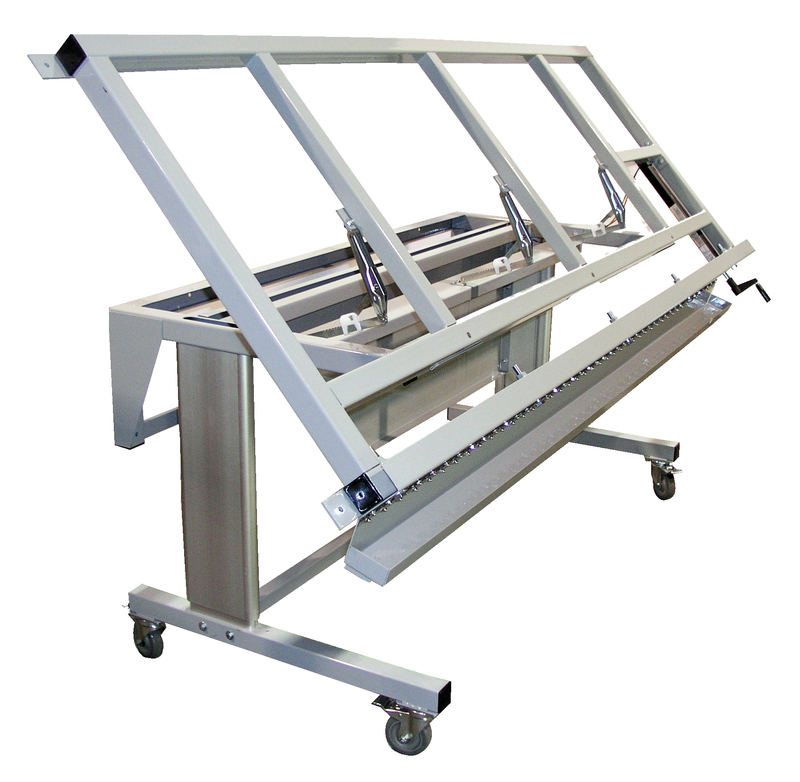 Progressive Assembly For through hole printed circuit boards, mounts to the Flexline open frame comes with two adjustable slide rails and steel catch pan. Pedestal Cabinet Bench 72" long x 30" deep x 34" high, shown with plastic laminate work surface with "T" mold edging, two box and one file cabinet 18" wide and two 3" drawer one box drawer and one file cabinet 18" wide and a footrest. 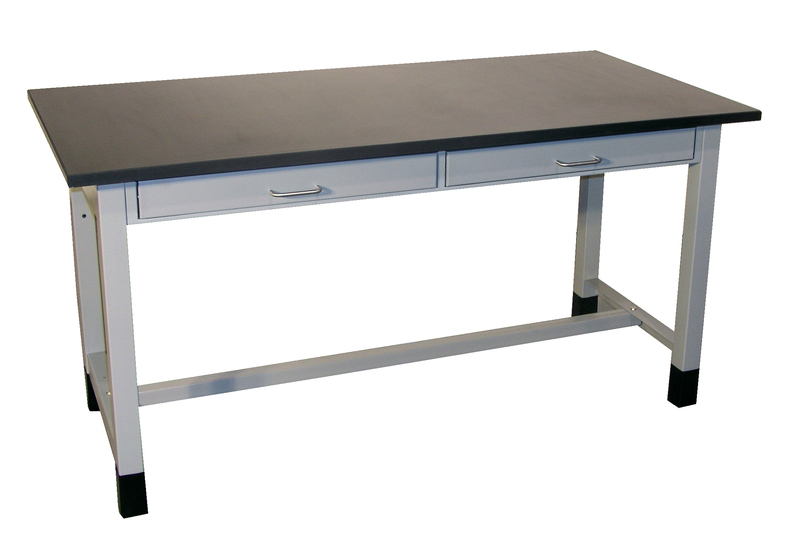 72" long x 30" deep x 34" high pedestal work bench with laminate work surface, one support leg, footrest and a 18" wide cabinet with two 3" drawers, one 6" drawers and one 12" drawer. 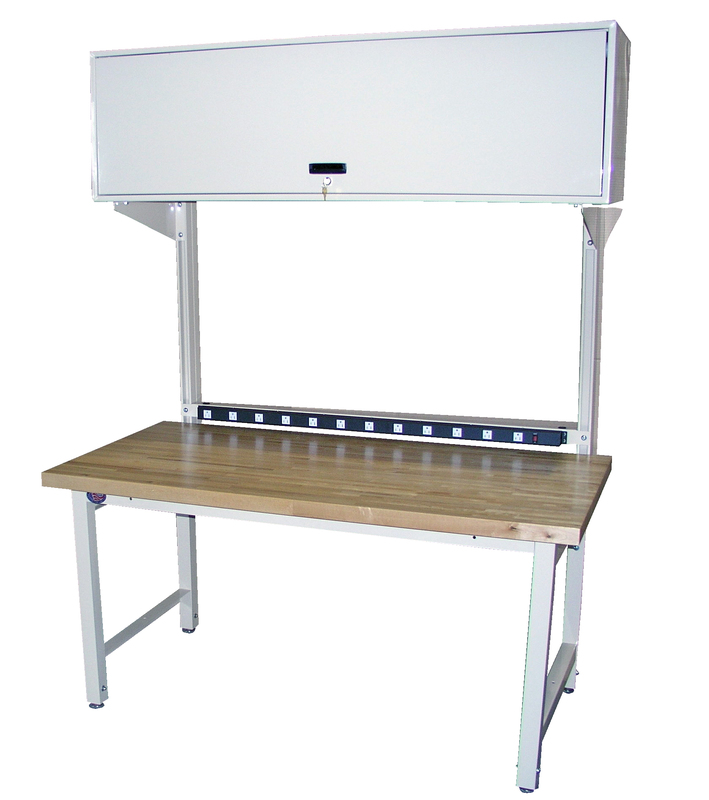 MVSII electric height adjustable work bench with odd shaped work surface. Proline makes it's own laminate surfaces this allows us to modify the work surface to meet your requirement. Four tier shelving with four pull out trays on each shelf, 18" wide x 24" long shelves with 90% extension slides, this unit included wire management troughs, 12" power supply and lag plates to secure to the floor. 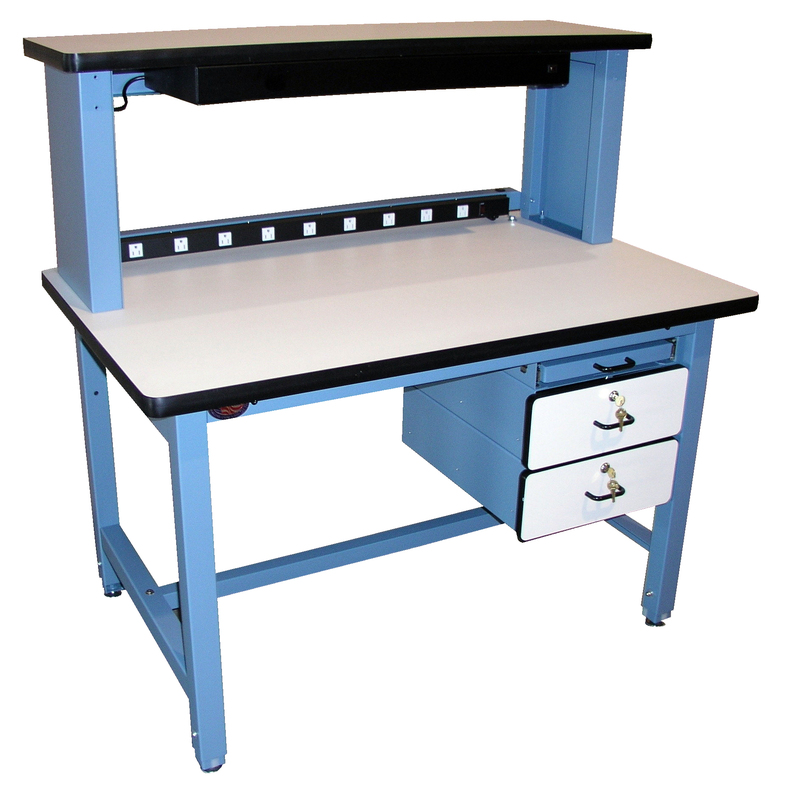 48" x 30" model HD work bench with 24" x 24" built in scale shelf, this work bench features a solid maple work surface, lower shelf, pull pin adjustment from 30" to 36" high, uprights, power supply flat screen monitor arm and cantilever shelf. 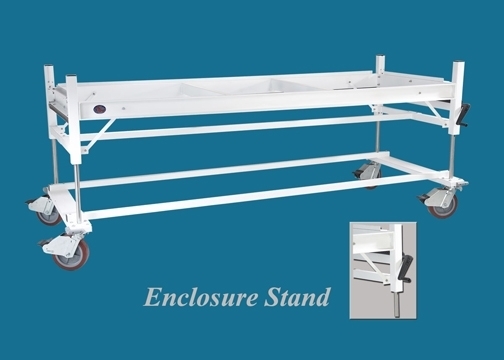 72" x 36" Manual Retractable Ball Transfer with two levers 500 pound capacity per side, dual motor electric tilt with 1,200 pound capacity, spilt uprights with louvered panels, power supply, cantilever shelf, overhead light and tool suspension frame. 96" long x 30" deep x 34" high Welding Table 6 leg design with .250" thick unpainted work surface, shown with optional lower shelf, arc shield, overhead light and end stops. 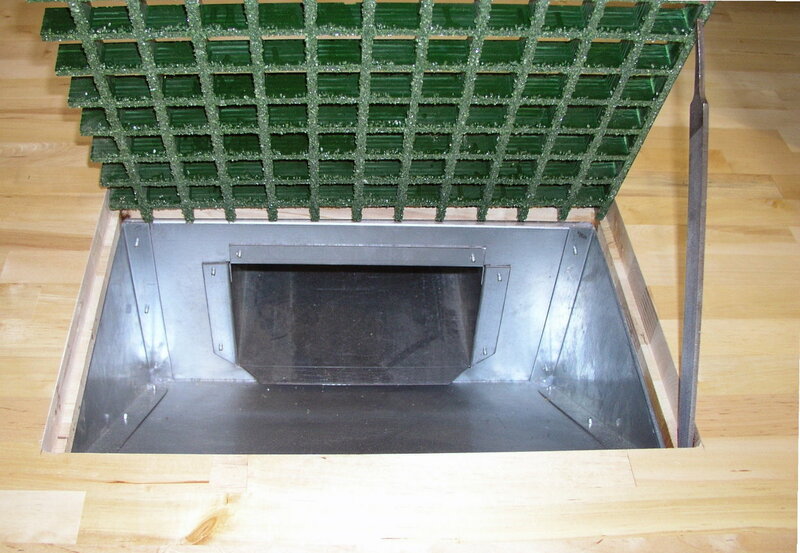 Polypropelyne Enclosure 36" x 36" x 36" used for wash down applications this unit included a drain. 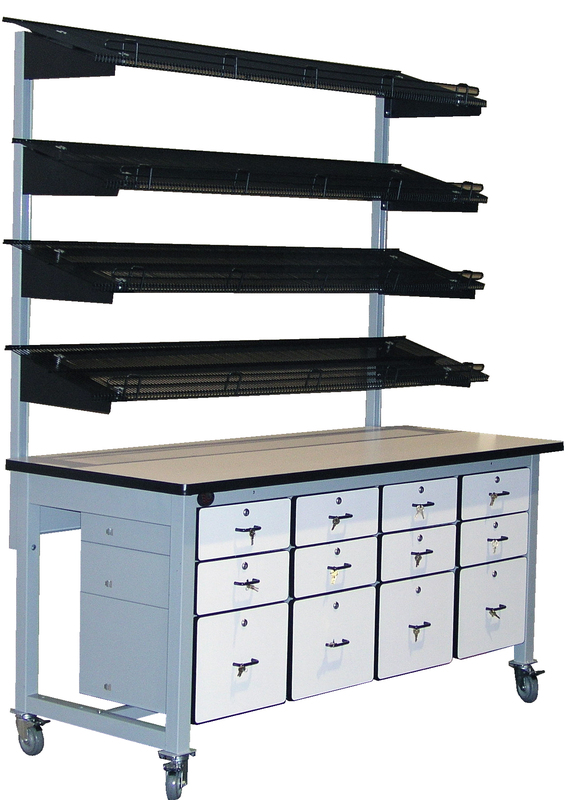 This work bench was designed to move heavy long products up to 6' long. 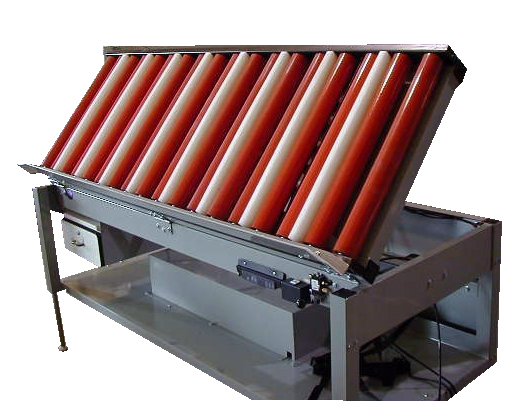 The roller conveyor tilts and rotates 360 degrees, the height is also electric hydraulic height adjustable, allowing the operator to work at an ergonomic correct height on any side of the product they required. 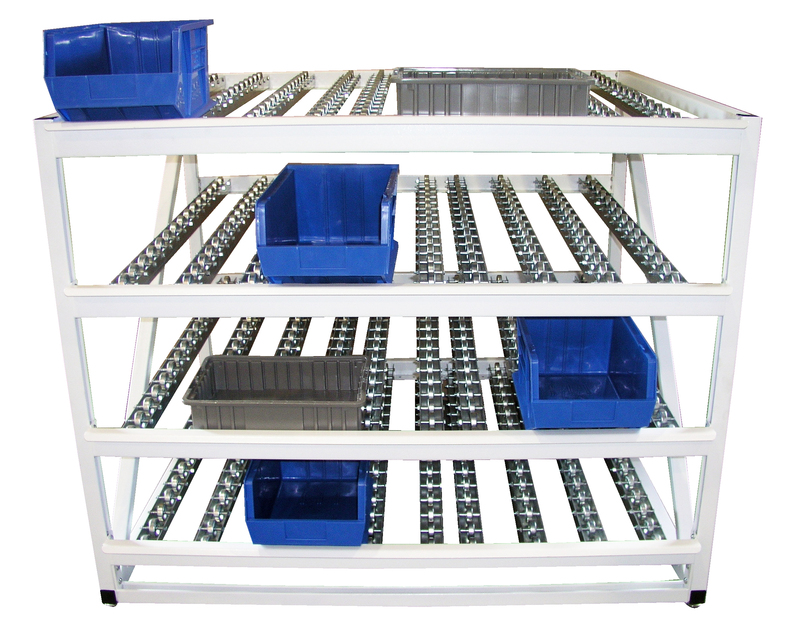 This mobile cart is 48" long x 30" deep x 60" high, two fixed shelves with dividers to allow storage and movement of separate items through out your plant. 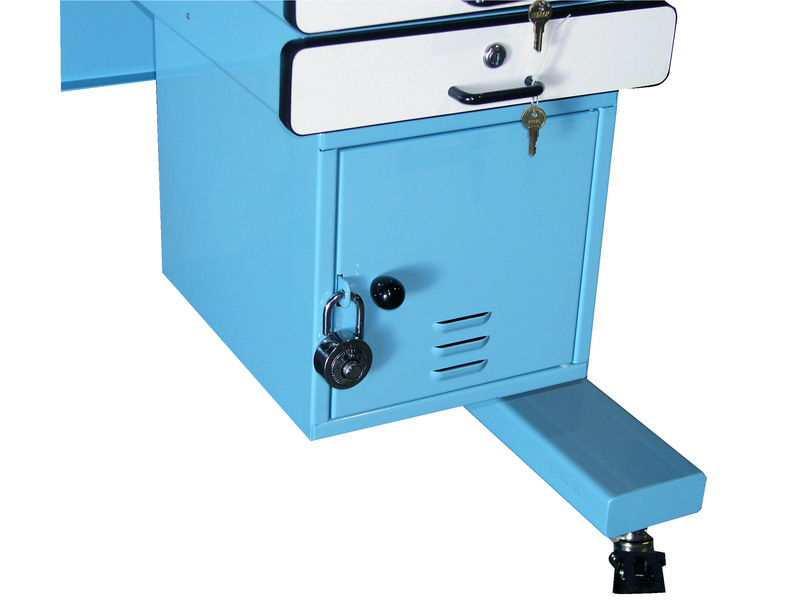 Total lock casters allows the unit to be stationary when loading. 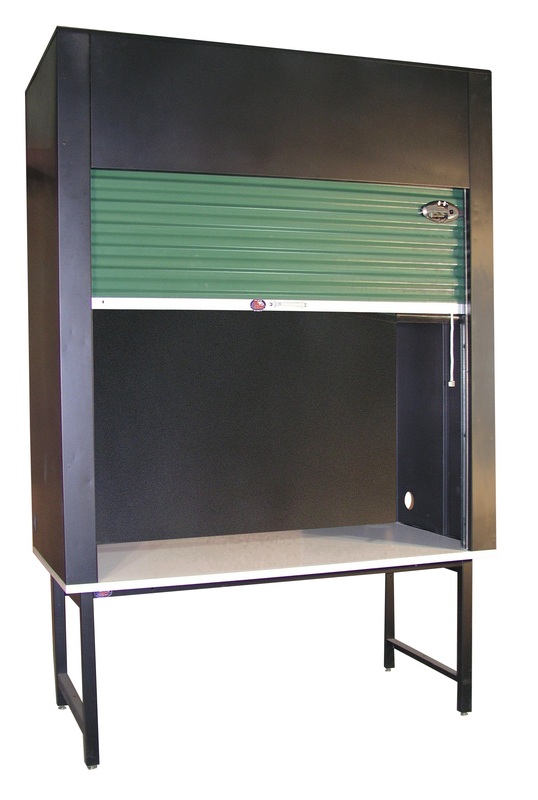 This unit is adjustable from 30" to 36" high with pull pin adjustment, total lock casters allows both roll and swivel to lock when you need the unit stationary, full lower shelf for storage and two hand lever lift mechanism's on the retractable ball transfer lifts 500 lbs per side. 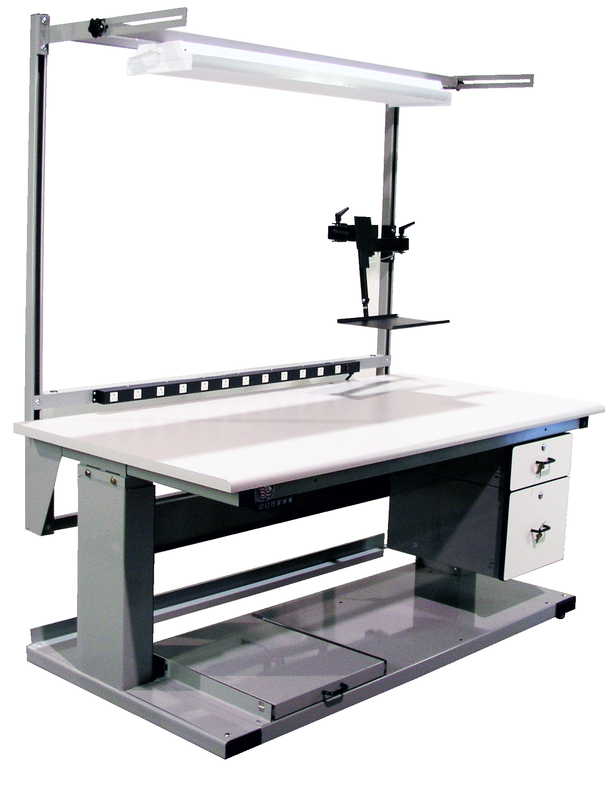 72" x 36" MVSII work bench electric height adjustable with side mounted bubbled wrap holder that raises and lowers when the surface adjusts. 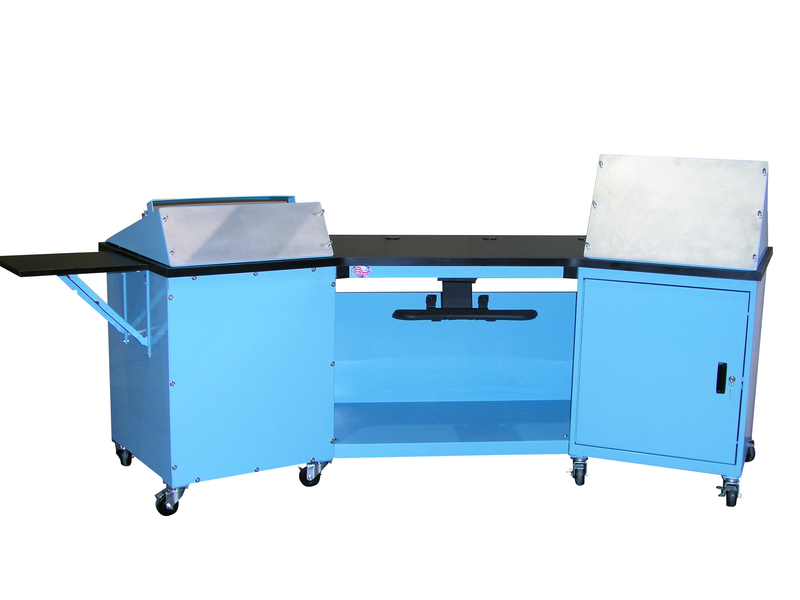 Also shown is our rotary shear cutter, power supply, uprights, cantilever shelf with dividers and overhead light. 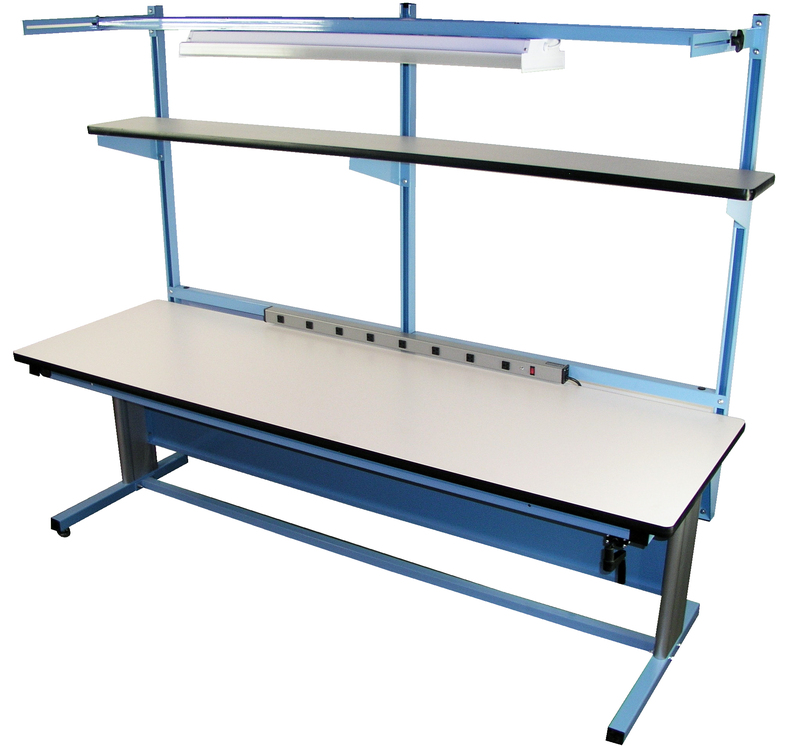 This 72" x 30" MVSII work bench has a two tier lower shelf, the shelf raises and lowers with height adjustable work surface for a truly ergonomic storage solution. This work bench also has casters and overhead light. Open Frame 60" wide x 66" high. 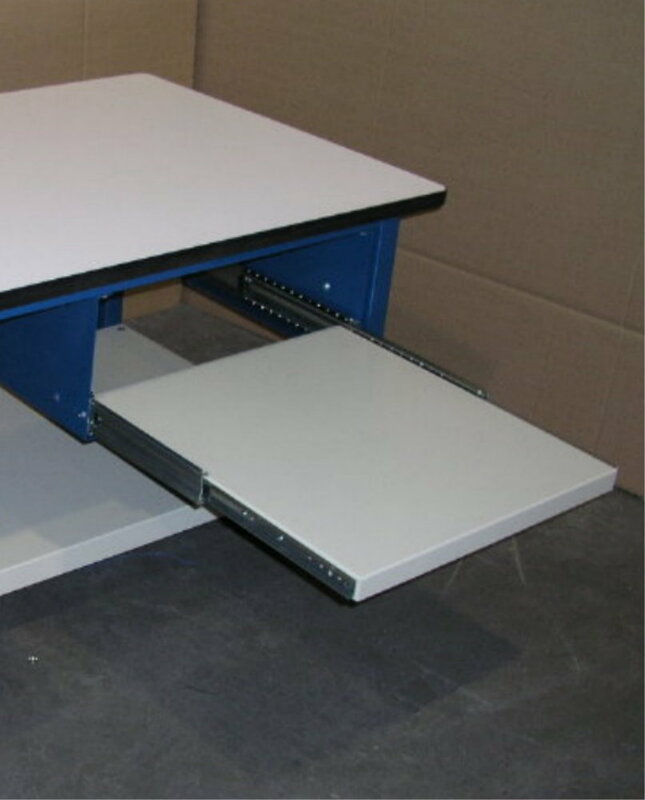 This unit is ideal to set behind an existing conveyor or piece of equipment to add modular accessories to a work area. Frames are available in multiple widths and heights, our modular accessories allow you to configure the work area you need. 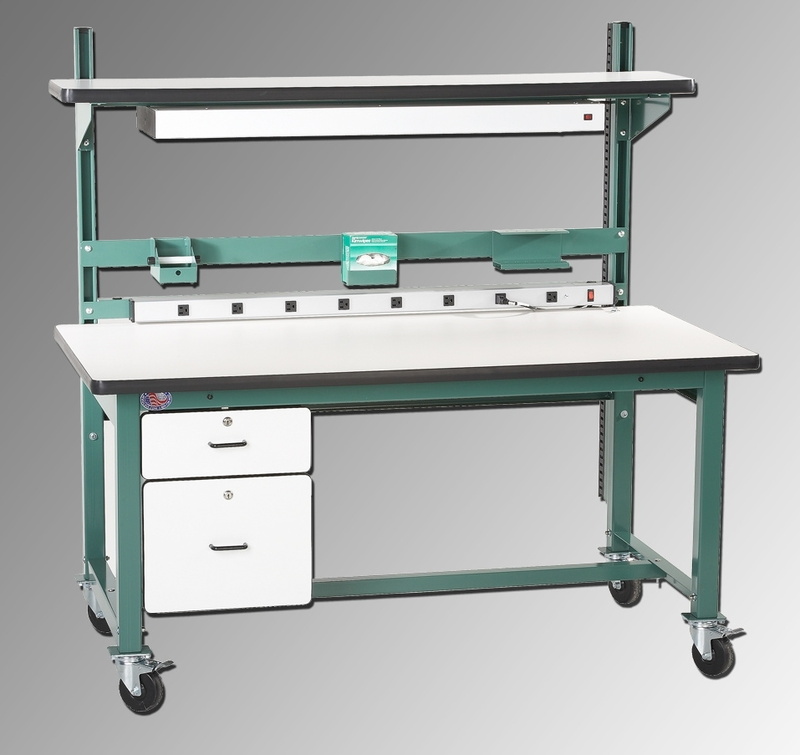 Our MVSII series work benches come with 1,000 pounds capacity and lift from 30.5" to 46.5" high. The feature three position programmable memory. This work bench is shown with 6" and 12" drawer and 18" high riser. 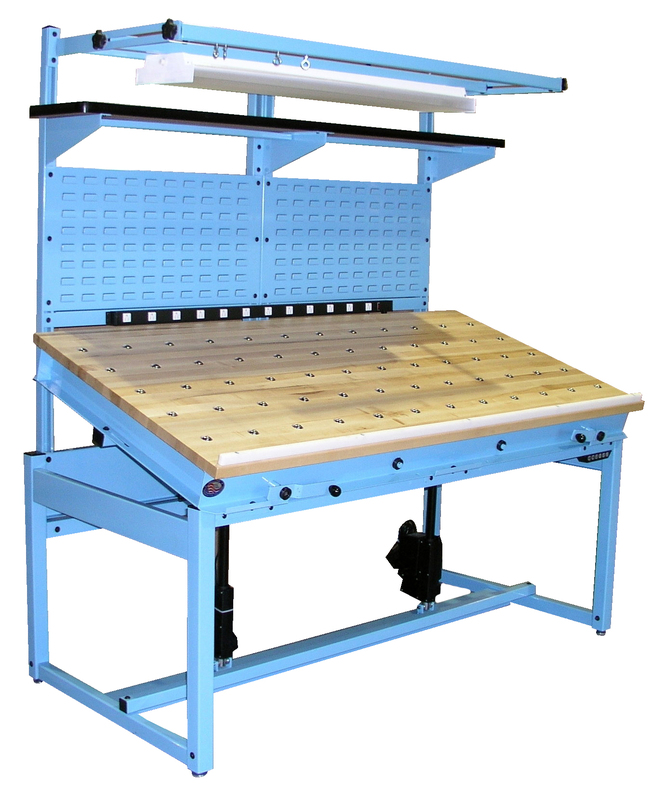 72" x 30" x 30" Model HD work bench with full width lower shelf, end panels, uprights, power supply, paper spool holder, three metal cantilever shelves one with 12" x 18" dividers for packaging application. 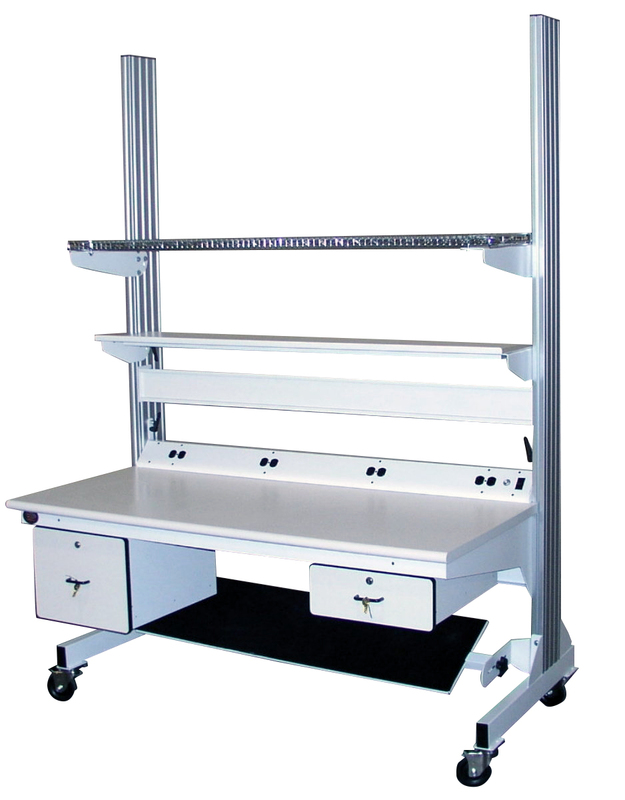 72" x 36" Model HD work bench with phenolic resin work surface, pull pin height adjustment from 34" to 40" high, two under surface suspended shelving units with adjustable middle shelf, power supply, uprights and two 18" deep adjustable metal shelves that tilt up to 30 degrees. Offset caster mounting brackets allow casters to be added to the MVSII series work bench with out changing the 30.5" to 46.5" height adjustment. 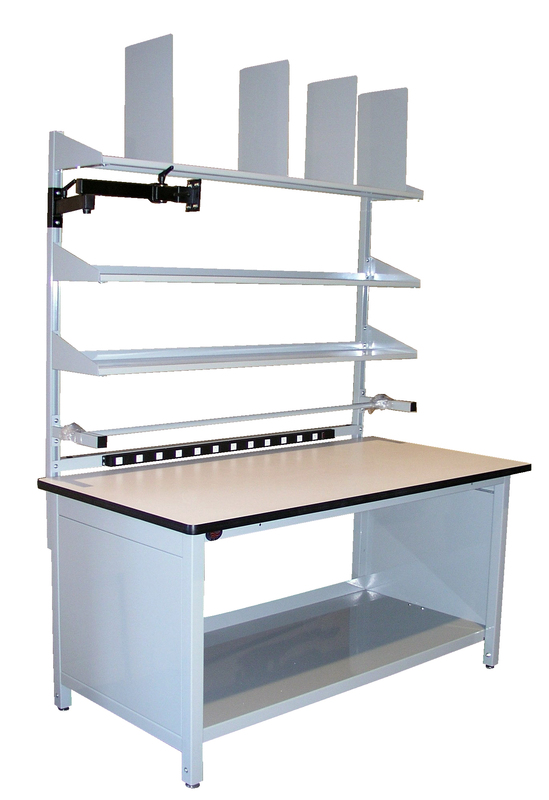 This work bench also shows post form rolled front edge, paper spool holder, flat screen monitor arm, 12" deep shelf with dividers and an overhead light. This photograph shows how the offset mounting bracket for the MVSII from the front view. 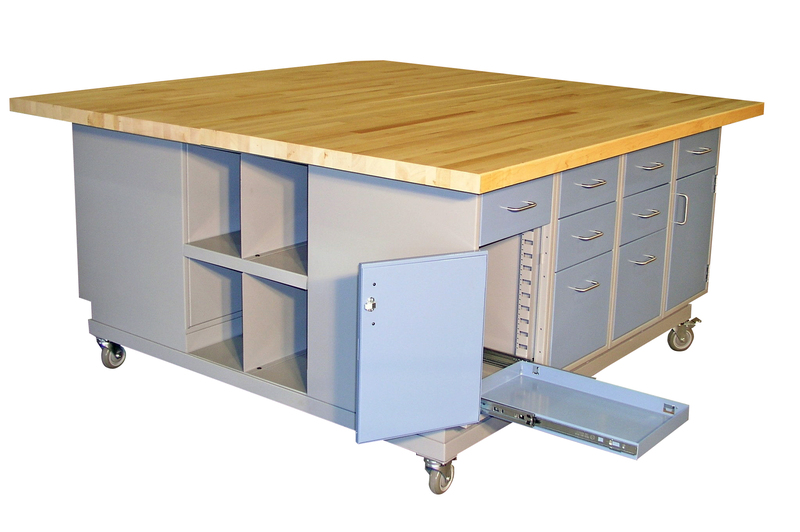 This work bench shows three of economy cabinets on a mobile bench, the work surface is a 54" long x 26" deep solid maple surface, two 18" wide swing door cabinets and one 18" wide cabinet with two 3" drawers, one 6" drawer and one 12" drawer. We offer both solid steel doors and glass doors on these hanging wall cabinets. We also offer both single swing door or double as shown. 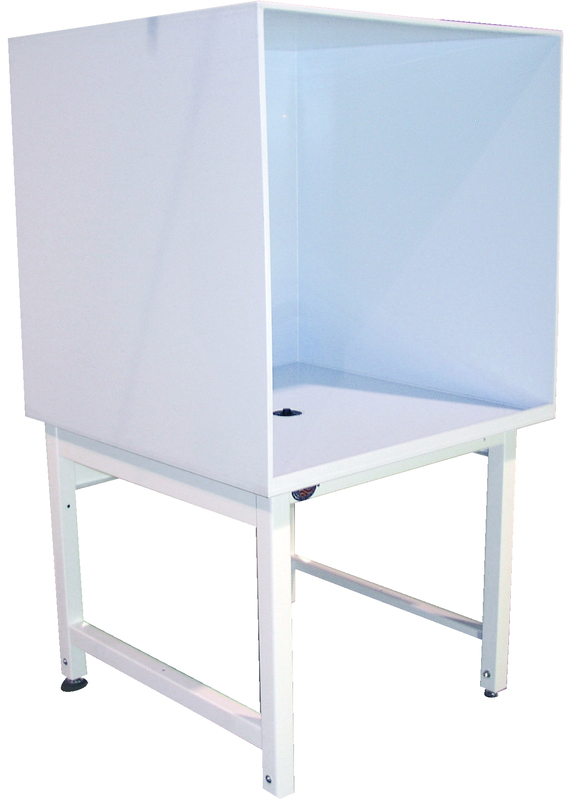 Cabinets come standard with one adjustable shelf, photo show one optional additional shelf. 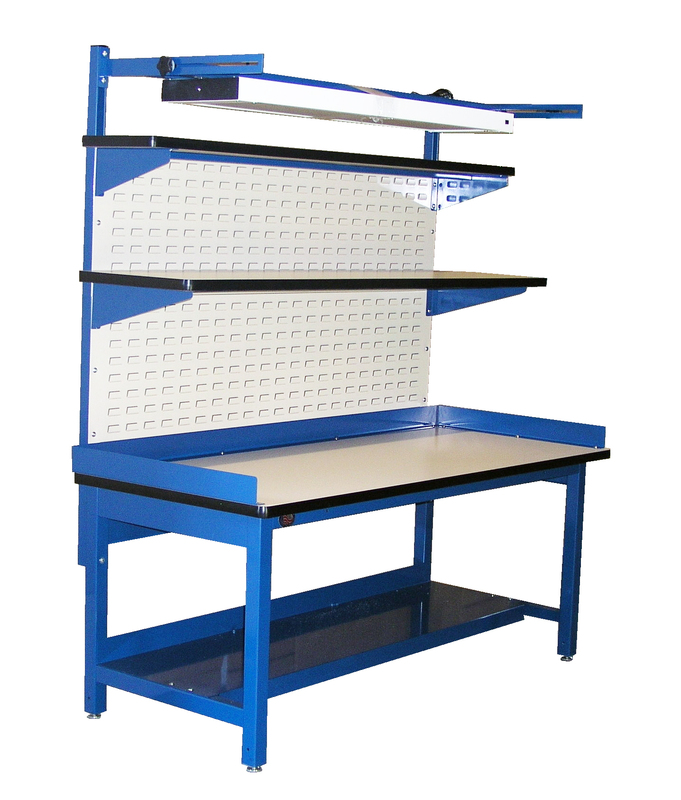 This work bench features a lower metal shelf, end guards and back guards, back stop, uprights, two louvered bin panels, two 18" deep cantilever shelves and deluxe overhead light fixture. 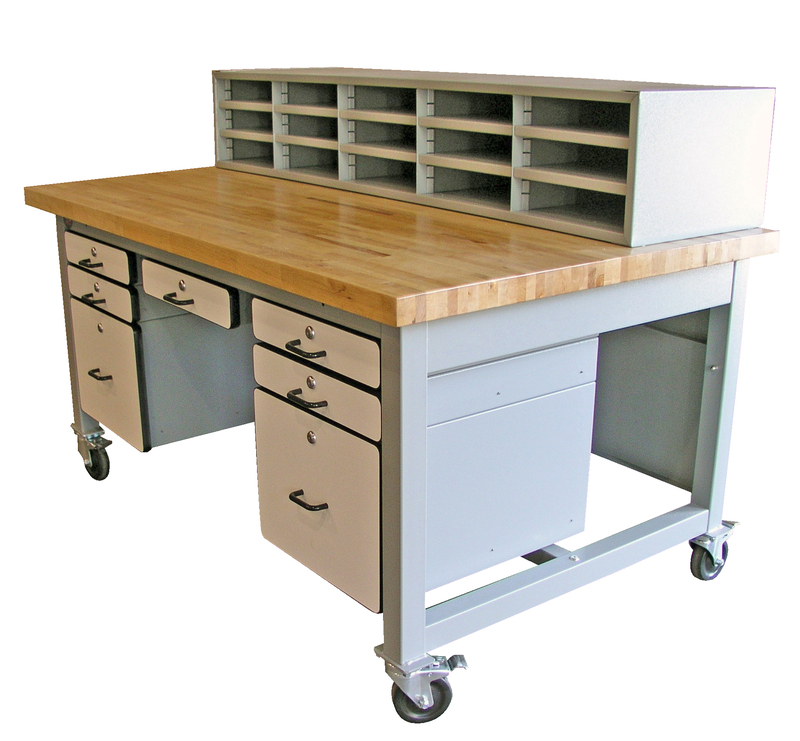 Mobile work bench with five 3" drawers, two 12" file drawers, total lock casters that locks both swivel and roll, 1.750" thick solid maple surface and sorter bin 60" long. 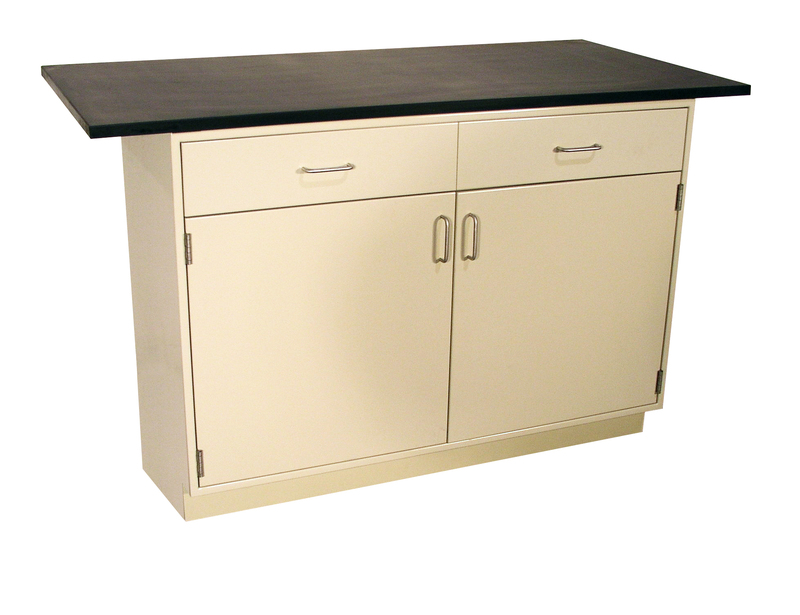 Proline offers both overhead sliding door cabinets and flipper door cabinets, this 60" long HD bench shows our HDUR60 heavy duty uprights, power supply with mounting rail and a FDC60 Flipper Door Cabinet. 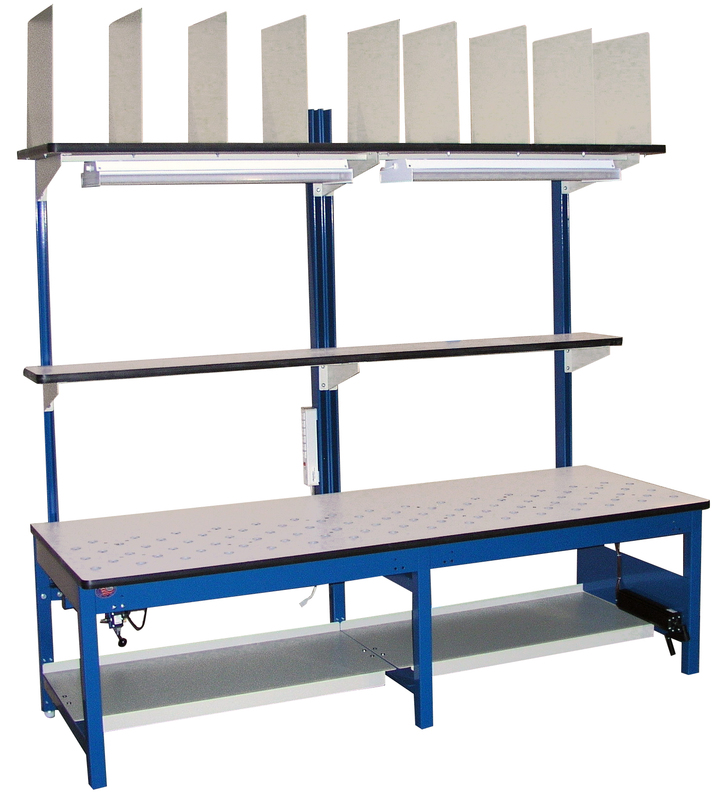 Our FlexLine model work benches can be set up with multiple shelving as shown here for point of use storage applications. 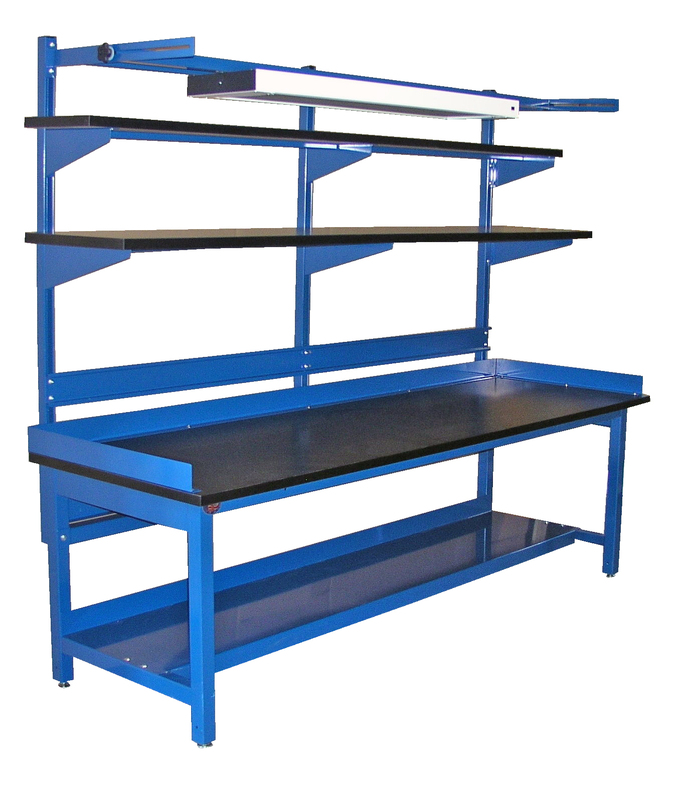 This work bench is 48" wide with three 48" wide x 24" deep adjustable metal shelves, allowing the operator to easily adjust the pitch of the shelf. 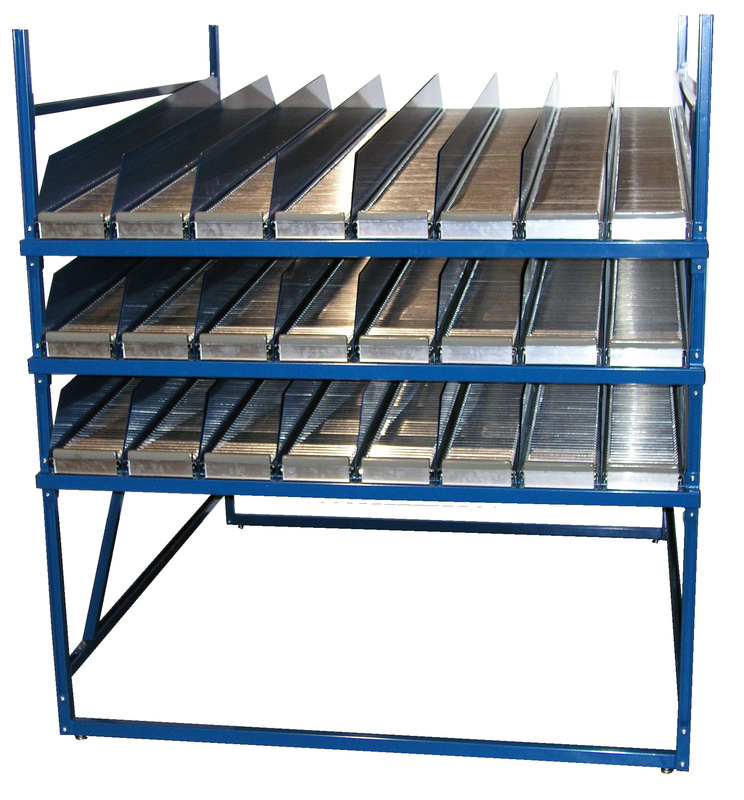 We can modify our flow racking and point of use storage bench to meet your requirement. 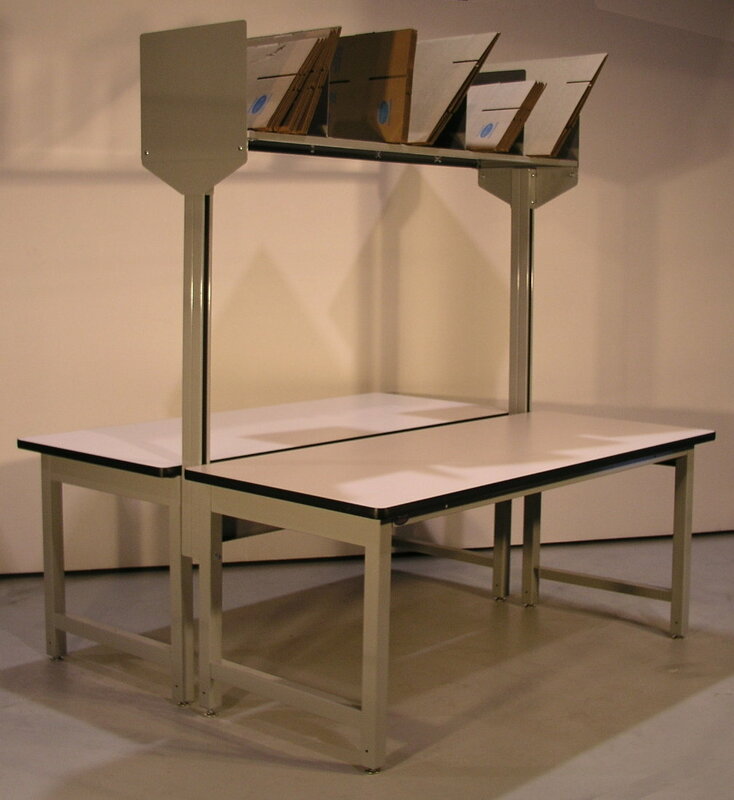 In this application the customer required one tier of shelving with "knuckles" on the conveyor so the product would be closer to the operator, we also mounted flat screen monitor arms and CPU holders on the frame. The entire unit will be set behind a conveyor, this unit also featured lag plates so that the unit could be secured to the floor. Both our manual and electric wire harness benches accept our modular accessory upright supports, this photograph shows our overhead light. When ordering accessories with either model use our 60" wide options as the uprights are set 54.5" apart. 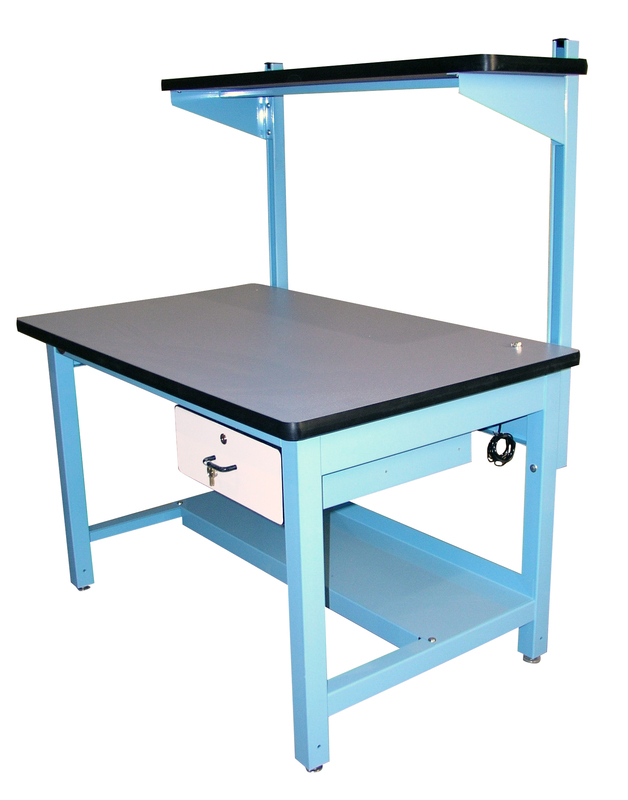 Using our modular Model HD work bench this bench has been outfitted with an enclosed steel shelf, 4" x 4" wire management, 14" x 14" articulating tray, CPU holder, foot rest and HDLE-6 pull pin 6" adjustment. 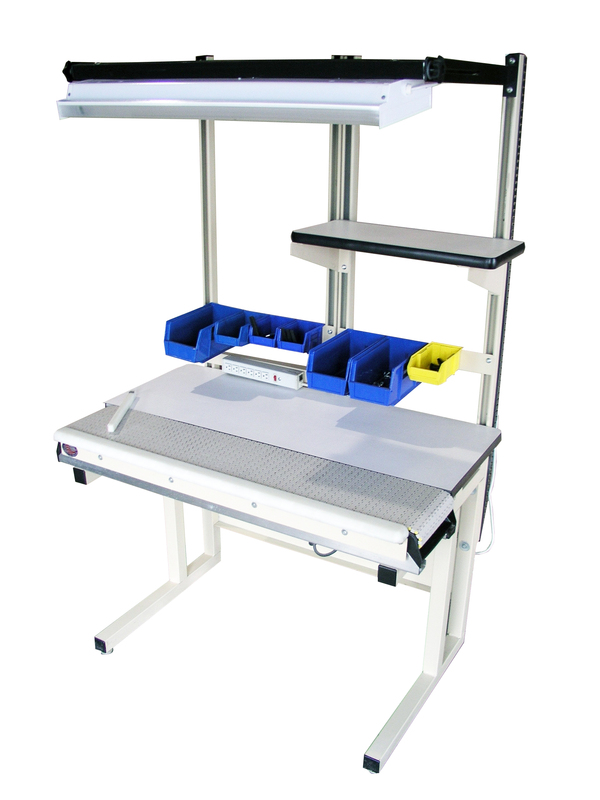 The FlexLine model work bench allows you the ability to adjust options and surface height independently of the upright height. 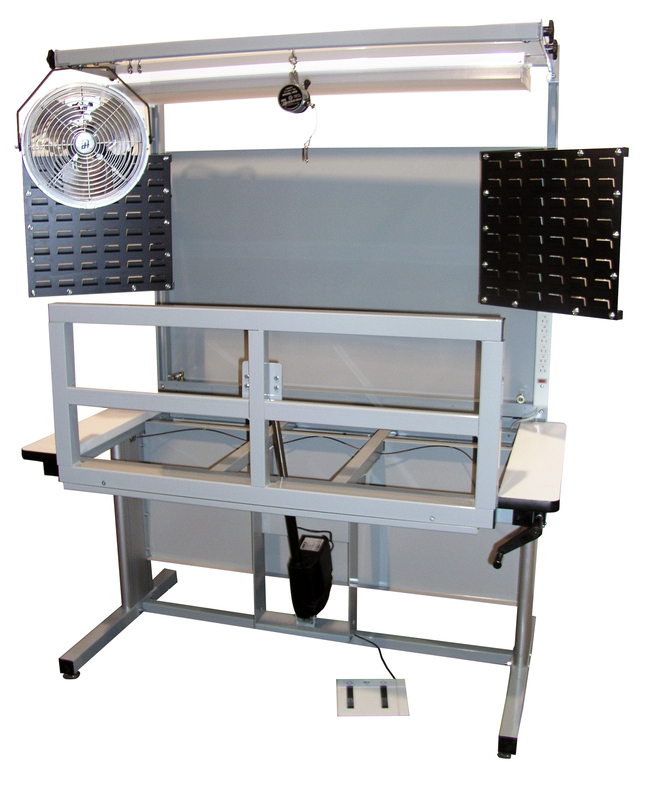 This unit is shown with lower shelf, bin holder, air quick disconnect, adjustable metal shelf, overhead light and personal fan. Model HD with steel peg board. 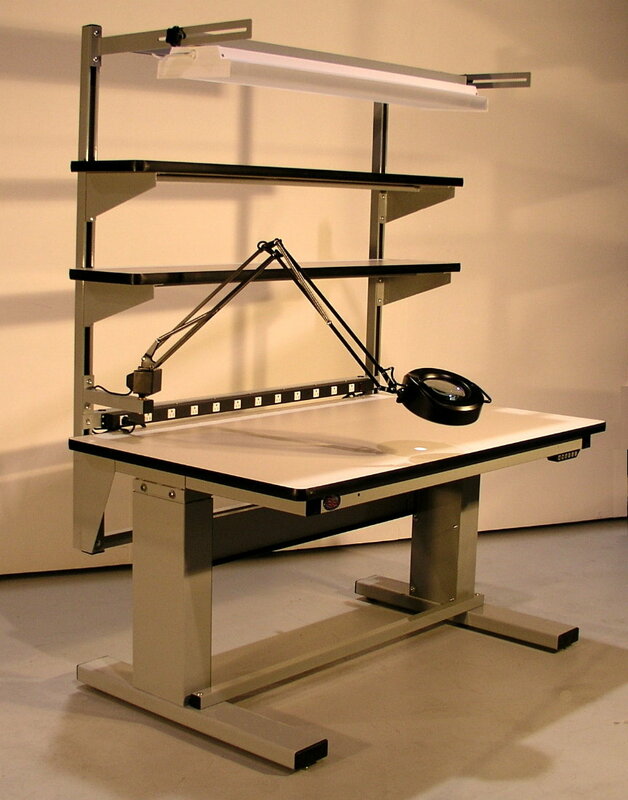 Mobile Model HD with uprights, steel pegboard, 14" x 14" articulating tray, power supply, cantilever shelf, paper or label holder and an overhead light. Model HD with 90 degree rolled front edge. 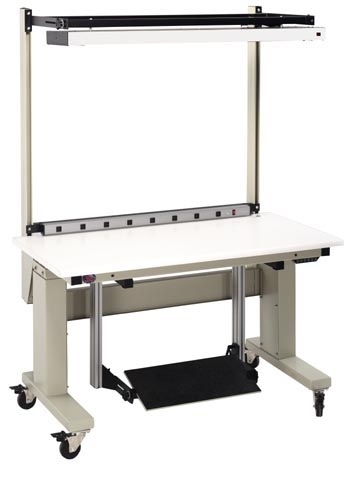 Our Model HD with a 90 degree rolled front edge is part of our in stock program, available with either standard laminate or ESD laminate, this work bench also has power supply, overhead light, tool suspension frame and a tool balancer. Model HD with Lower shelf. 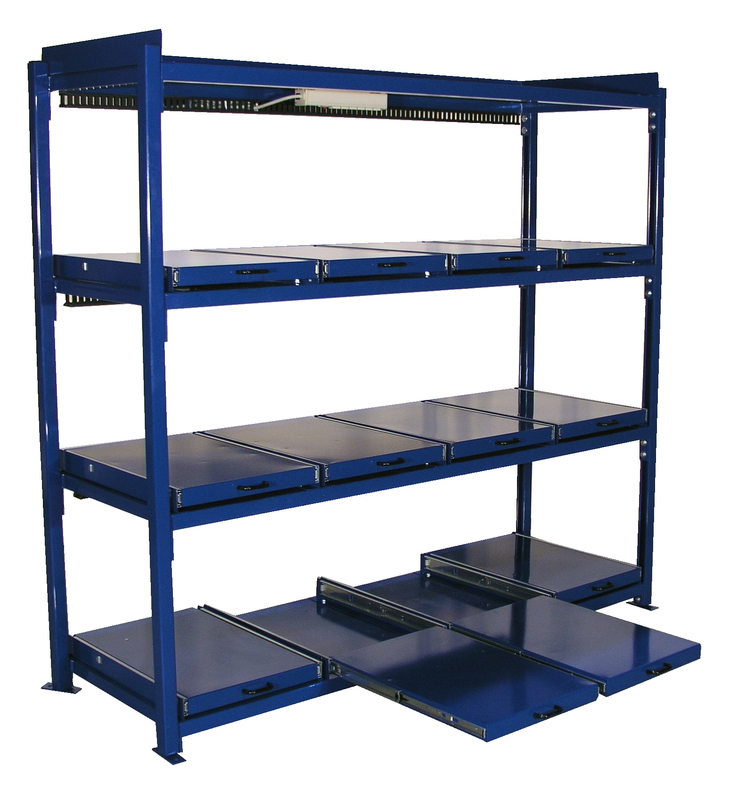 Proline offers lower shelving in five standard depths, 12", 18" , 24", 30" and 36" depth. This work bench show the full width 30" lower shelf, to make room for all three drawers we lowered the side foot rest, this work bench will adjust from 30" to 36" high. 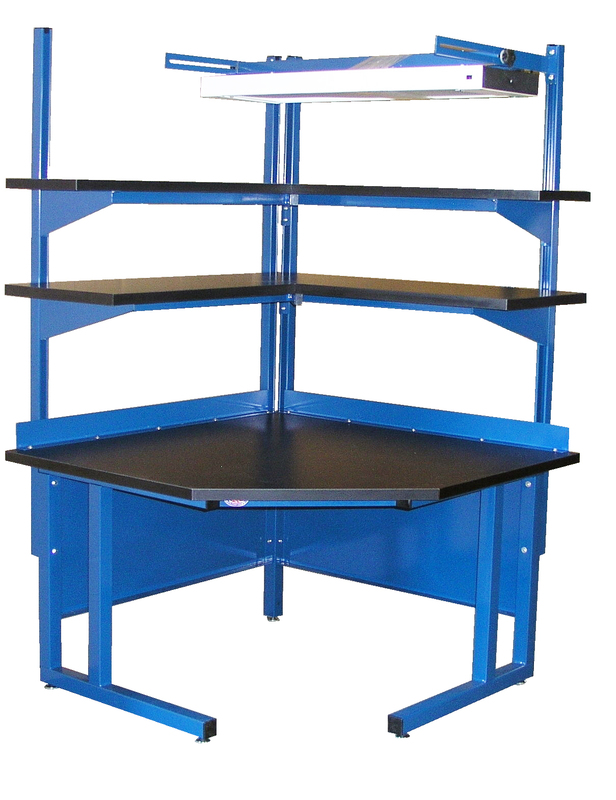 We offer several different types of cantilever shelving for our work benches, this unit features a 12" deep metal shelf, this shelf comes standard with the 4" back stop, all of our shelves can be set at any height on our accessory upright supports. This bench also features a paper spool holder. Model HD with multiple wire shelves. 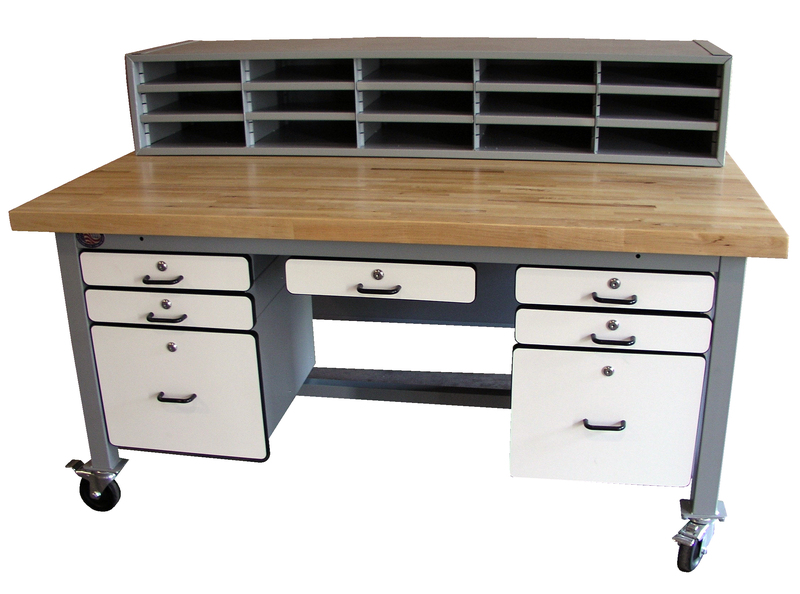 This work bench was set up with four tiers of slanted wire shelving, ,total lock casters that locks both swivel and roll of the work bench, twelve 6" drawers and four 12" drawers. This bench was configured this way for us in a pharmacy, mobile benches allowed them to be moved for cleaning, the shelving allowed for quick access for items to be dispensed, the drawers allowed for additional secured storage. 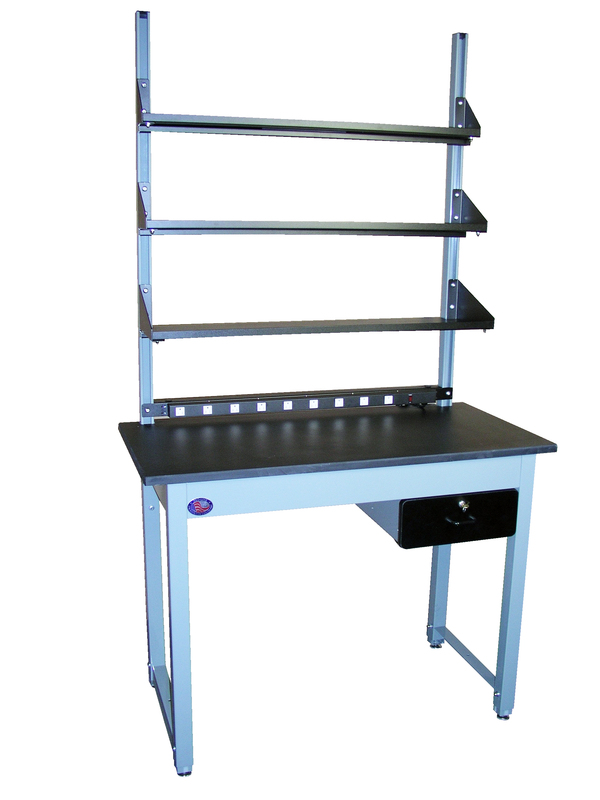 This Model HD work bench is 96" long x 30" deep with Chem-Guard chemical resistant laminate, 24" deep lower shelf, back guards and end guards, two 18" deep cantilever shelves also with Chem-guard surface, bin holder and overhead lighting. 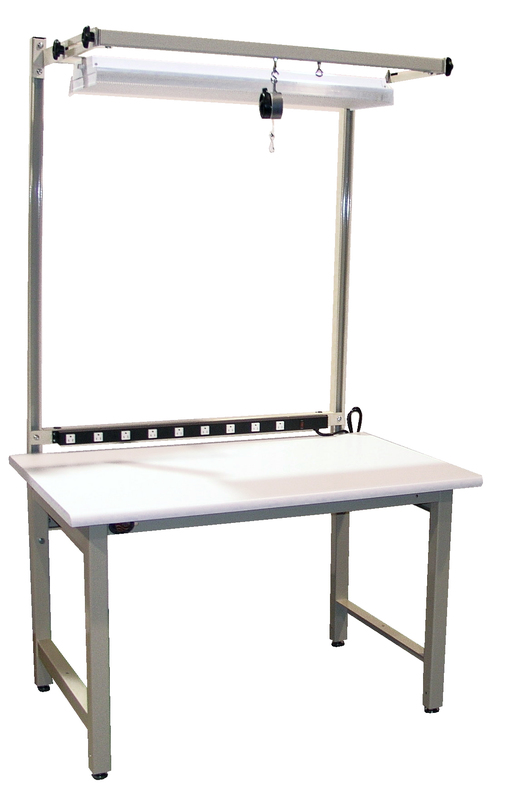 This bench is perfect for dry lab applications. 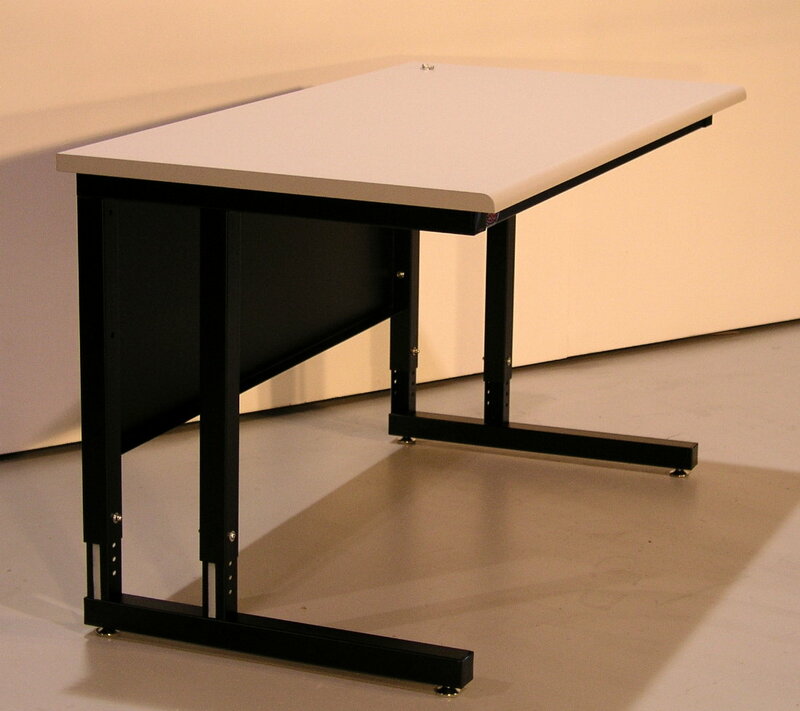 Our Risers are in stock in both 60" and 72" length, please keep in mind we can make them on other sizes as well, this work bench is 48" long with a 48" long riser, also shown is a power supply mounted to the riser at surface height, pull out writing shelf , two 6" drawers and a foot rest. 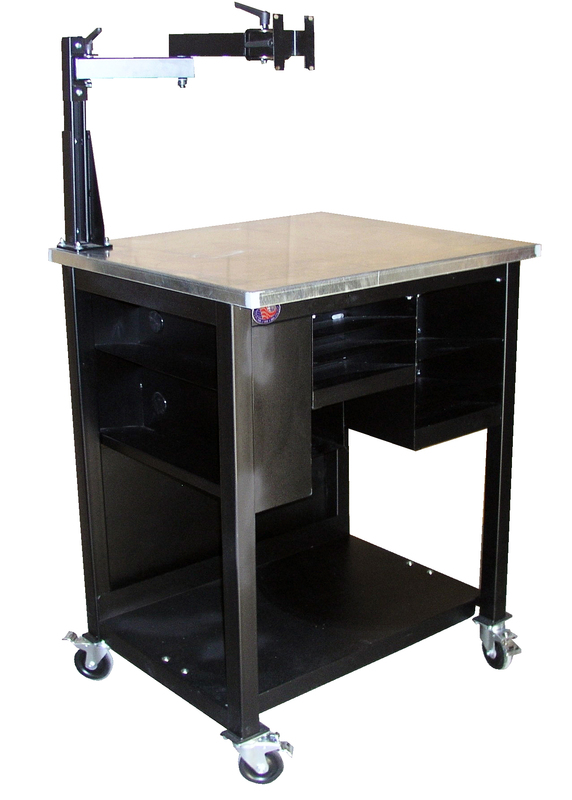 Mobile work bench 60" x 30" with black 1" thick epoxy resin work surface, 12" deep lower shelf, casters, power supply, flat screen monitor arm, uprights, steel drawer and 12" deep cantilever shelf with 4" back stop. We stock our uprights that extend 48" above the work surface, however keep in mind we also offer them 12", 24" and 36" above the surface. 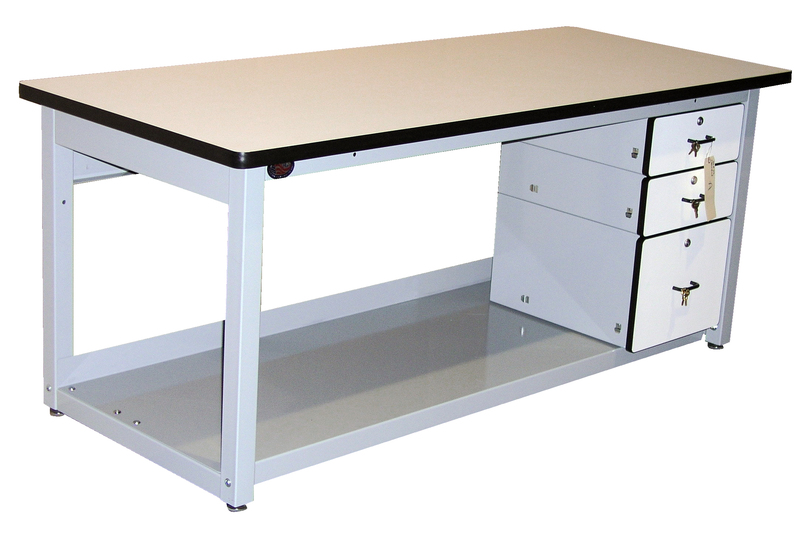 This bench has an 18" deep lower shelf, two 12" power supplies mounted to the surface, casters, flat screen monitor arm with keyboard tray and a 12" deep cantilever shelf. 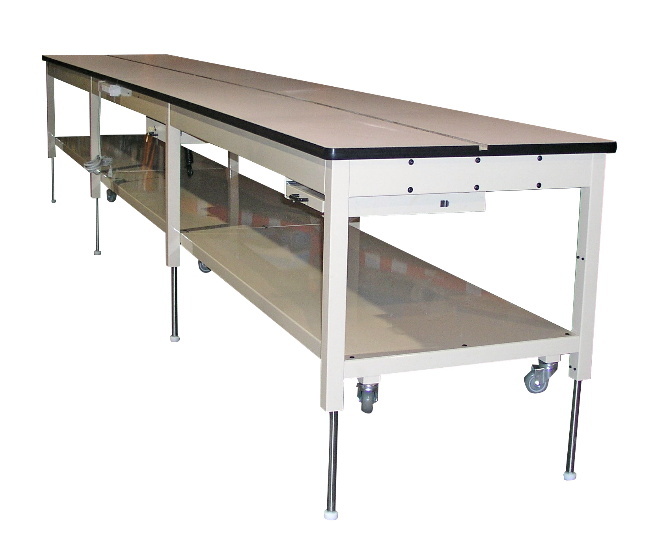 This lab bench is 60" x 30 x 30" with an epoxy resin work surface, the model HDL comes complete with PVC boots to protect the frame when you are cleaning your lab. This bench has been modified to include two 3" drawers built into the front rail of the bench. 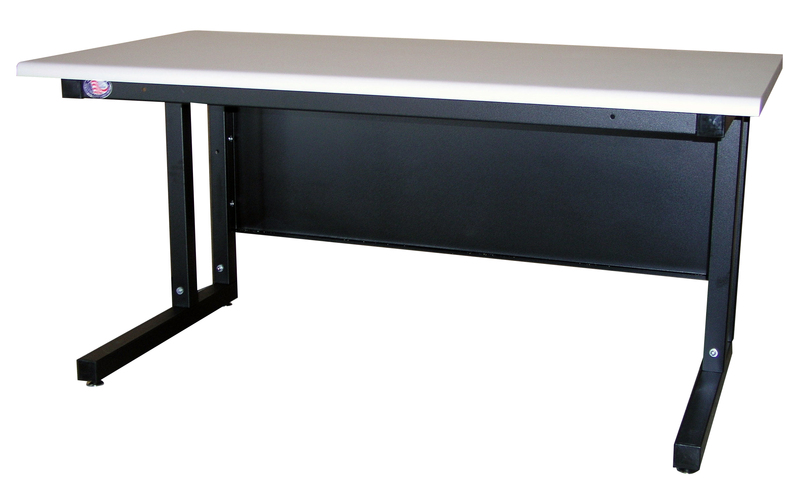 For this application we added our HDLE-6 pull pin height adjustable extenders to the our model HDL, this bench has also been outfitted with uprights, three adjustable shelves power supply and 6" modular drawer with black drawer face to match the black epoxy resin surface. 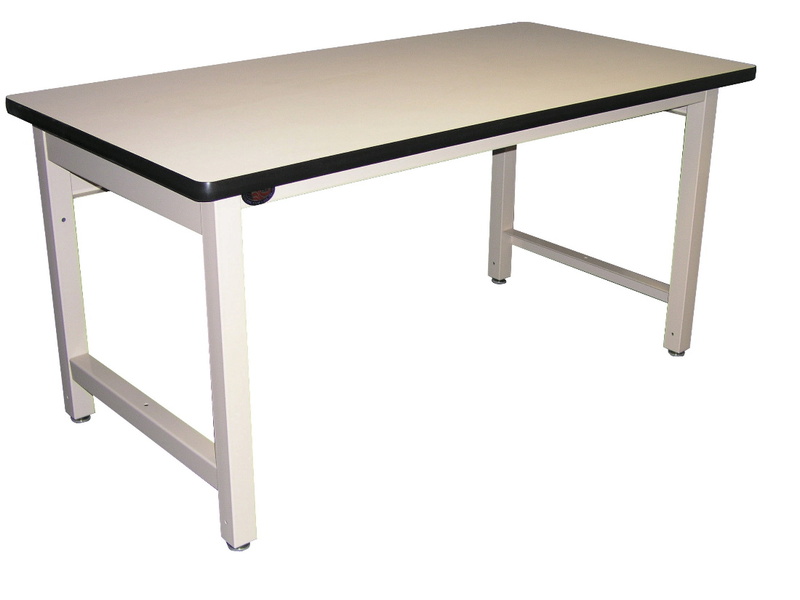 This model HD work bench has been set for us in a warehouse, it is 30" long x 30" deep x 42" over all height with casters. Featuring a full depth shelf, CPU holder, two under surface storage cubbies, surface mount upright bracket, 18" upright and a flat screen monitor arm. This bench has a galvanized steel surface and total lock casters. 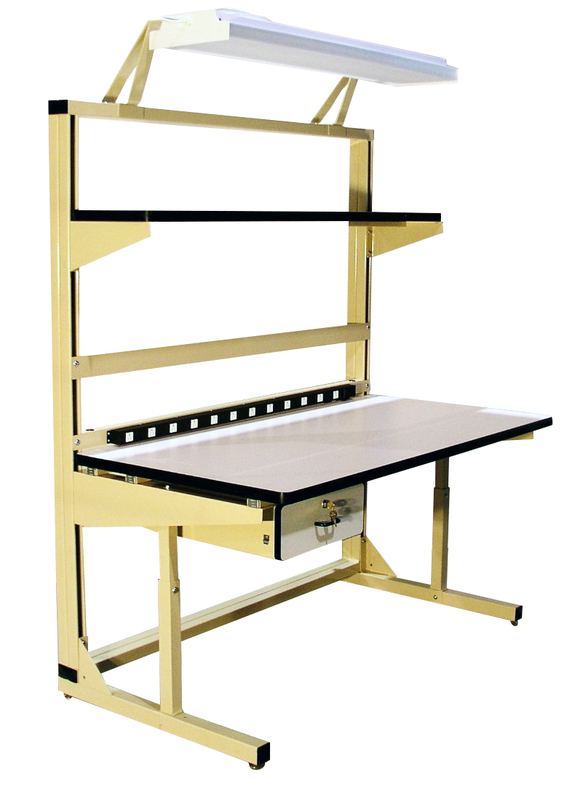 This 60" x 36" Ergoline work bench has been outfitted with our ET-1 electric tilt with 60 degree 600 pound capacity tilt, MDS6 6" drawer and a set of total lock casters. 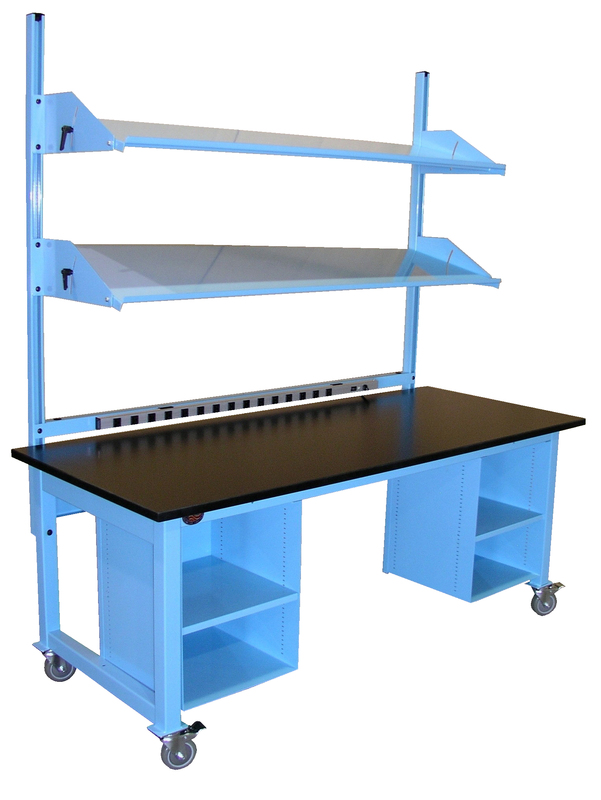 Showing the flexibility of the Model HD this bench features, casters, full width lower shelf, 18" x 18" dividers, uprights, metal cantilever shelve with 12" x 18" dividers and a flat screen monitor arm. Let us help you configure a model HD to meet your requirement. 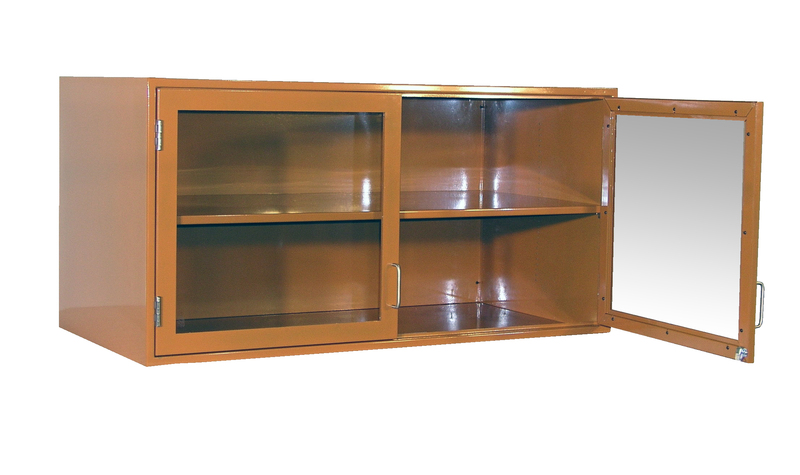 We offer hanging wall cabinets in our Hatfield Laboratory Furniture Line. This photograph shows a double glass swing door cabinet painted burnt orange. Proline can match any color you need. Built on our MVSII series height adjustable work bench this photograph shows the inside of the down draft table with sound enclosure, power supply , special air quick disconnect, overhead light and a down draft section built into the work surfaces. These options can be added to any of our models. We have lifted the fiberglass grid to see the duct work mounted under the surface. We also offer perforated stainless steel grids and HDPE grids. Duct runs from work surface to an 8" output ready for your in house exhaust system. 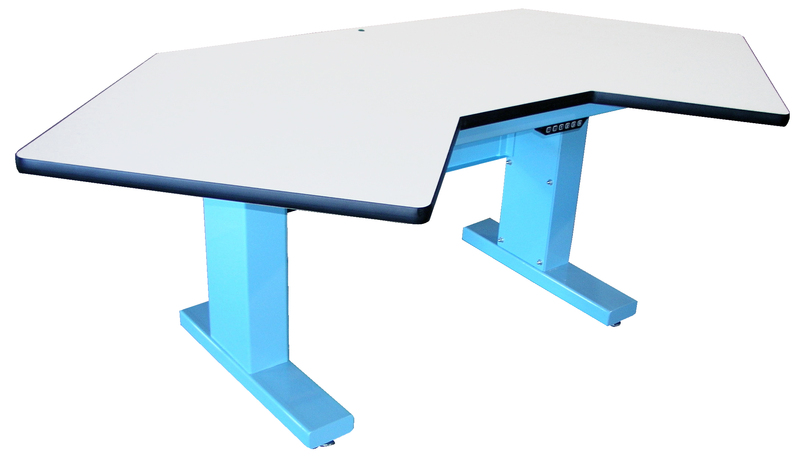 Easily adjust and tilt the work surface to meet your requirement. Price includes leveling feet and front lip. The Drop down gate allows the stop to be raised and lowered with out tools. "J" style notch allows you to lift gate slide forward and drop below surface. Ideal for retractable ball transfer and fixed ball transfer applications. Shown with optional solid maple work surface, steel drawer and casters. Lock up valuable tools and equipment and keep areas clean from clutter. 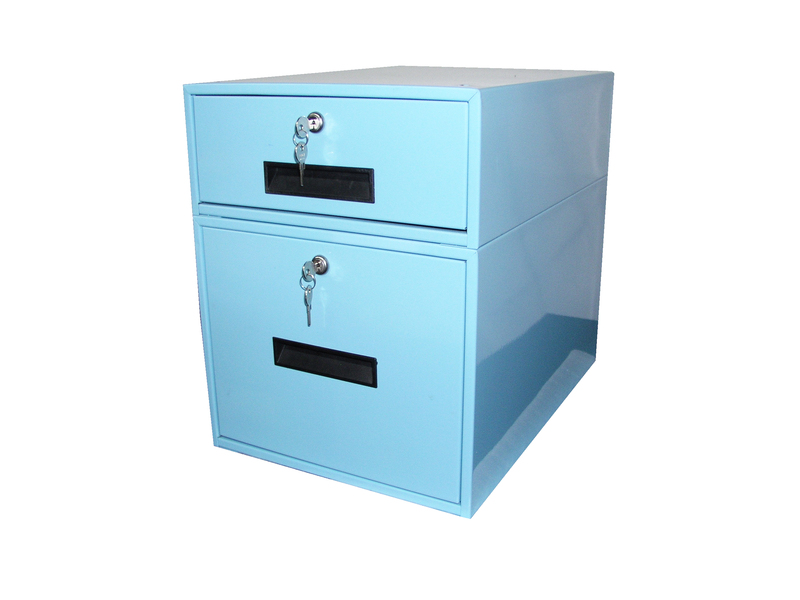 Steel inner and outer drawers with recessed handles. Like our modular drawer system, drawers can be stacked together. Economy Cabinets 18" wide with three 8" drawers, the lay out below also uses a 12" filler panel in the front and a 48" x 30" epoxy resin work surface and bolt on cabinet base. Cabinets with sliding door and sink. Two economy cabinets with three 8" drawers, one sink base with sink and sliding door cabinet. 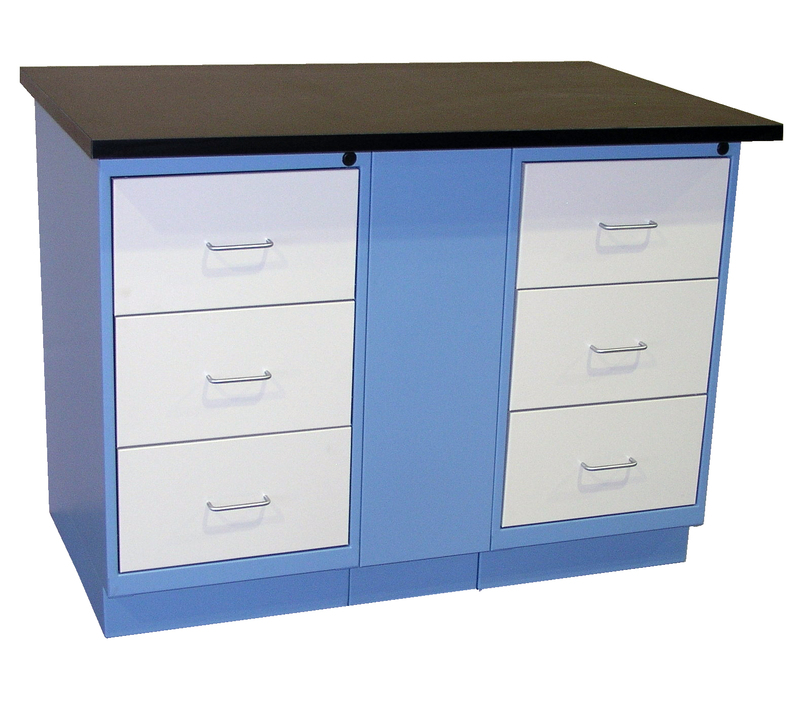 Two base cabinets with three 8" drawers, epoxy resin work surfaces and two sliding cabinets. This bench was painted to match a customers corporate colors. 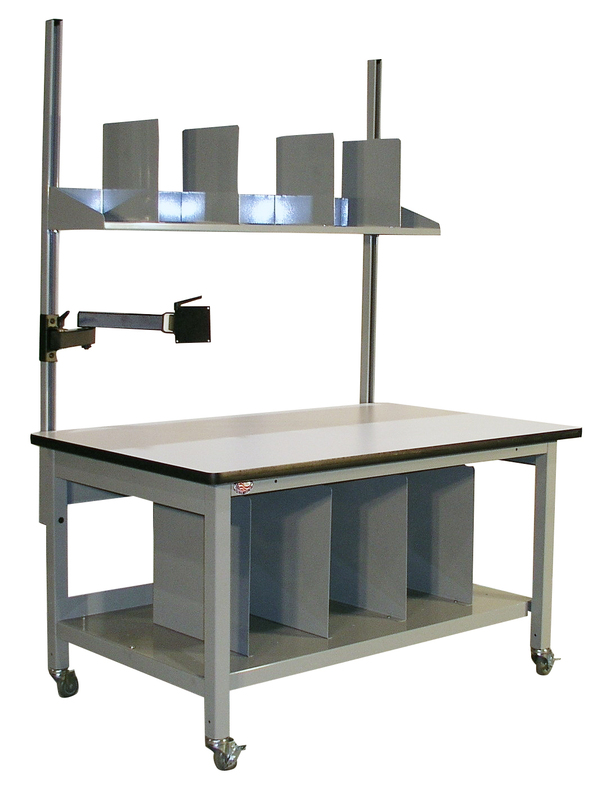 This bench was outfitted with 6" and 12" drawer, pull out keyboard tray, uprights , power supply, bin holder, cantilever shelf, overhead light and tool suspension frame. this bench is shown with split uprights cantilever shelf and overhead light. 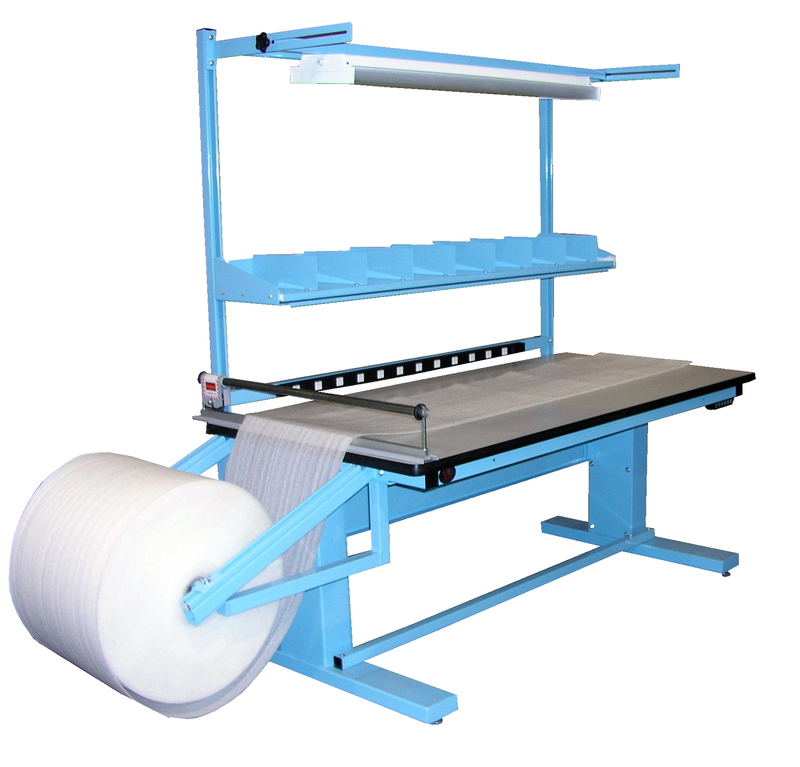 Heavy Duty Ergoline for packaging application. 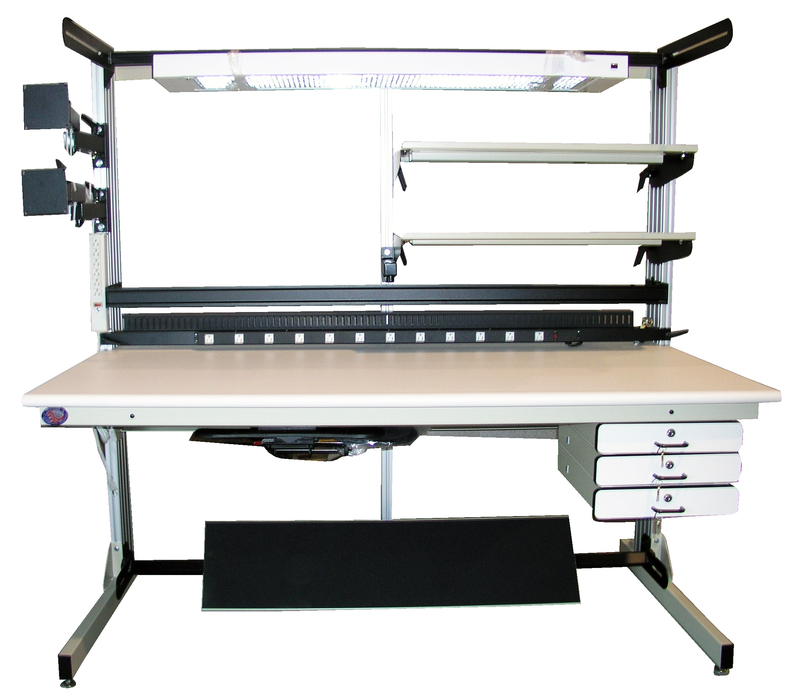 60" x 30" hand crank height adjustable work bench with lower shelf with dividers, paper spool holder, flat screen monitor arm with drop down keyboard tray, 14" x 14" articulating tray, over head light and 18" x 60" long cubby. 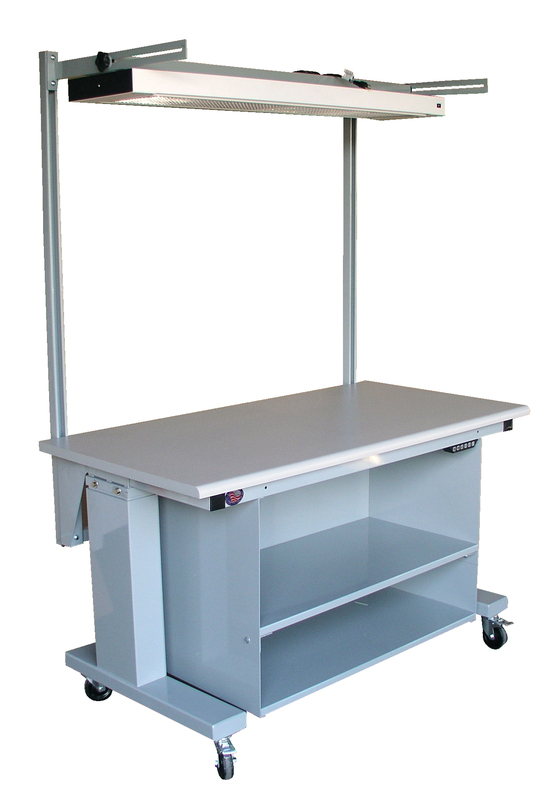 Mobile electric height adjustable bench with stainless steel work bench. 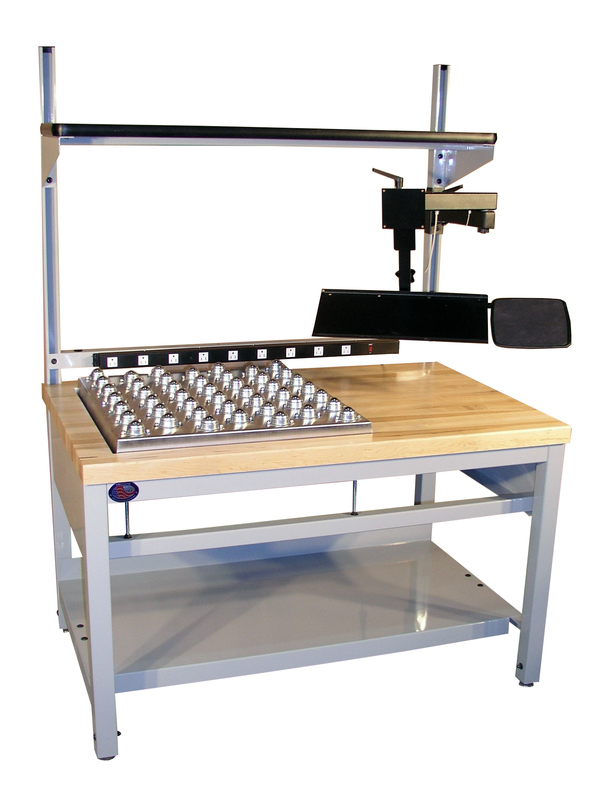 Manual Retractable Ball Transfer Bench with tilt. 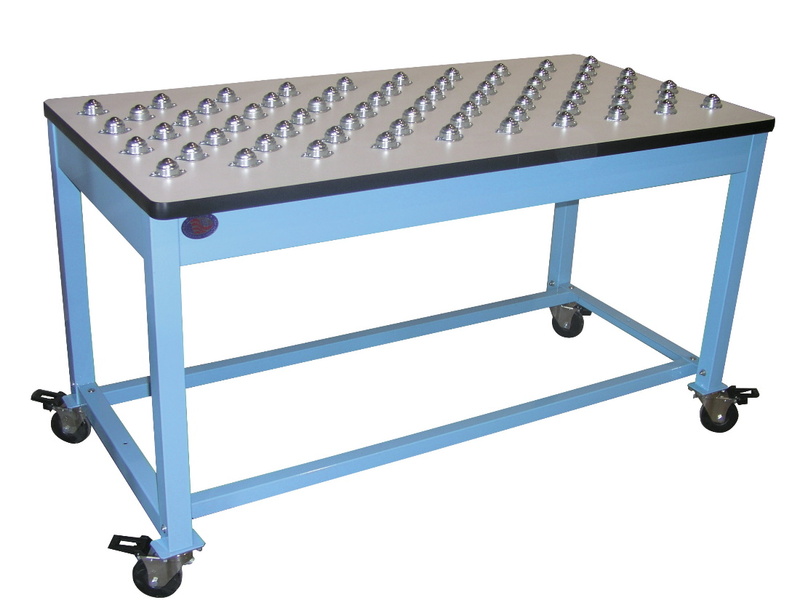 Solid Maple work surface manual retractable ball transfer table with two levers to operate each side capable of lifting 500 pounds on each side, also featuring a dual 1,200 pound capacity tilt. 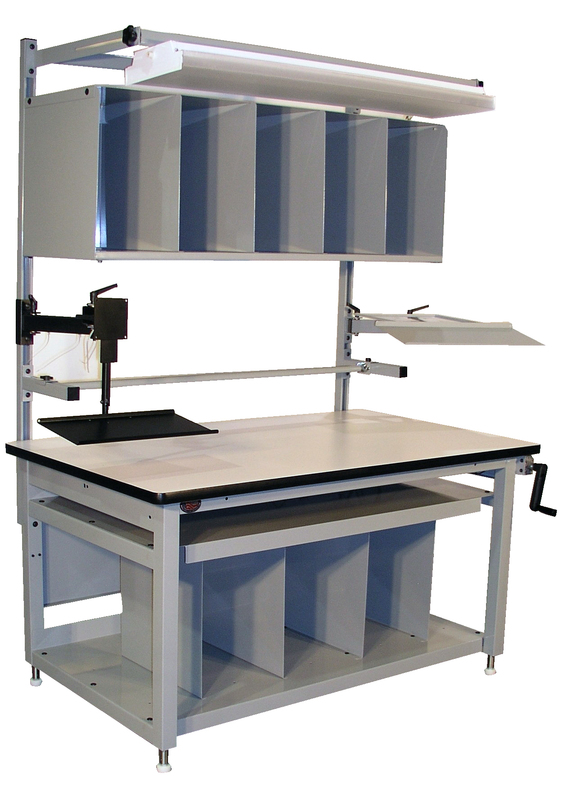 72" x 30" Electric Height Adjustable Work Bench with a Stainless Steel work surface with two down draft sections, CPU holder, split upright, two adjustable metal shelves and overhead light. 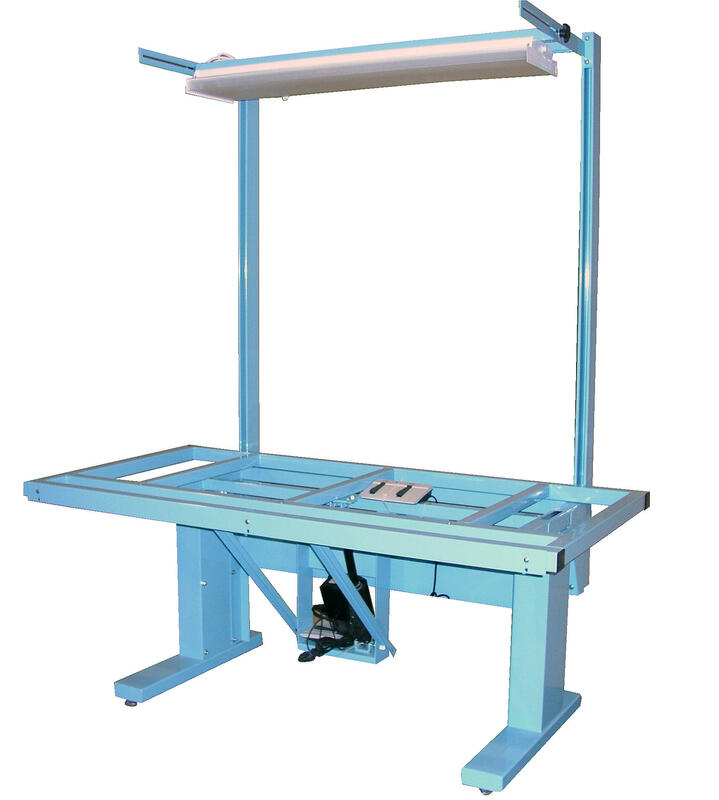 48" x 36" Electric Hydraulic work bench with tilt. 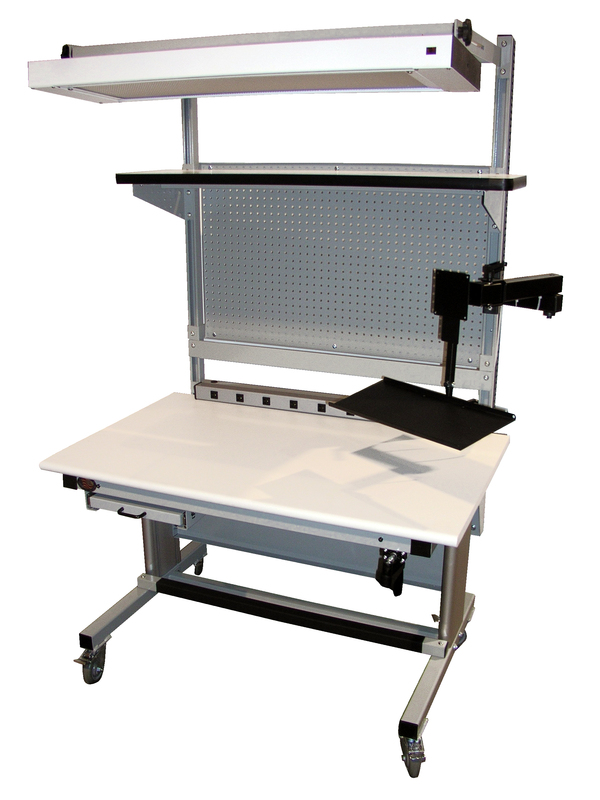 This unit shown is a 48" x 36" heavy duty electric height adjustable work bench with dual motor electric tilt. shown here with work surface set flat. 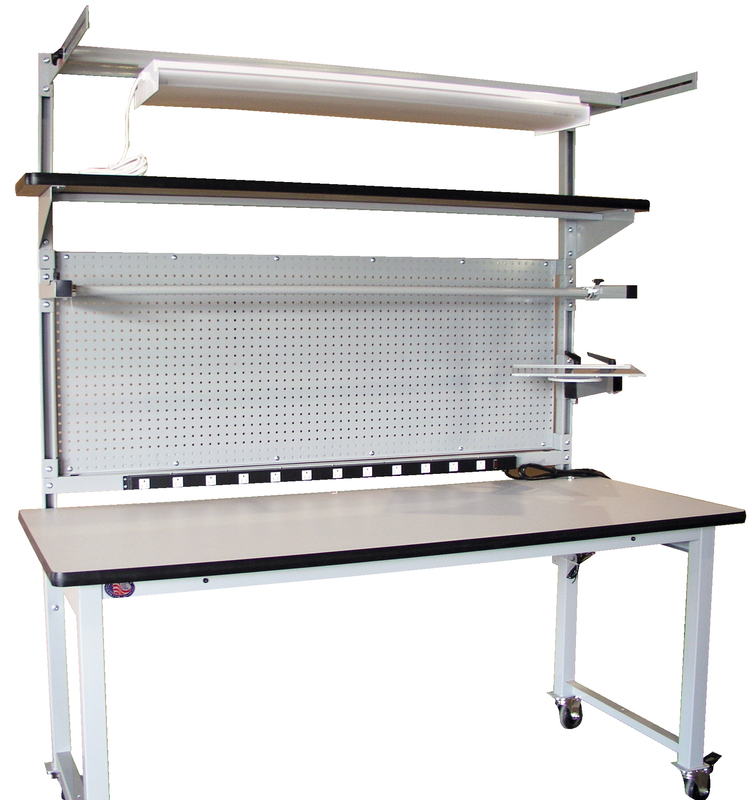 Basics Model 60" x 30" with Steel Pegboard, adjustable metal shelf, power supply and a 90 degree rolled front edge work surface. 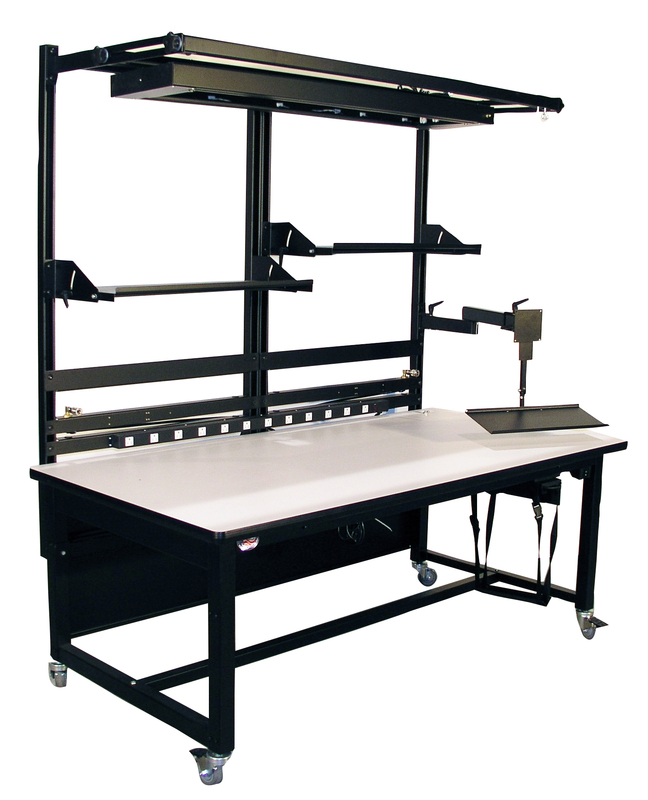 This work bench incorporates our welding table with the 1/4 " thick unpainted work surface and our electric hydraulic lifting system, allowing the work surface to adjust from 30" to 42" with 750 pounds capacity. Using our modular design it can be outfitted with optional accessories. Model HD with one shelf. Not all work benches need 60" uprights and all the bells and whistles. 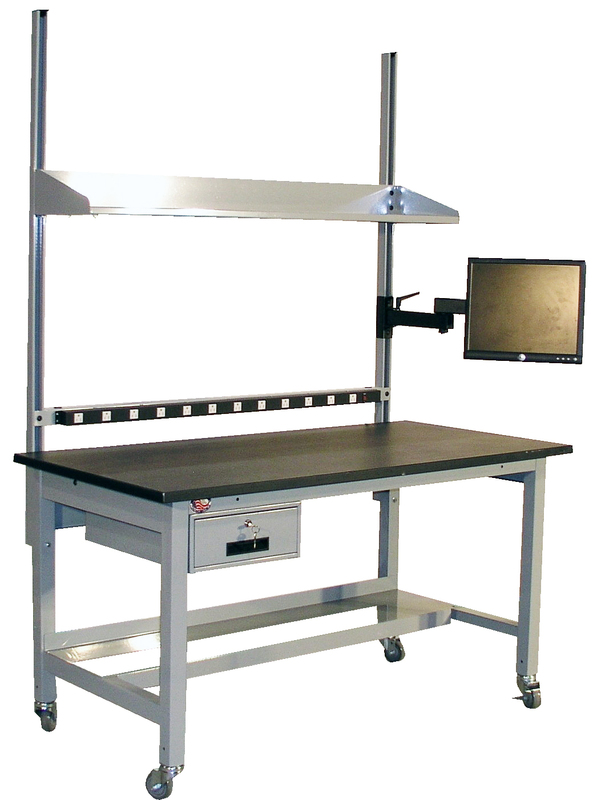 This photograph shows a our model HD with one above surface shelf, lower shelf and drawer and ESD ground kit. Our modular design allows you to configure for your application. 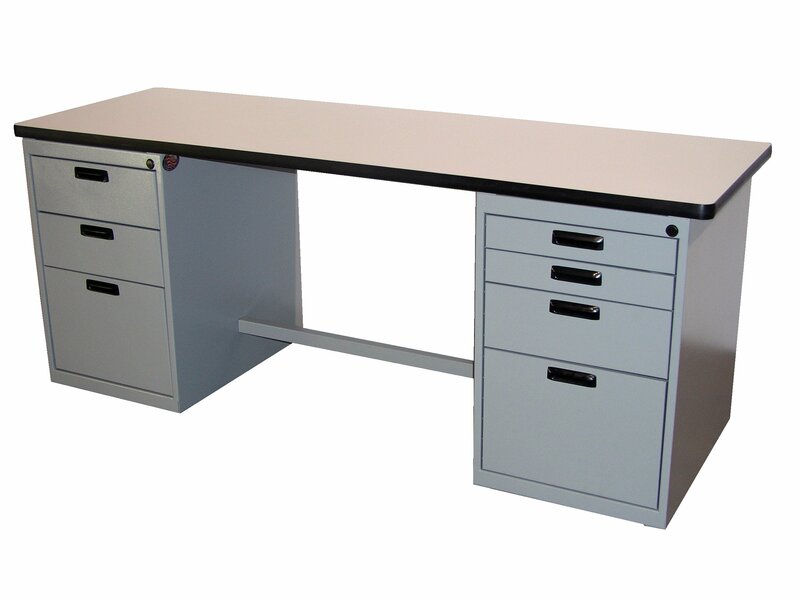 We also offer our Dimension Next series work benches with split upright. 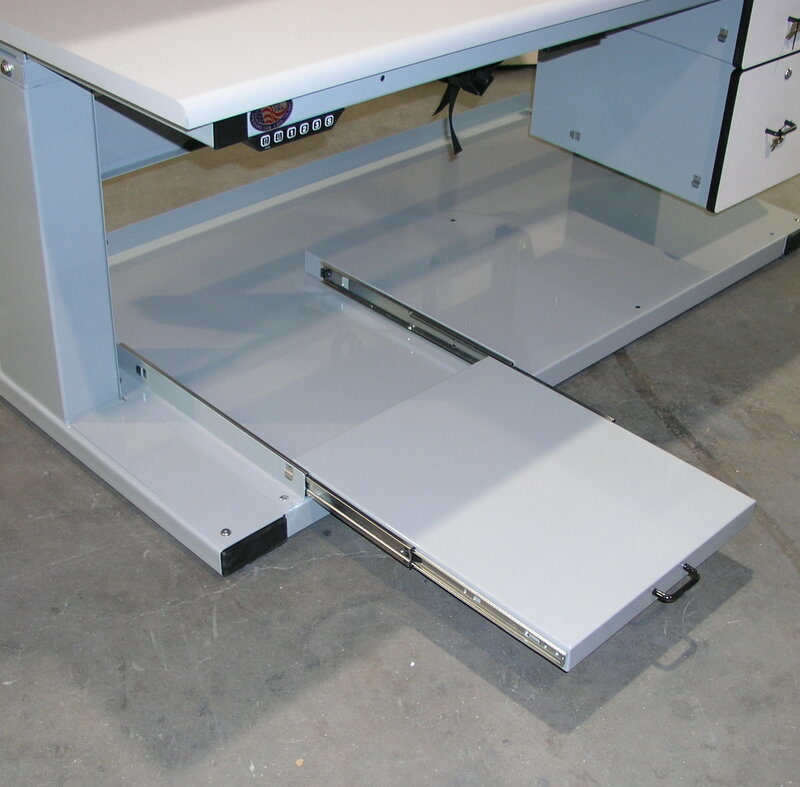 Allowing you to configure each side of the work bench with required accessories. 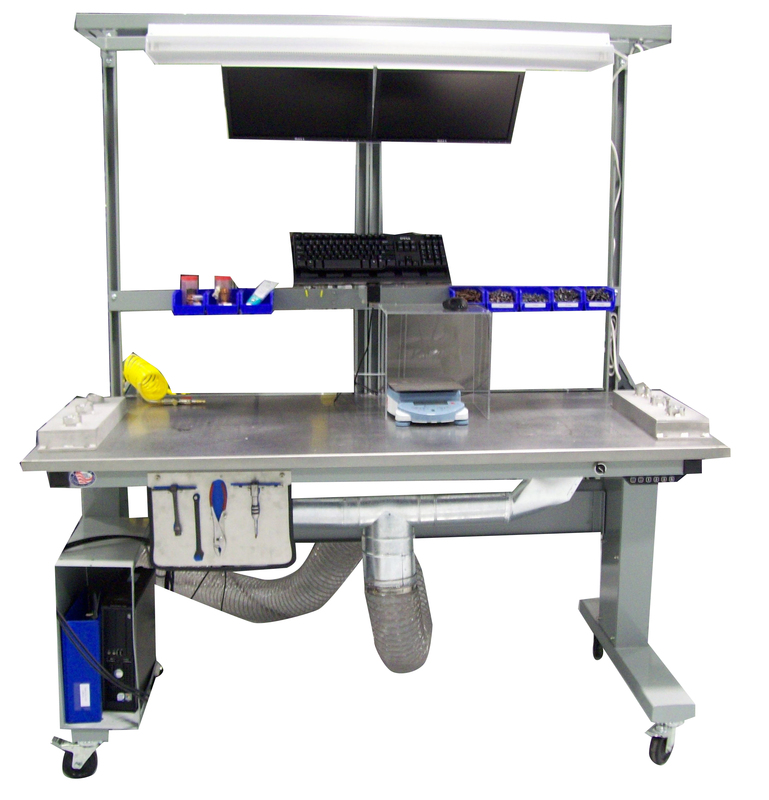 This work bench features 4" x 4" wire management trough, power supply, multiple monitor arms, keyboard tray, drawers and footrest. This photo shows our Model HD with center mounted uprights with cantilever shelving on either side. The work surface is notched on either end so the upright sits flush with work surface. The uprights are on our standard centers to accept standard options. This photograph shows the flexibility of Flexline system. 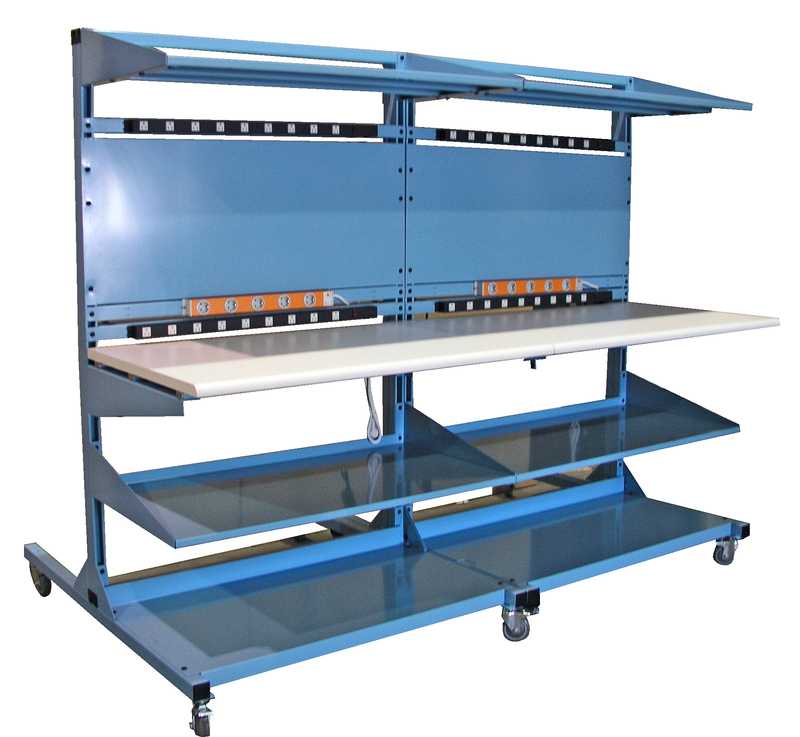 This bench was set up for a burn in operation, outfitted with both 120 volt and 240 volt power supplies, steel panels allows prints to be mounted with magnets, lower shelves allow for storage of CPU's and other items. Model CHD Textured Black with rolled edge surface. Model CHD Textured Black with rolled edge surface. Shown 60" long x 30" deep x 30" high with gray laminate work surface. 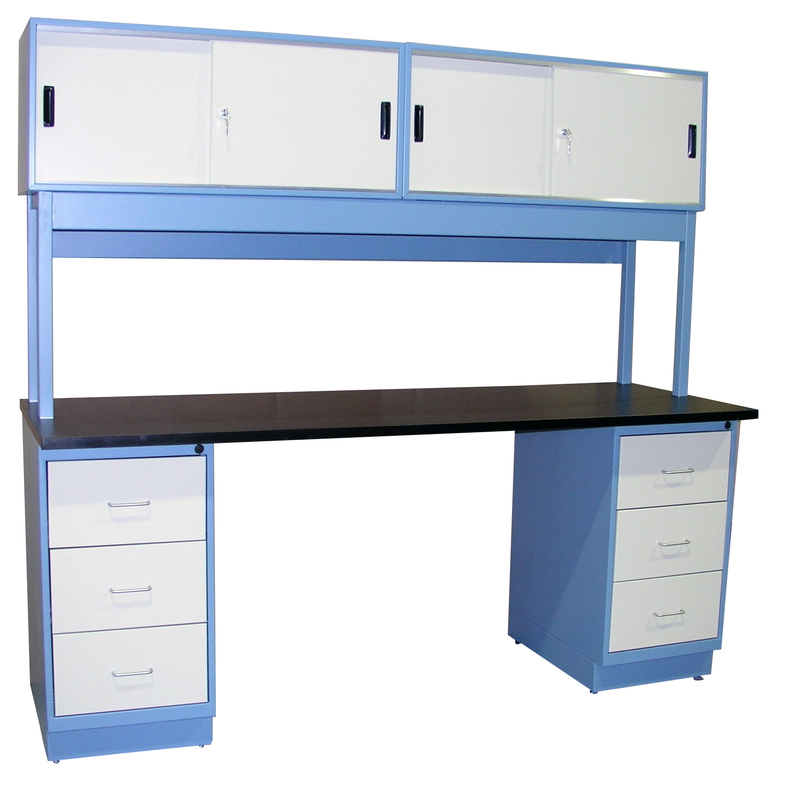 The standard basics series work benches include a 65" high upright. All under surface modular accessories will still mount to this unit. 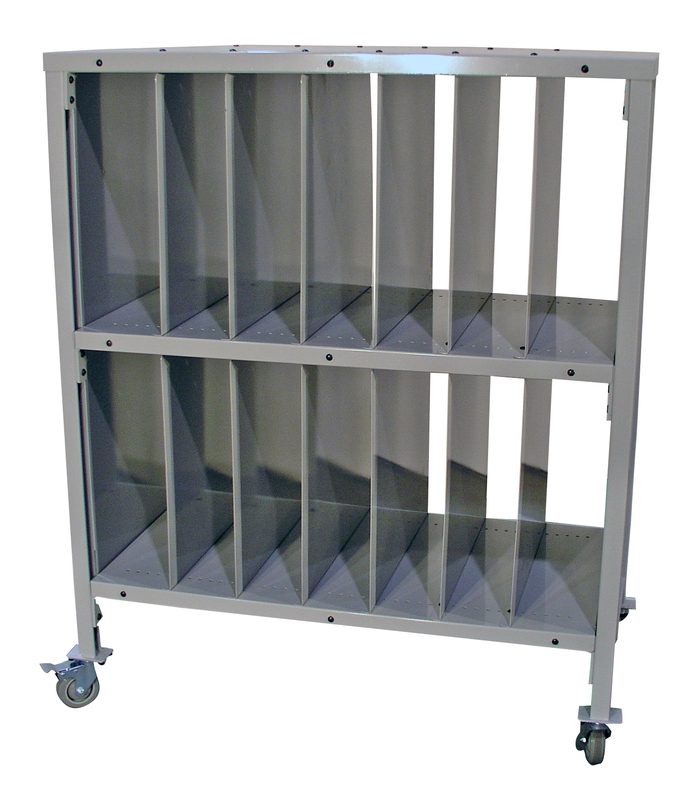 Articulating Document Holder with Steel Tray. 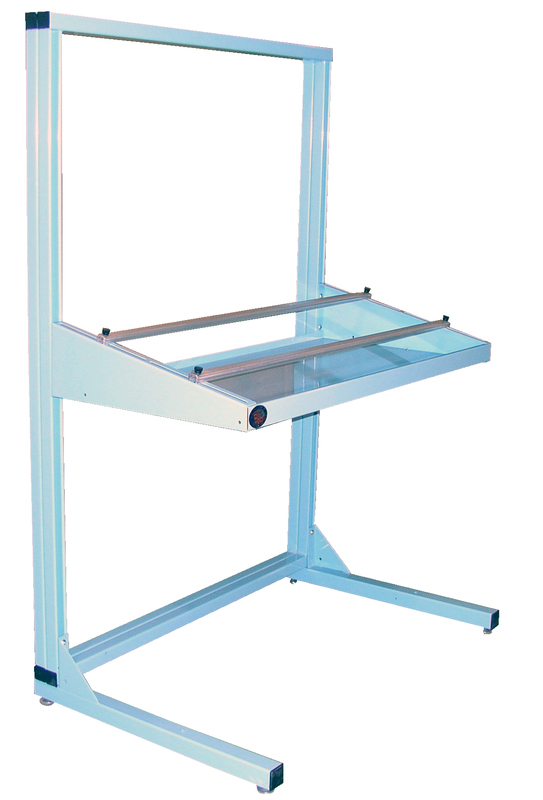 Articulating Document Holder with Steel Tray. 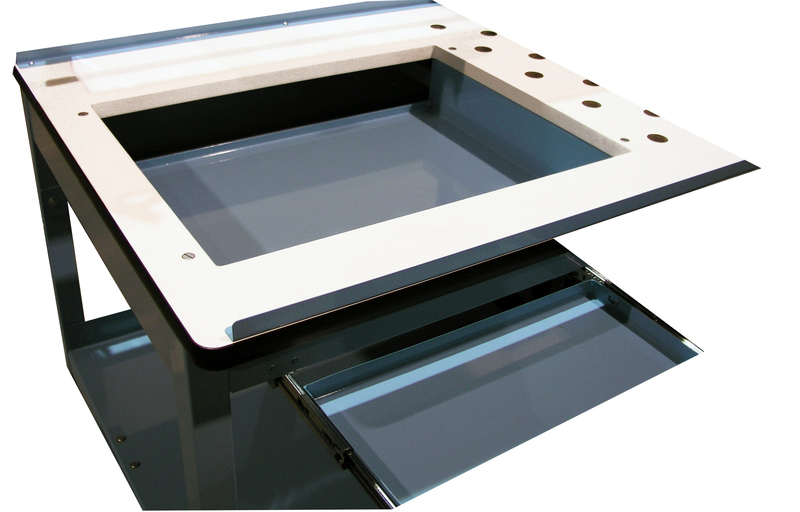 Painted steel tray with heavy duty arms, ideal for documents or Ipads. 2,000 pound weight capacity electric height adjustable bench. Shown with Maple Work Surface. 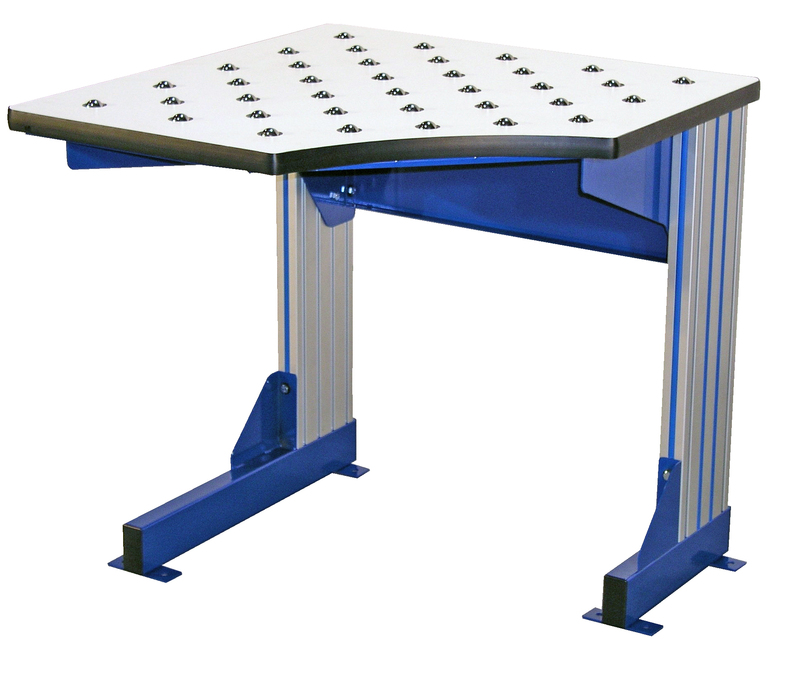 8 post electric height adjustable work bench. 72" x 30" available in other sizes. 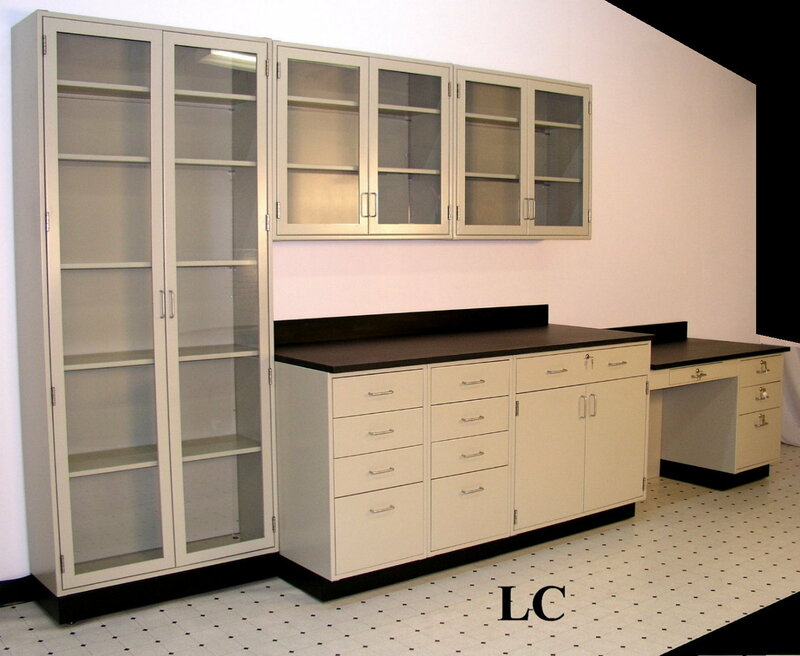 Part of our Hatfield Laboratory Furniture line, the picture shows a 48" wide double swing door cabinet with two 6" doors. 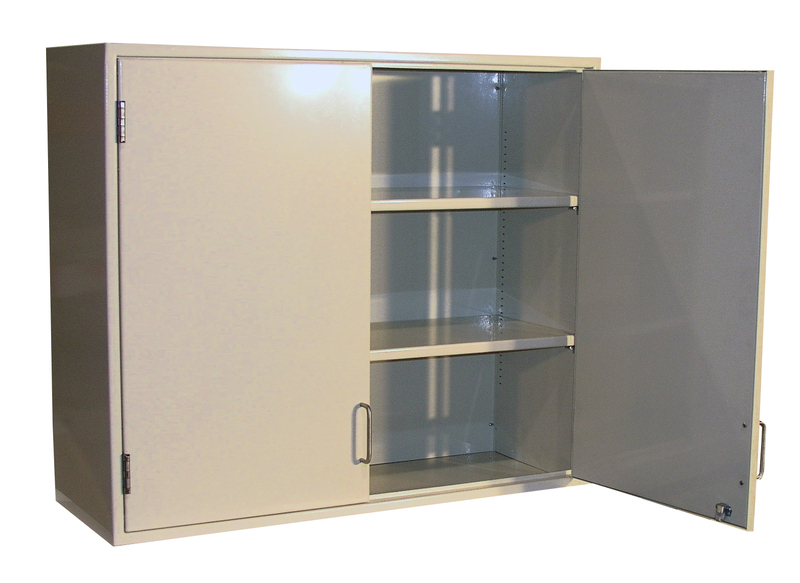 Doors and drawers come standard with sound deadening material and stainless steel hardware. Also included is a 60" x 30" Epoxy Resin surface. 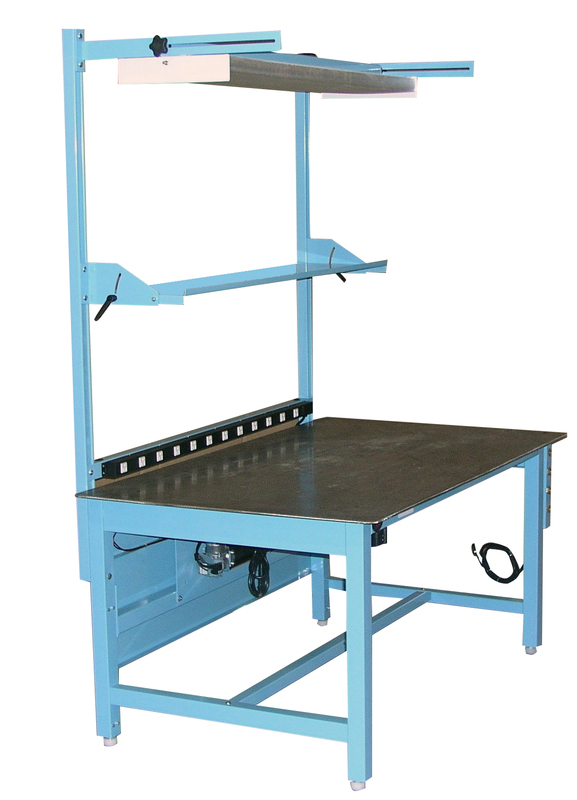 Built on our heavy duty Ergoline platform, this work bench is 14' long and 36" wide by using an 8 post electric hydraulic push button system it can lift over 2,000 pounds. Lower shelf adjusts with work surface to easily access stored items. By combining several model HD frames and supporting the seam of the work surfaces we were able to produce this 10' x 16' work bench with solid maple work surfaces. 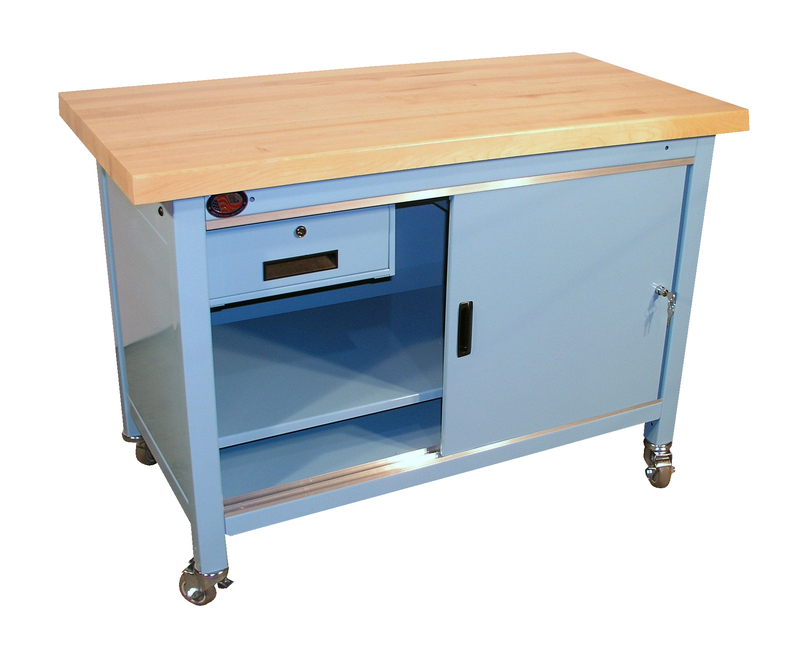 60" x 72" Mobile bench with our economy cabinets, solid maple work surfaces, mobile base with locking casters, 72" long cubby holes and pull trays in cabinet. 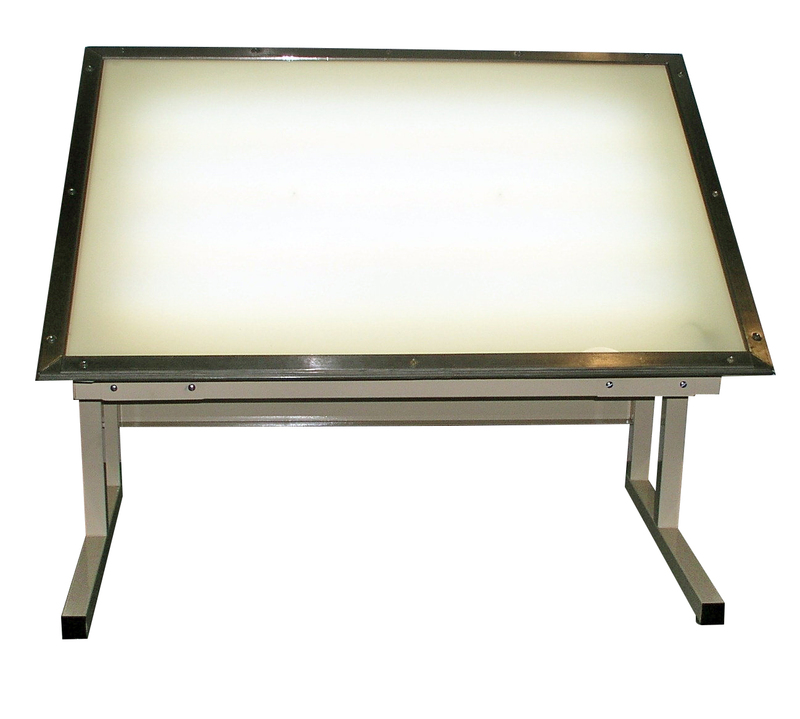 72" x 36" back light table with translucent cover, ideal for film inspection. 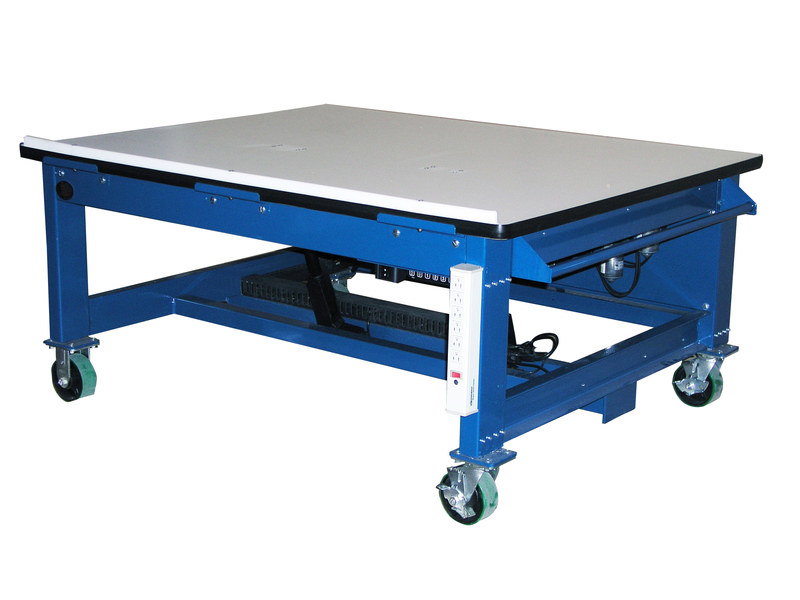 With Proline's Gravity Roller Conveyor Bench with optional electric height adjustment you can easily load and roll product across the surface, position on the retractable ball transfer and raise the height of the work surface to work at a comfortable height. Grinding Work Bench with Sound Enclosure. Grinding Work Bench with Sound Enclosure. Sound Enclosure comes with steel out shell and fire resistant sound absorbing material inside. Keep shop noise to acceptable levels. Shown on our Model HD 72" x 30" with a HDPE work surface. 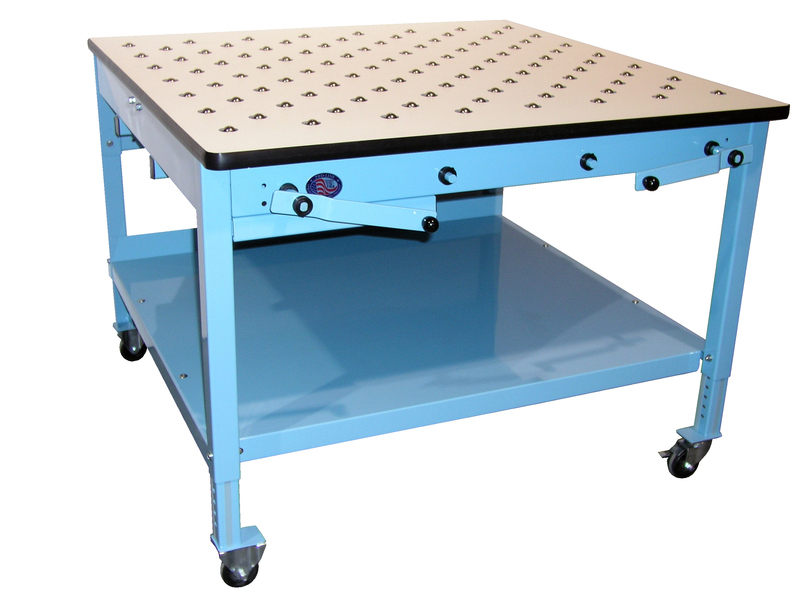 Electric Hydrualic Height Adjustable Welding Table with a 72" x 30" 1/4" thick unpainted steel work surface. Electric height adjustment from 30" to 42" high with the push of a button. Shown with optional above the work surface options. 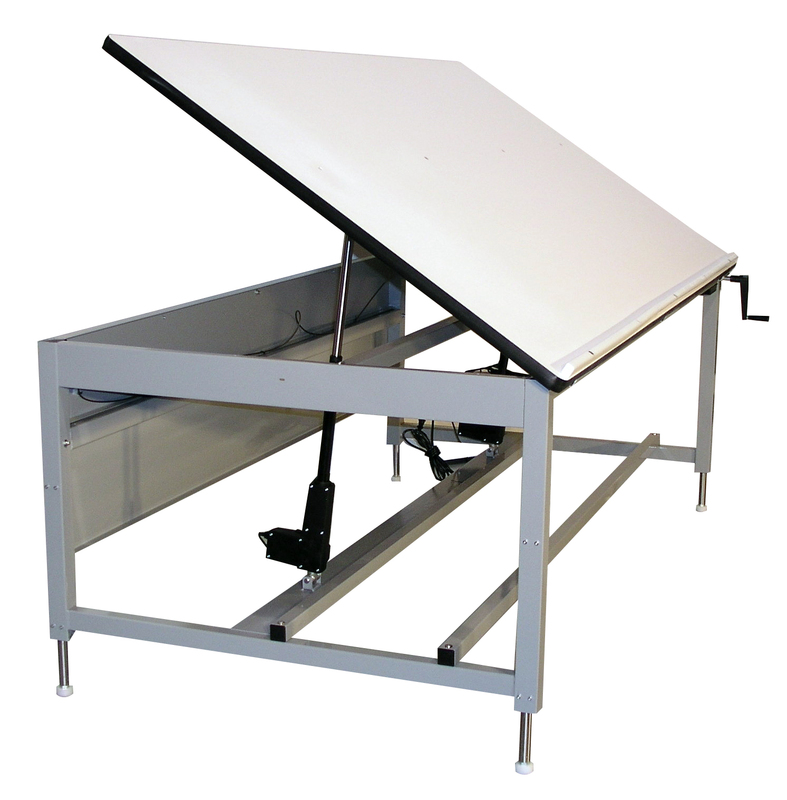 Belt Conveyor Work Bench with conveyor mounted in the front. 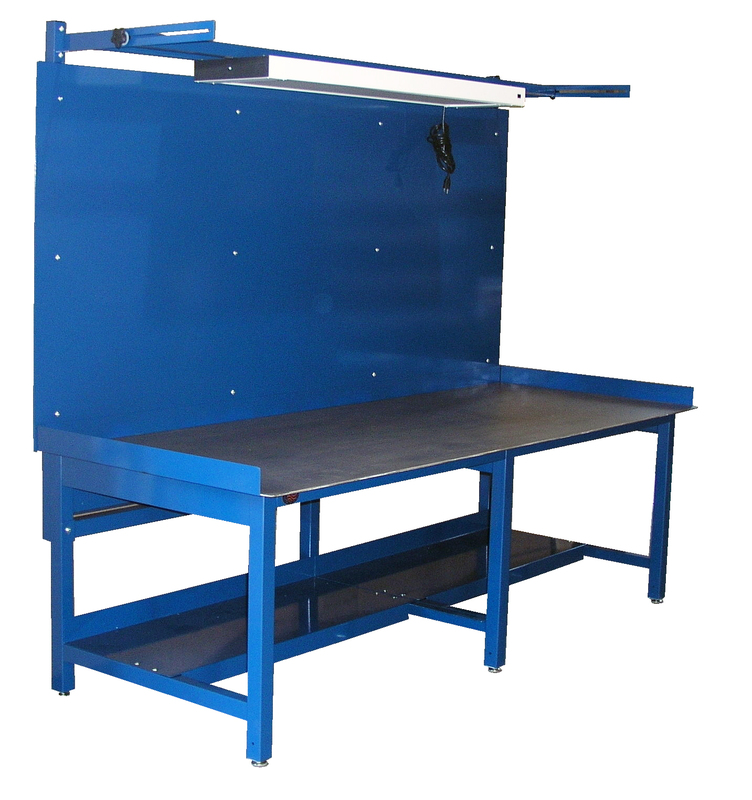 Belt Conveyor Work Bench with conveyor mounted in the front. 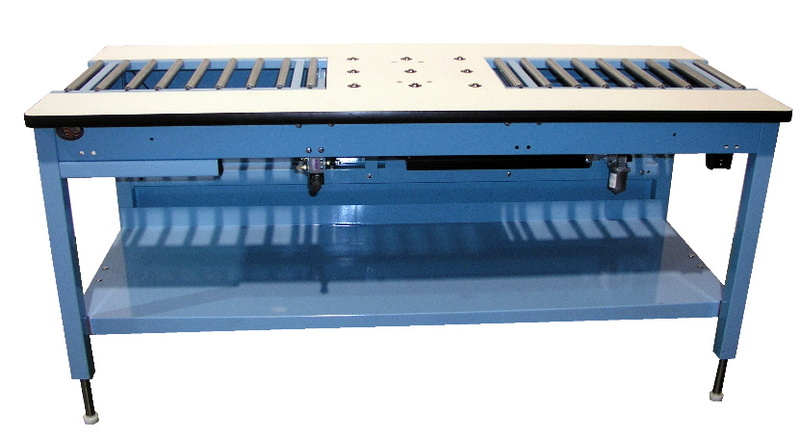 Used with small parts in progressive assembly applications, the front mounted belts makes it easy to reach small parts. 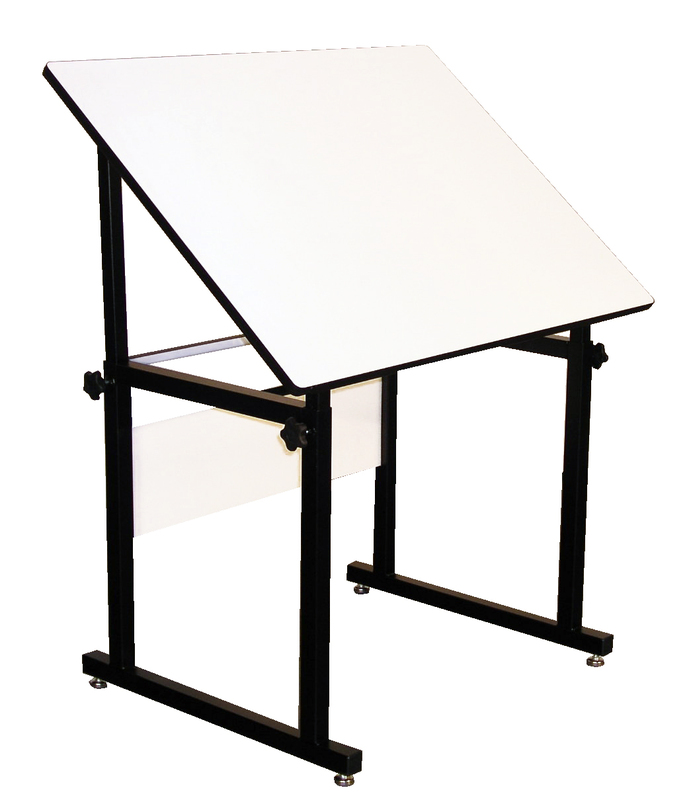 48" x 36" back light table with tilt. 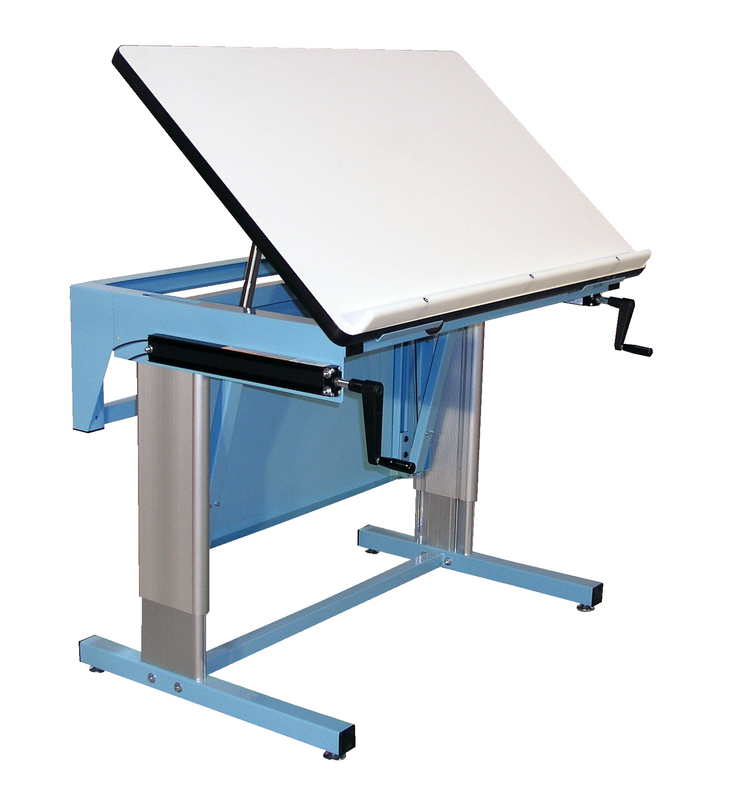 48" x 36" back light table with tilt. 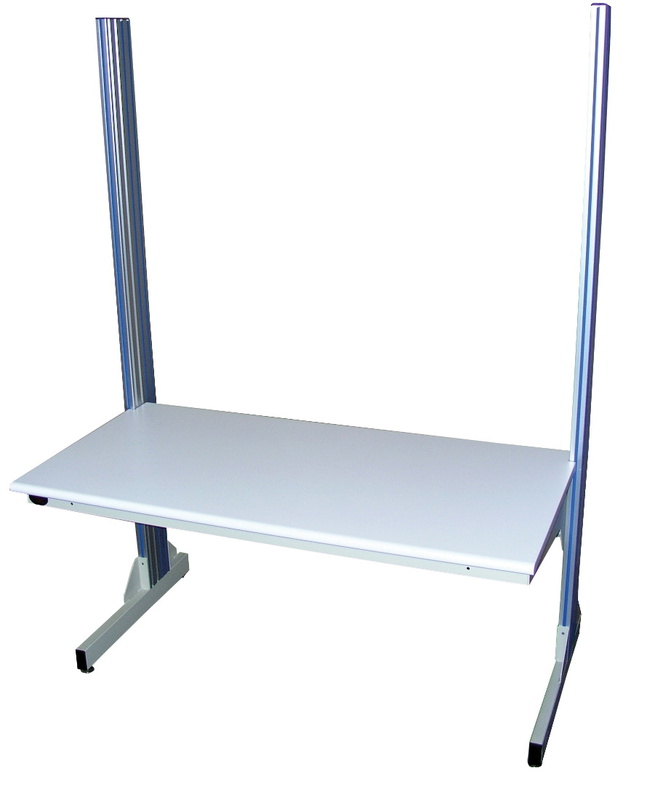 Avoid bending over and back sprain when using a back light table, surface tilts up to 30 degrees. Model HD with hanging economy cabinets. Model HD with hanging economy cabinets. With Proline's modular design you can easily mix and match our options to design the bench that meets your needs. 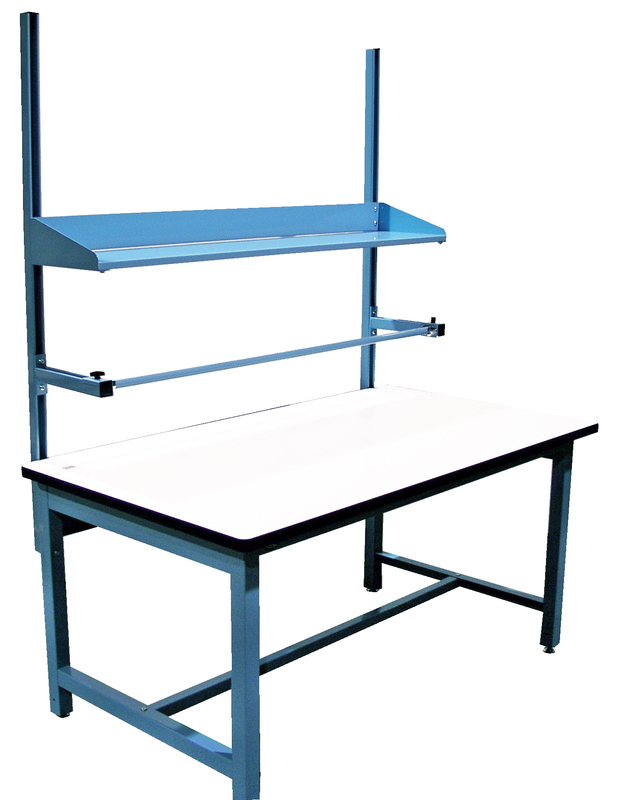 This model CHD work bench has been modified to roll over a conveyor line giving the operator a stable platform to work on when required and the ability to roll the station away when requiring access to the conveyor. Proline's corner unit can easily be modified to for any requirement, shown here with a Chem-Guard chemical resistant work surface "L" shaped cantilever shelving and over head lighting. Free Standing Computer Stand with lag plates and pull out shelf for CPU's. 18" deep x 24" wide x 42" high. Also available with a pull out keyboard tray. Console Work Bench this work bench was designed to have monitors and displays added in the field. Removable plates on angled housing allowed the installer to easily add components. Locking cabinets allow for CPU's to be secured. Modified Flow Racking , each lane has been divided by steel dividers allowing small items to stay in the correct lane as it is conveyed to the packager. A pick to light was added to the unit in the field so packager would kit the correct items. "L" Shaped work bench with small return. "L" Shaped work bench with small return. 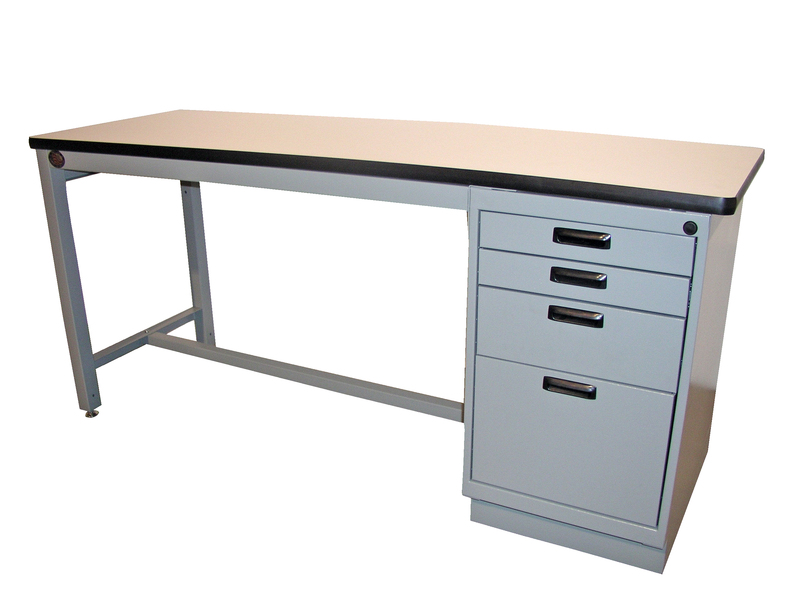 36" long x 24" deep work bench with a 12" x 18" return for additional work space. Shown with uprights, "L" shaped shelving and drawer. Heavy Duty Skate Wheel Flow Racking Modified to meet your requirement. 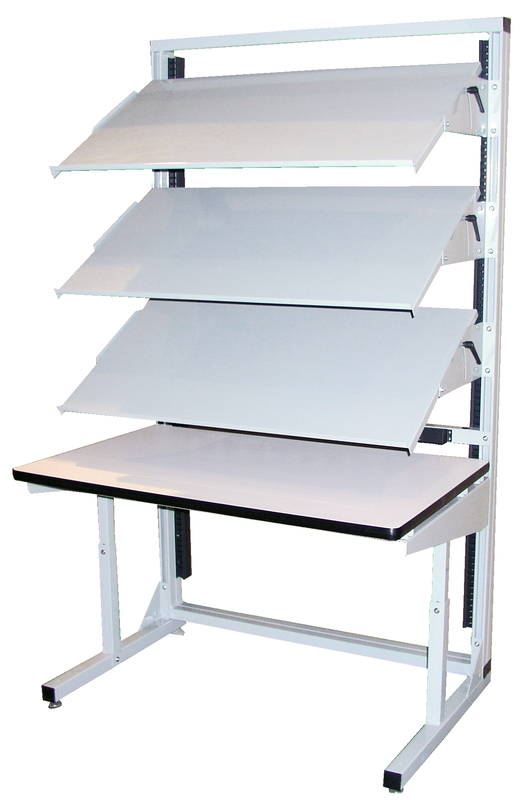 This Flow Rack unit is 36" wide x 36" deep x 36" high. Set up to meet the customers particular needs. Dual Sided Manual Wire Harness Work Bench. This unit is 72" long and 36" deep or 44" deep when folding front lips are opened. Unit tilts up to 60 degrees on either side, horizontal legs slides in and out to take up less room when not in use. Pull pin adjustment allows operator to set tilt at ergonomic position. 96" long manual wire harness bench. 96" long manual wire harness bench. 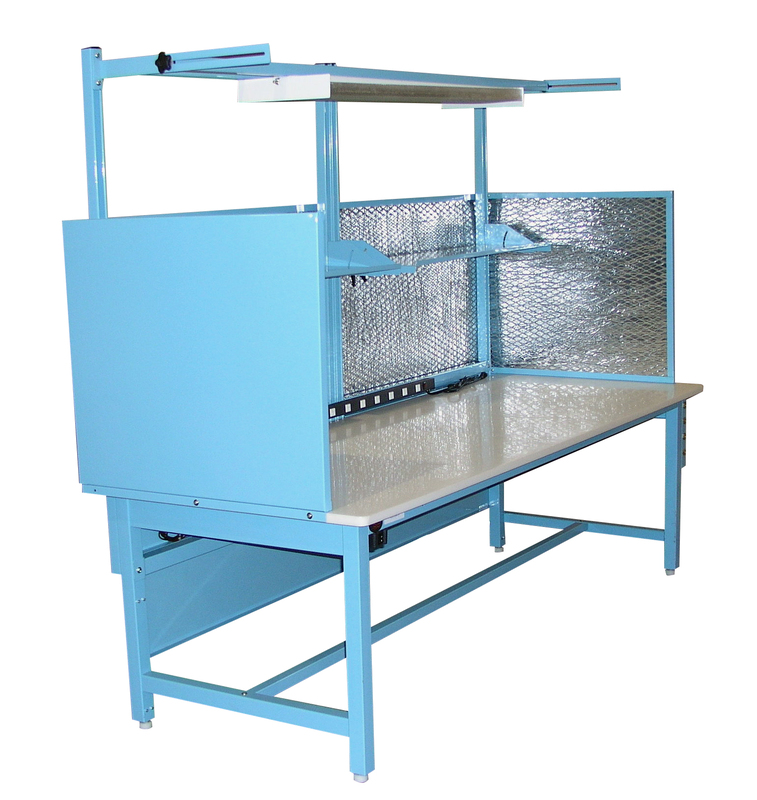 96" long x 36" deep wire harness bench with manual tilt , hand crank height adjustment and pivoting tool tray that stays level as the harness board tilts. 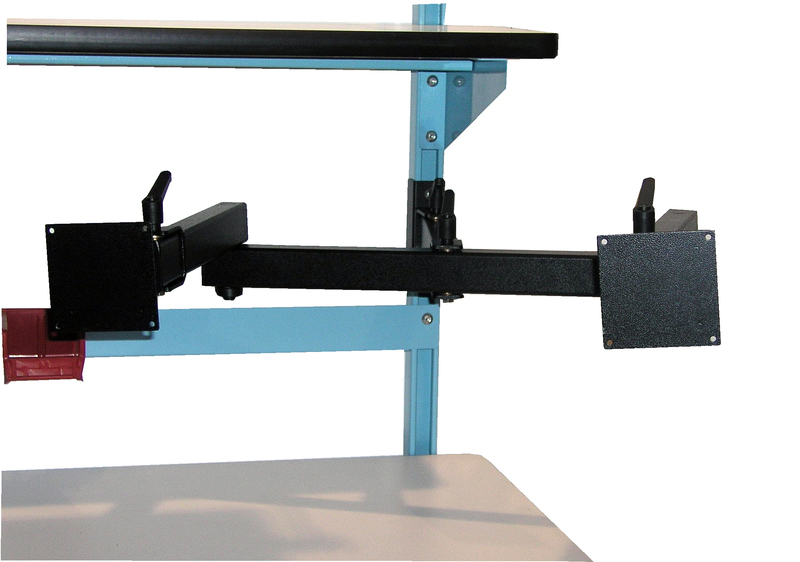 Double Flat Screen Monitor Arm, for operations that require two flat screen monitors at the same work bench. 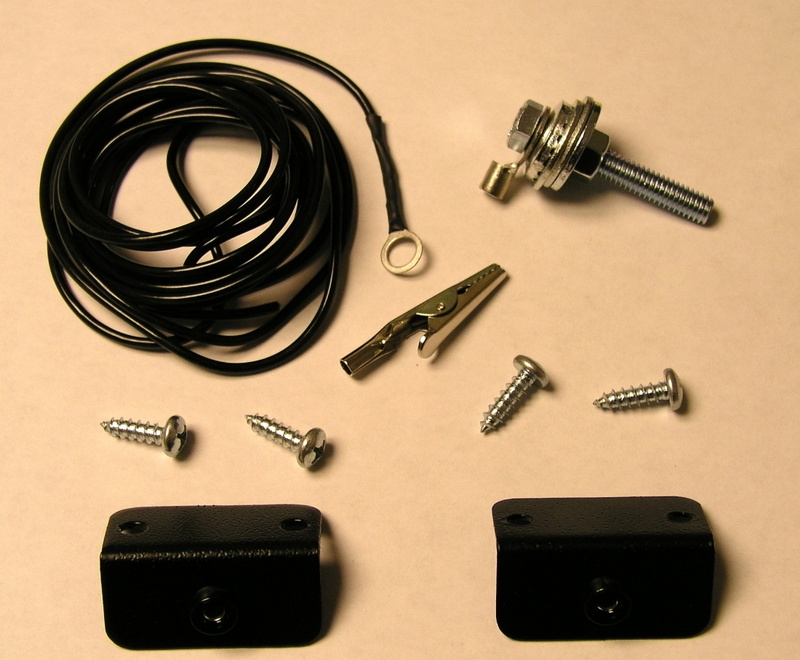 Our bolt on keyboard tray will mount to either or both arms. 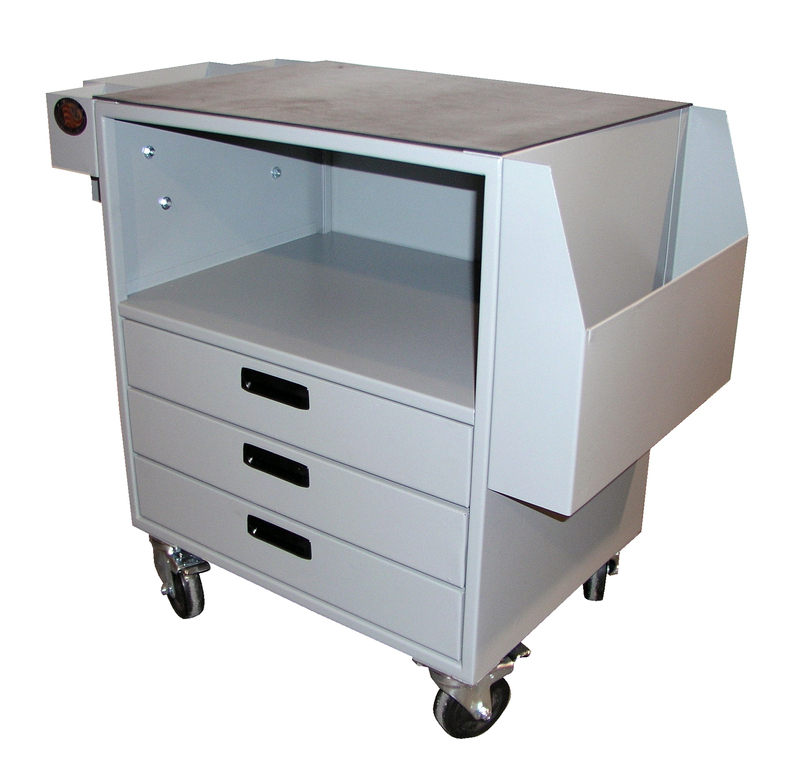 Mobile Sorter Bin with locking casters, lamanite work surface and adjustable shelves. Both sides of bench have sorter bins. 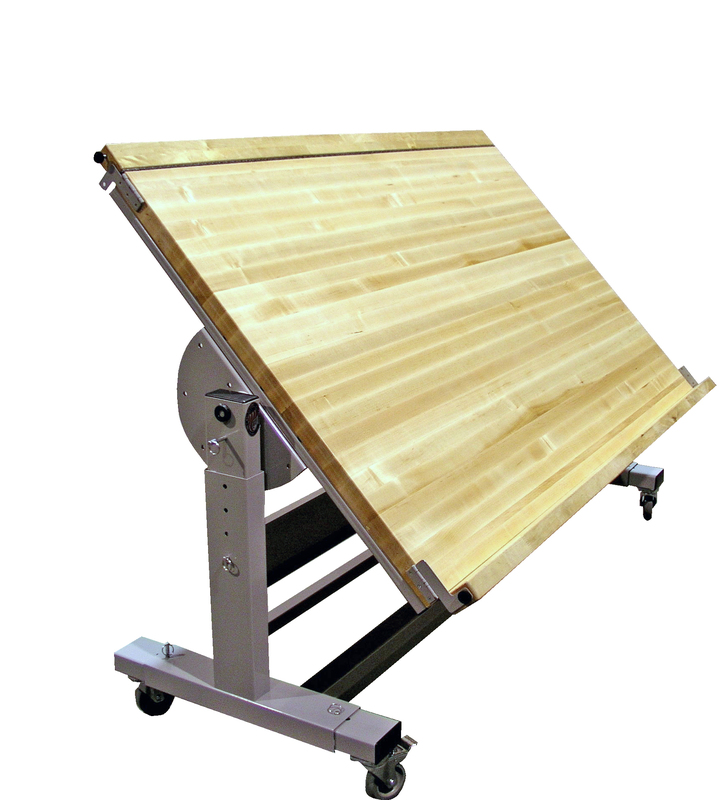 Height Adjustable Down Draft Table with Tilt. 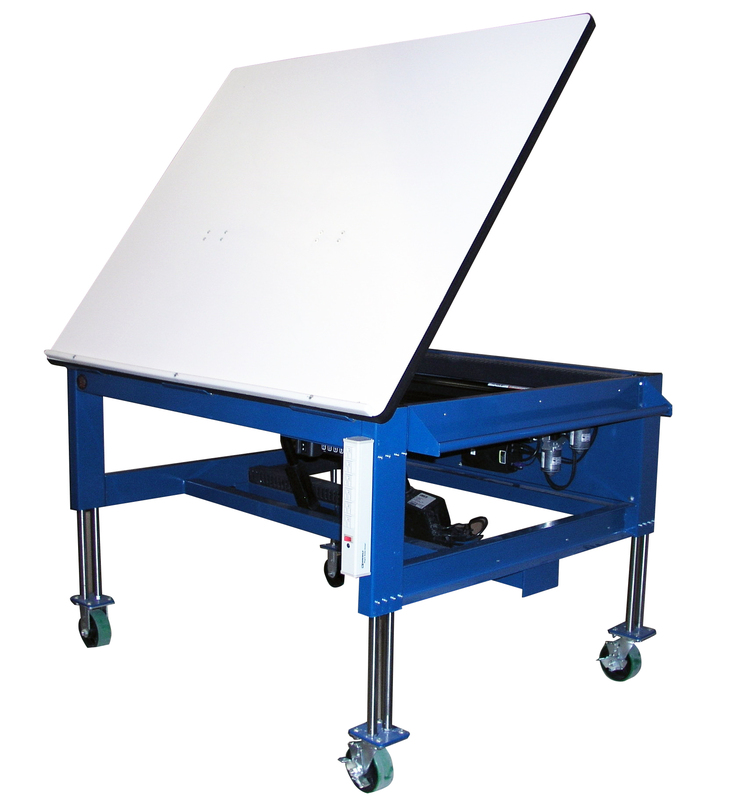 This Height Adjustable Down Draft Table with Tilt, features an HDPE surface to protect the product being worked on. The tilt and height adjustment options, brings the work to the worker. 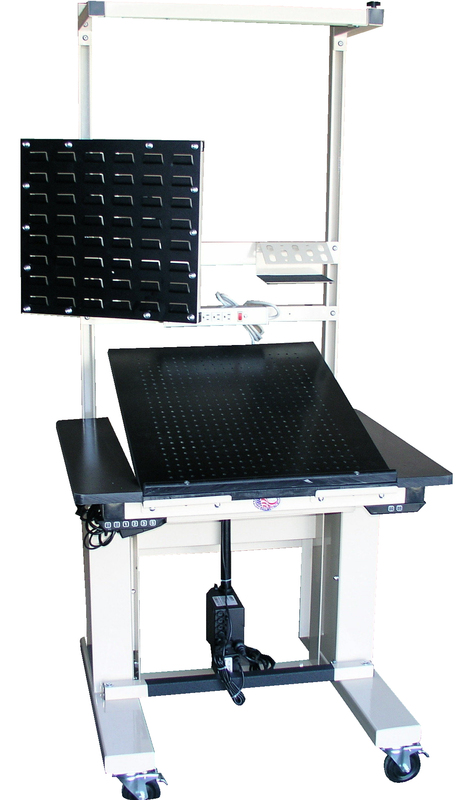 Mobile Retractable Ball Transfer Table with fixed legs and casters. With Proline's Mobile Retractable Ball Transfer Table with fixed legs and casters, transporting product throughout your plant is a breeze. 25 pounds of pressure on the handle raises 500 pounds on the transfers. Manual operation allows unit to go anywhere. 96" Long hand crank height adjustable retractable ball transfer. 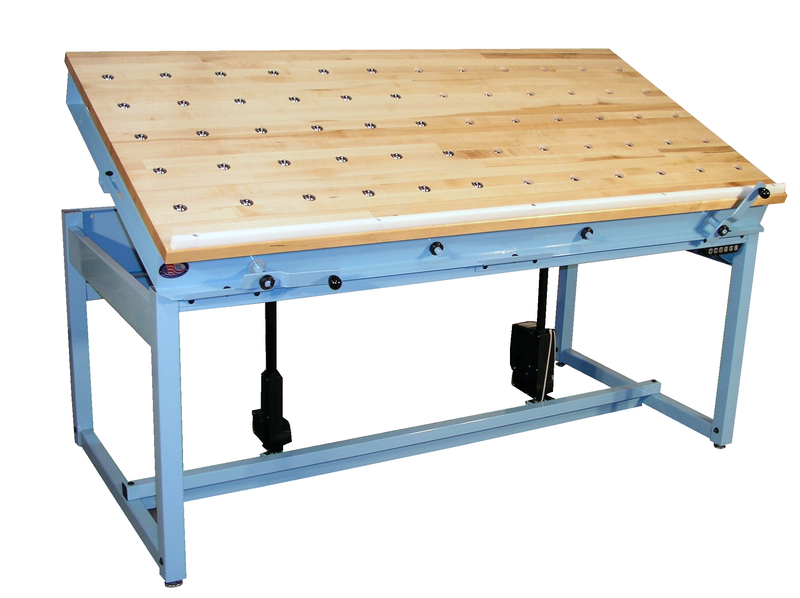 This work bench is a 96" Long hand crank height adjustable retractable ball transfer table, it features a 6 post design with pneumatic pop up ball transfers that raise .250" above surface and lower below the surface when not in use. Also shows split upright and shelf with dividers. 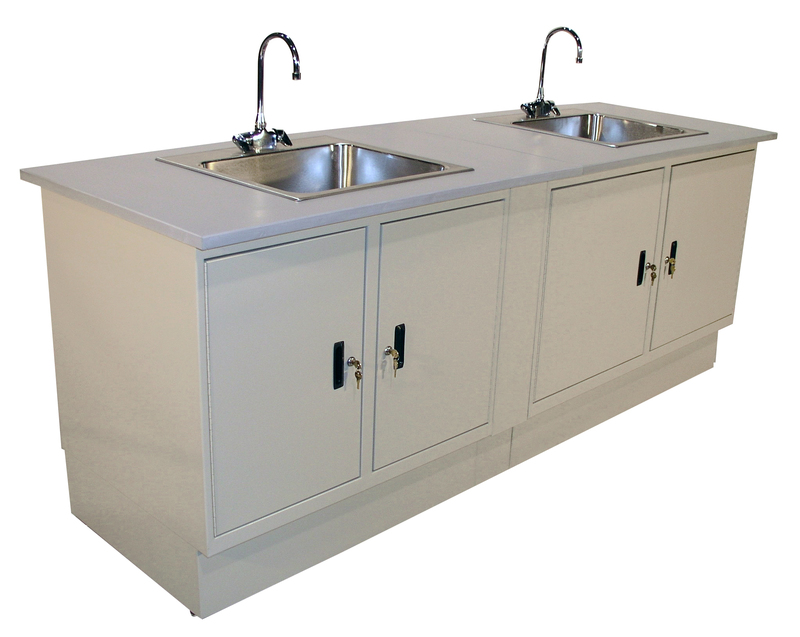 This photograph displays our lab casework with two stainless steel sinks and gray epoxy resin work surfaces, it is made up of two sink bases with removable back to access sink for plumbing. 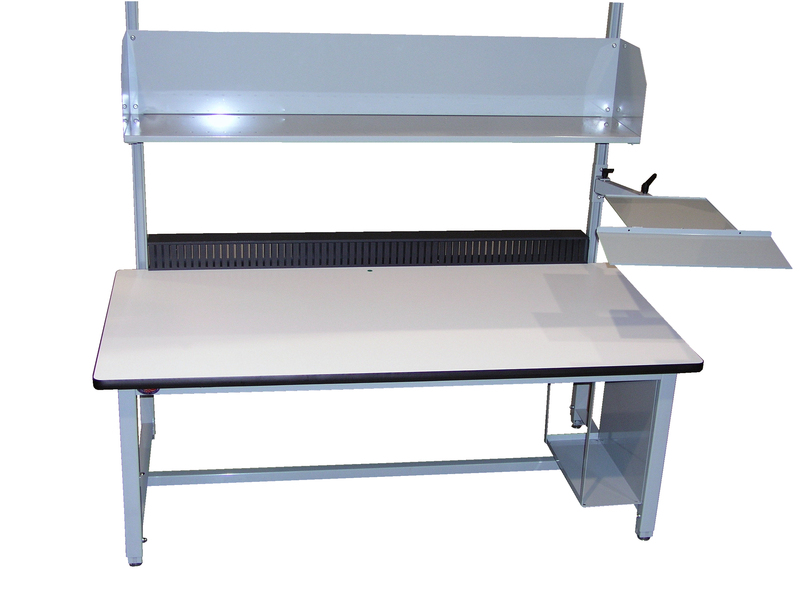 Electric Height Adjustable Workbench 60" x 36" MVSII with two shelves, Mag light, overhead light and footrest. 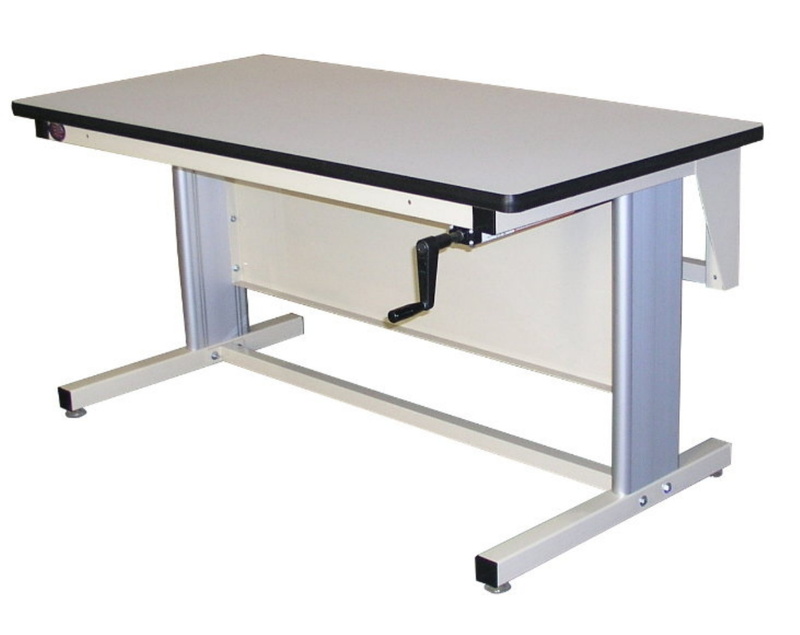 Push button height adjustable work bench adjusts from 30.5" to 42.5". 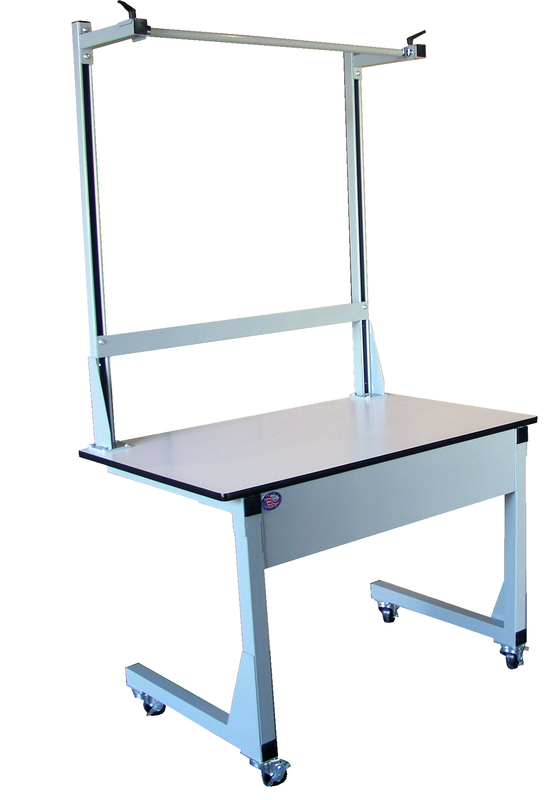 This Push Button Height Adjustable Bench Features Casters, footrest, split uprights, two 36" long metal shelves, deluxe light, flat screen monitor arm, power supply and air quick disconnects. 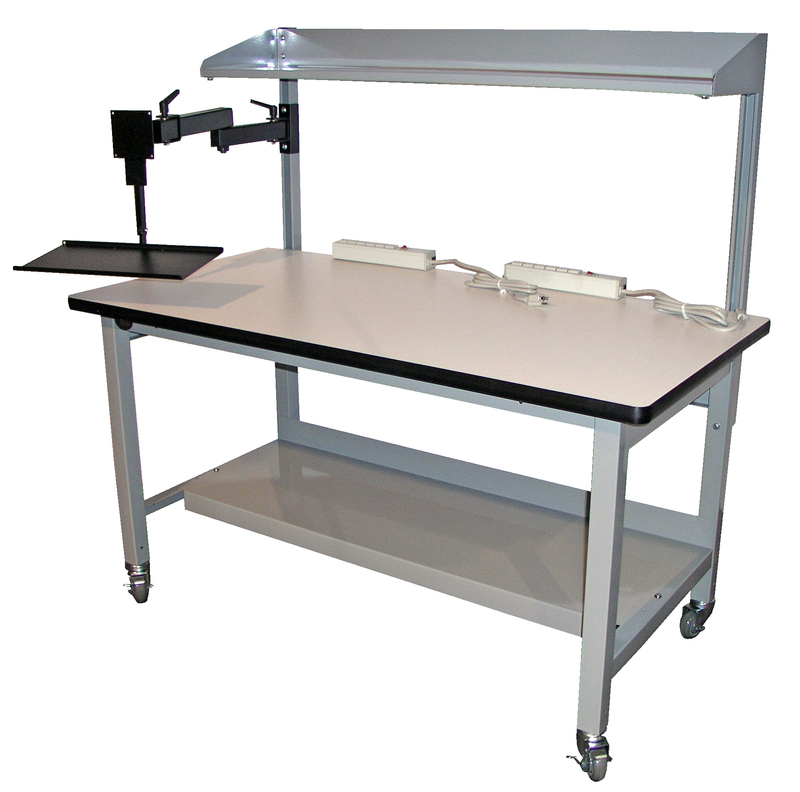 This Fixed Ball Transfer Bench with curved surface, displays Proline's ability to make a work bench to your requirement. 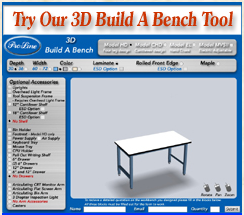 If you have an idea and a rough sketch we can help you with your work bench needs. 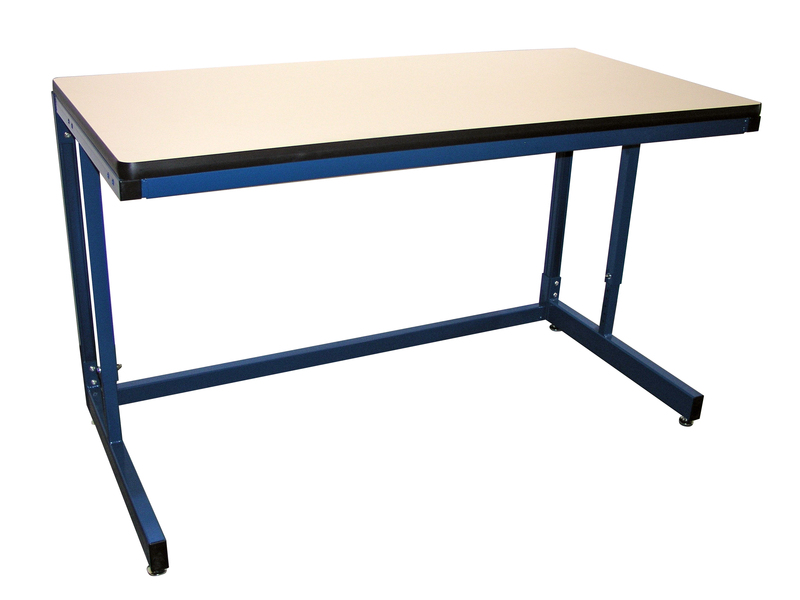 Ergoline Ergonomic Workbench 48" x 30" with Manual Tilt Option. 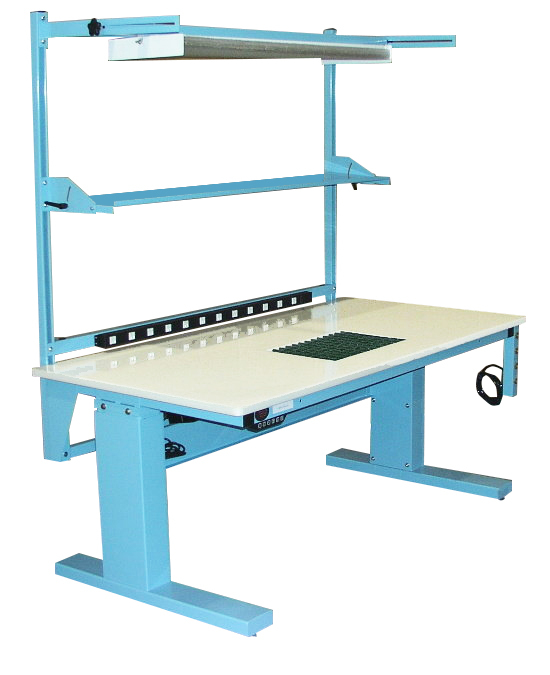 This photograph shows our Ergoline Ergonomic hand crank height adjustable workbench 48" x 30" with optional Manual Tilt Option. 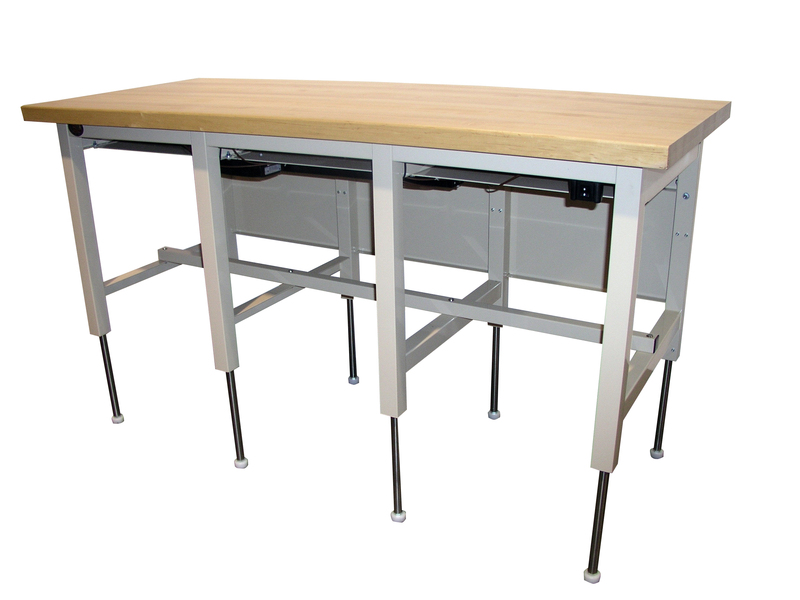 One hand crank is used to make the work surface height adjustable and the other hand crank is used to tilt the work surface making this workbench truly an ergonomic workbench. 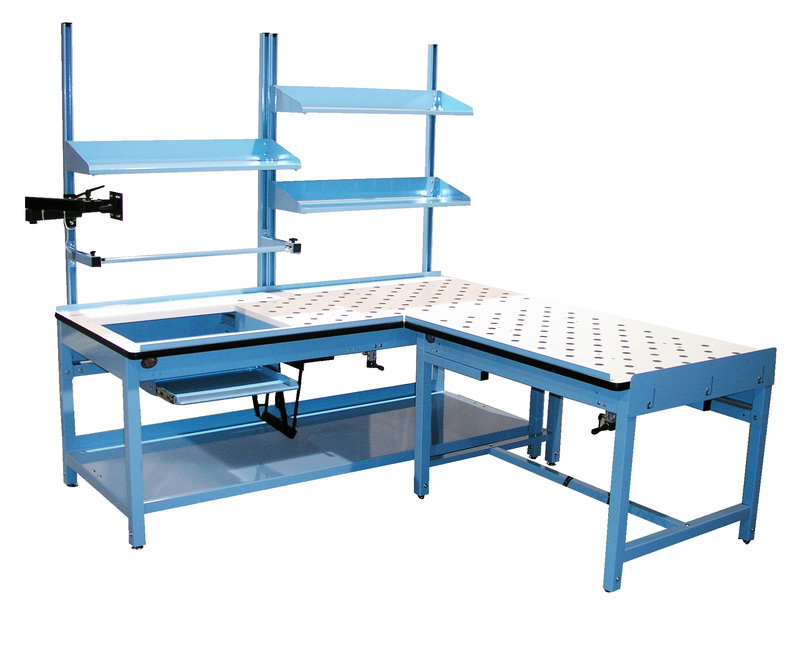 Model HD work bench with Epoxy Resin Surface, our catalog and web site displays our model HD with five standard work surface choices, this photograph helps you to remember, all the surfaces we offer are available for the model HD. Deluxe Lab Cabinet Series laboratory casegoods. 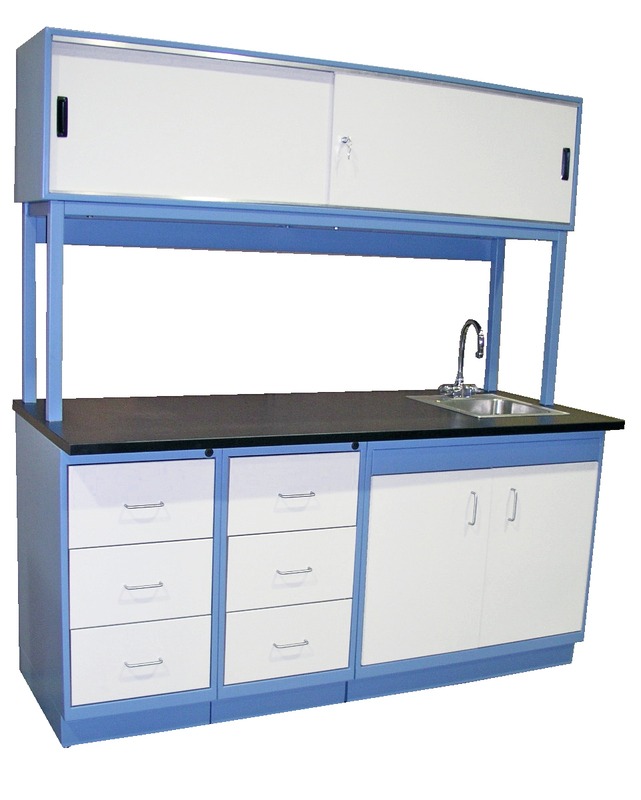 Proline has expanded our Prolab section with these Deluxe Lab Cabinets, featuring stainless steel hinges and pulls, sound deadening doors and drawers, adjustable glides accessed through the bottom of the cabinet. Powder coat paint. 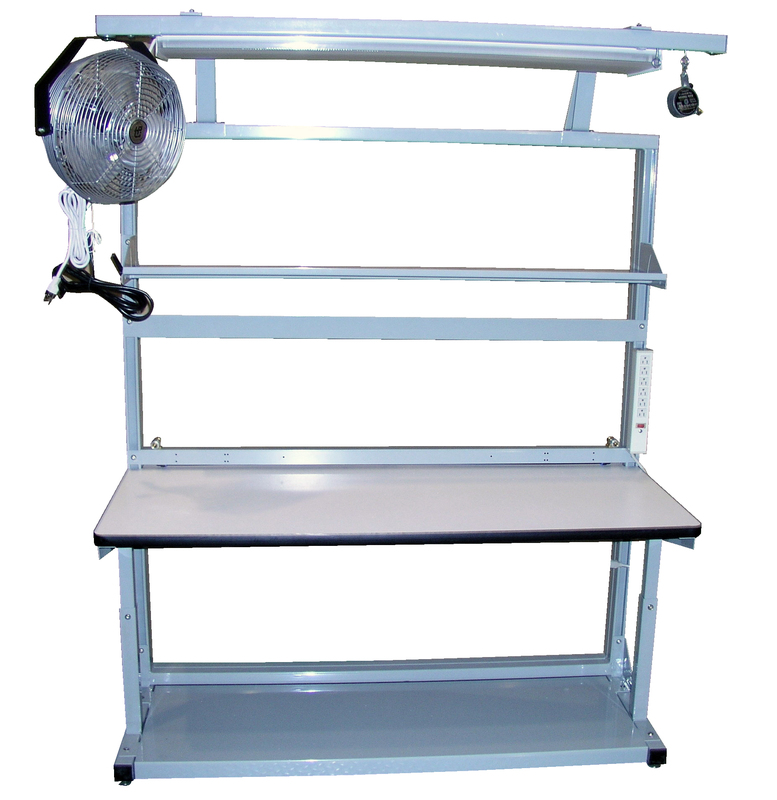 Hand Crank Height Adjustable Workbench 96" x 48" with electric tilt. 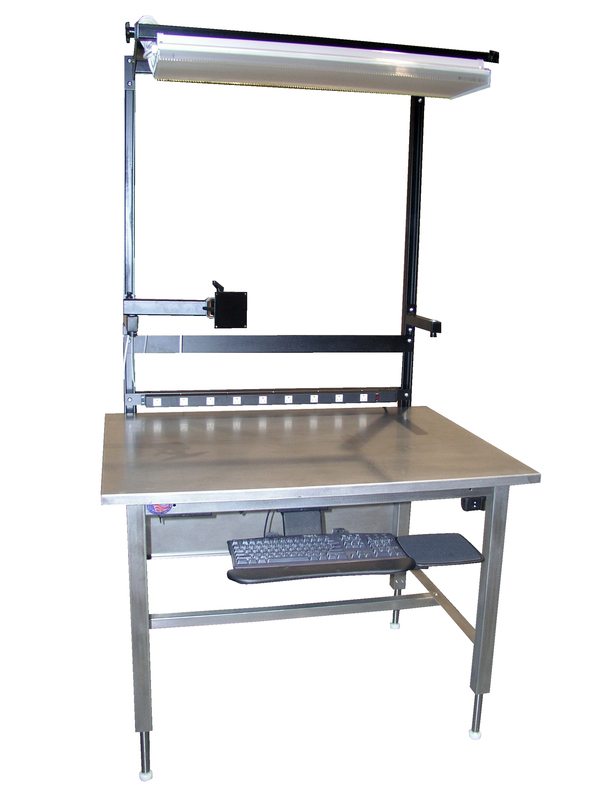 Hand Crank Height Adjustable workbench with a 60 degree electric tilt with programmable memory. When working on large parts tilting, raising and lowering the part reduces worker fatigue. 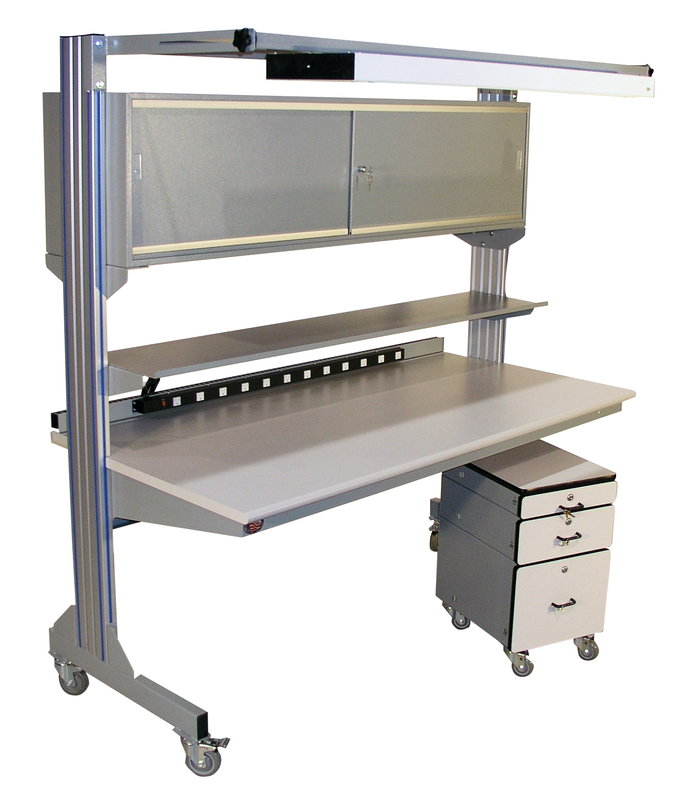 The single sided Flexline workbench uses a fully welded frame with work surface and optional accessories that cantilever off the frame, shown here with light, power supply, shelf, bin holder and drawer. Work surface adjusts from 30" to 36" high. 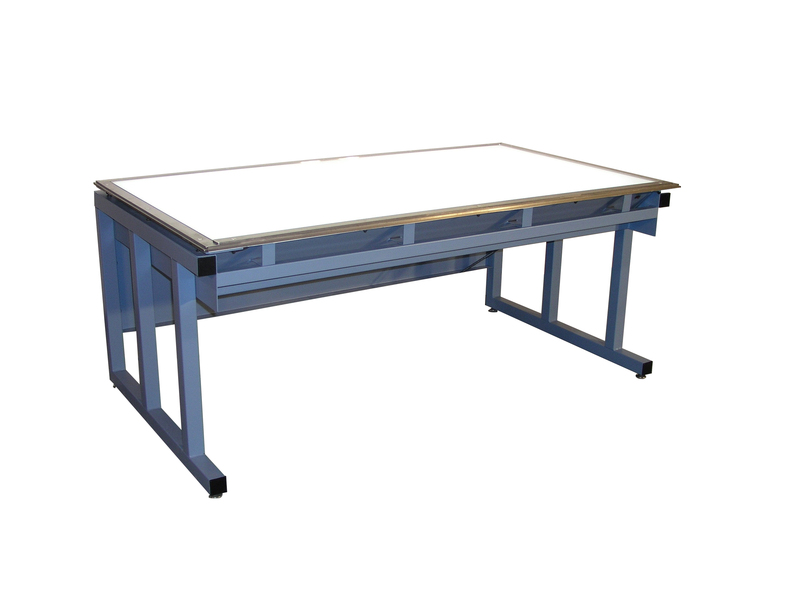 48" long x 36" deep back light table with optional tilt. This photo shows the flexibility of the model HD workbench. 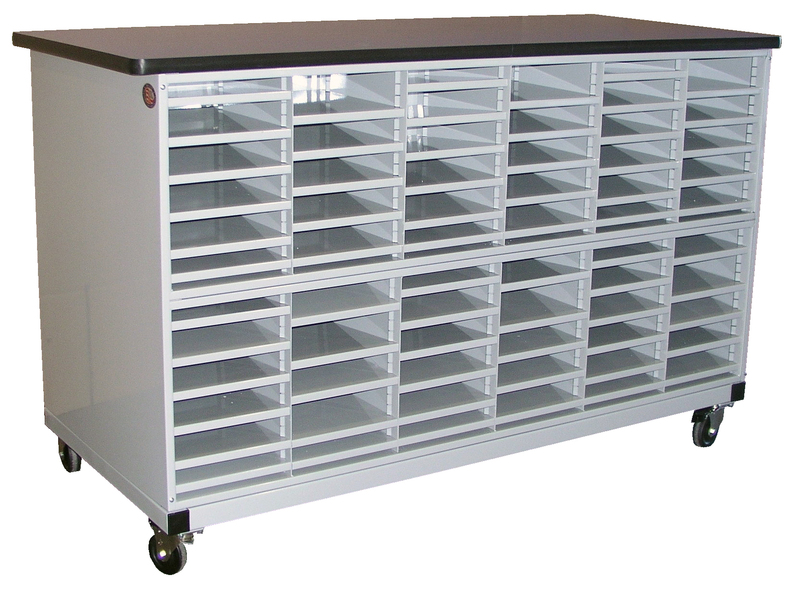 Shown here is an HD 72" x 36" with the mail sorter bin, two sets of drawers on either side, pencil drawer in the center and casters. 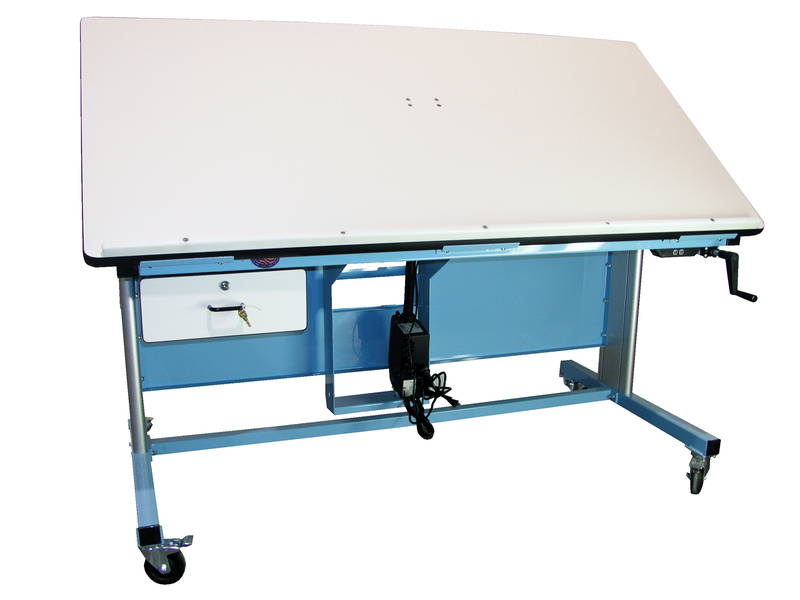 60" long x 48" x 30" to 42" each leg has two hydraulic pistons, this work bench also features , casters, push handle on one end and an 800 pound capacity electric tilt. 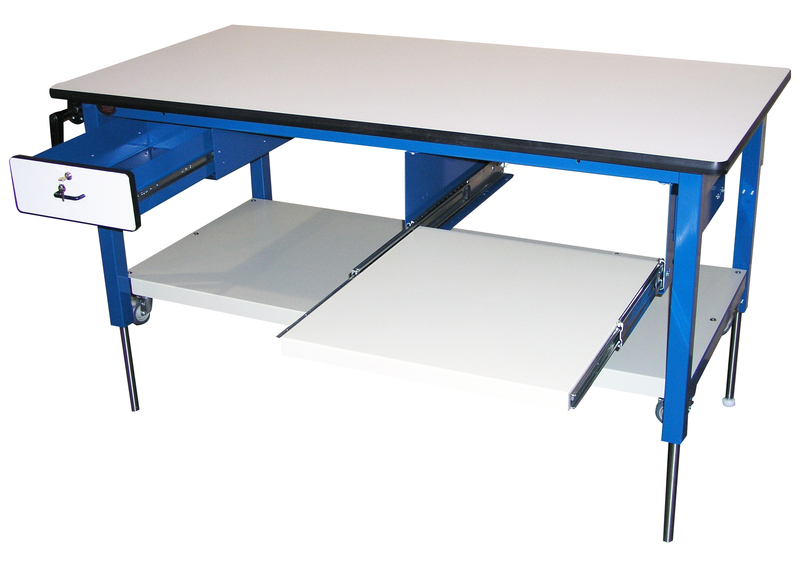 The Base HD workbench includes the left leg, right leg, front rail, 8" back rail, work surface and leveling glides. With our HDLE-6 leg extentions the surface will adjust from 30" to 36" high. 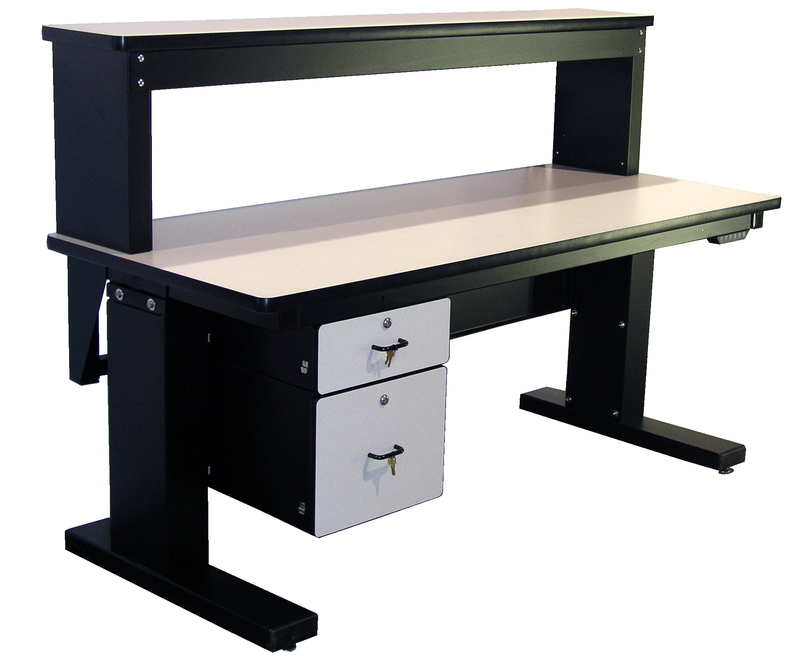 This in stock workbench is available to ship in five business days or less. 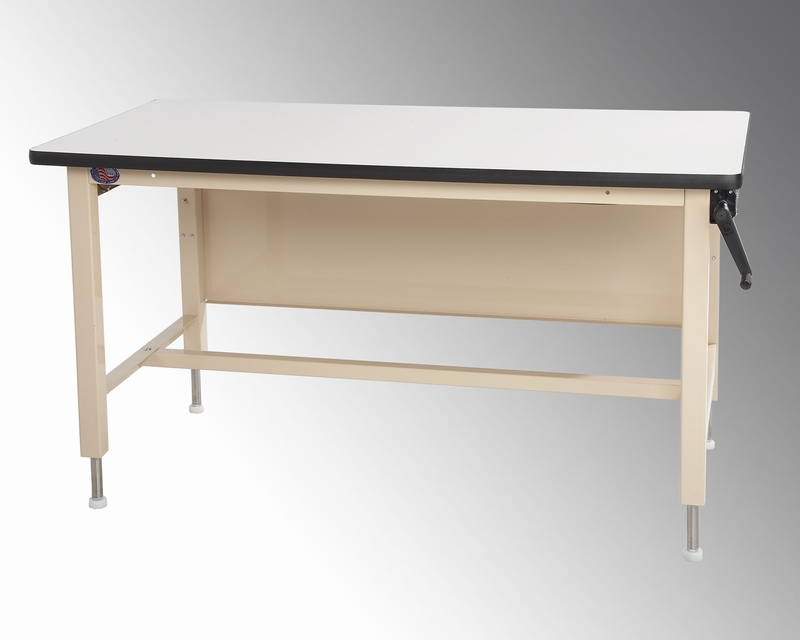 The Base ELH workbench includes the left leg, right leg, front rail, 8" back rail, work surface, modesty panel, footrest and four post hydraulic system with 750 pounds capacity. 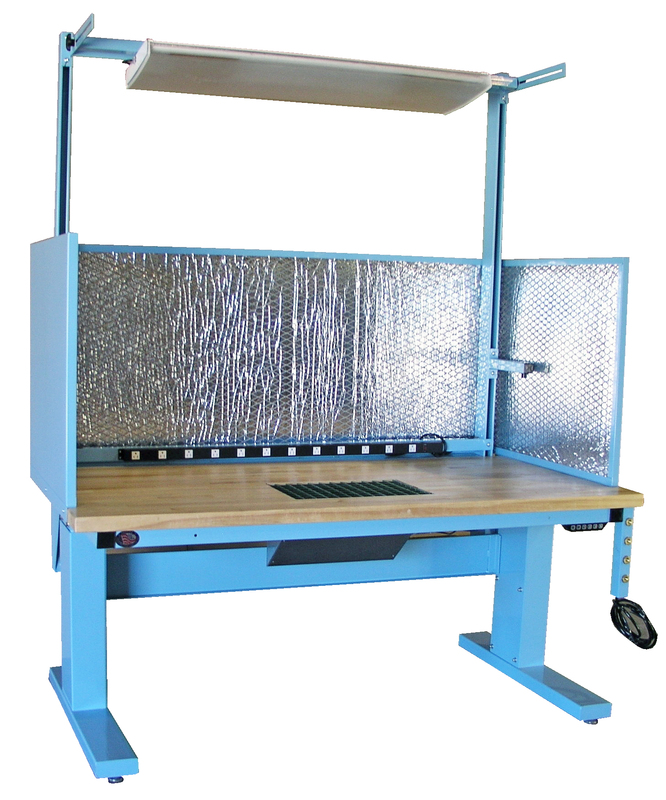 This ergonomic workbench is available in multiple sizes. The base dimension next comes with the two solid uprights, two horizontal leg supports, top suport frame with two cantilever brackets front rail and modesty panel, one work surface with 180 degree rolled front edge. 60" x 30" work bench with fixed ball transfers set on a 3" x 6" pattern. Also shown are two footrest and a set of TLC-4 total lock casters that locks both roll and swivel of the caster. 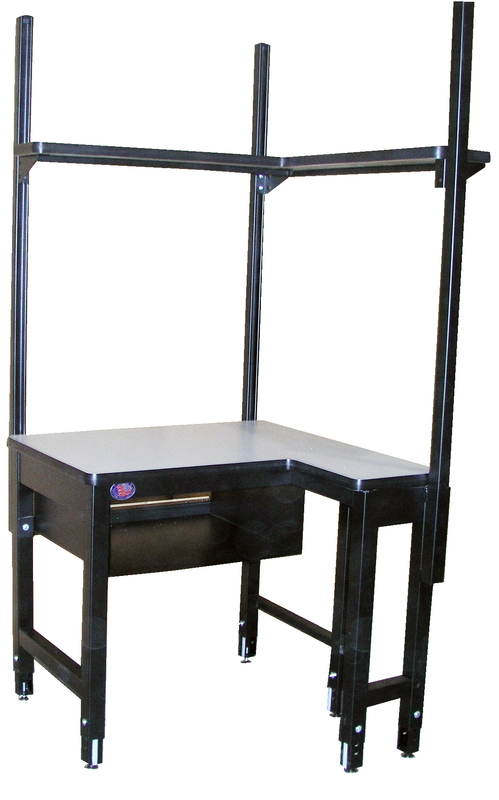 Hand Crank Height Adjustable Enclosure Stand, do you have a storage or ergonomic problem with out a solution? 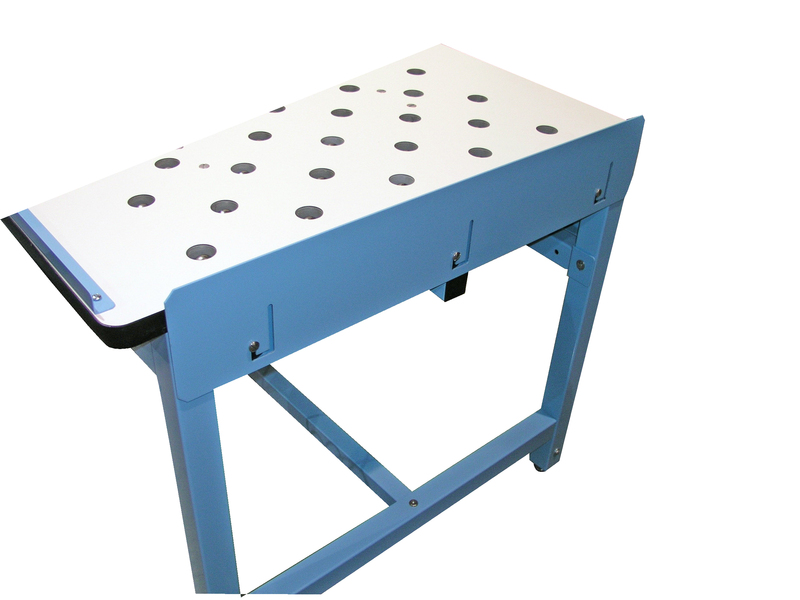 Call us to help you design the work bench or work platform you require. This photograph shows a cabinet that was built to the customers specifications, the cabinet is mobile with locking casters, has three 3" drawers for tool storage, large area to store tool boxes, tray on one side to hold drawings and folders and three small trays on the other side to hold small tools and parts. The rubber mat on the top protects parts that are laid on the cabinet. SGK-J2 Standard ESD Ground Kit and Jacks. When you look at the photograph of the work benches you can see where the ESD ground kit mounts on the bench, but not what is included in the kit. This photograph shows the ground lug, ground lead and the two banana jacks to plug in the wrist strap. 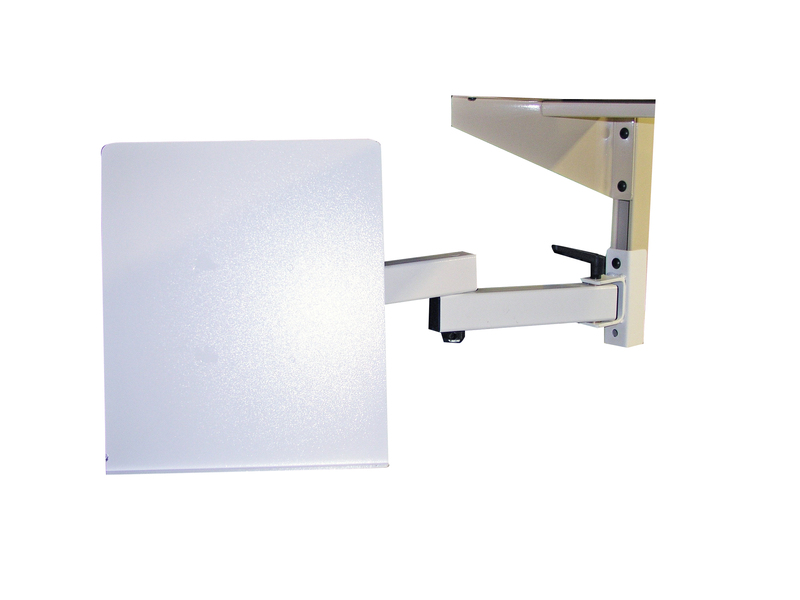 shown with mounting brackets for the Flexline and Basics series. On the HD style frame the jacks mount into the front rail. 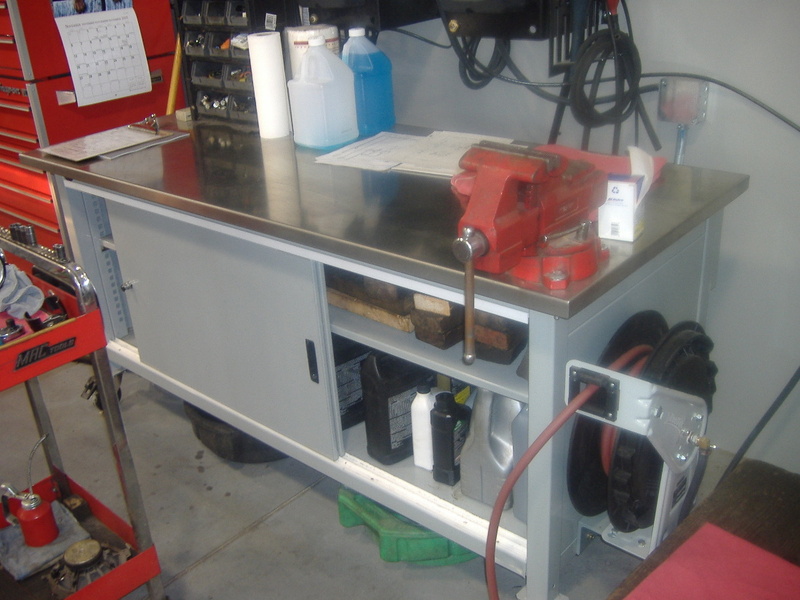 This automotive repair shop wanted strong, mobile, secure work benches for their repair bay. 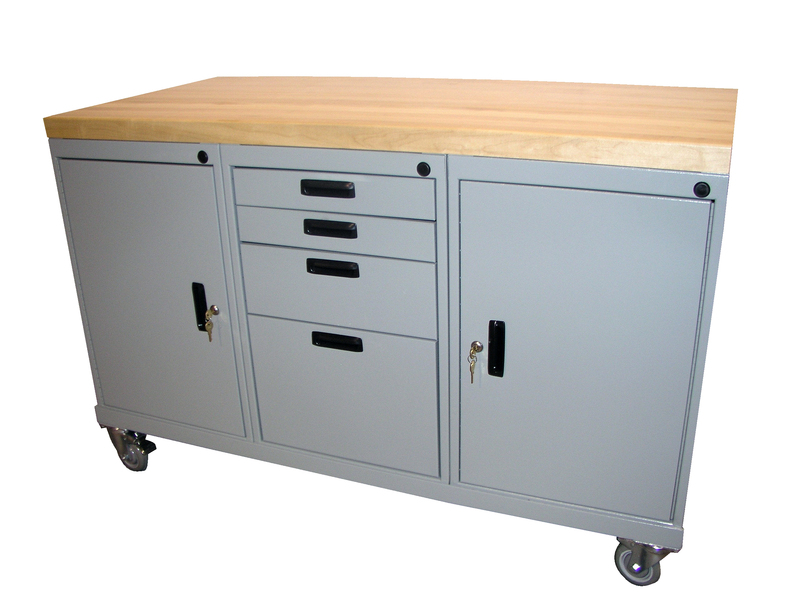 They decided on our ECB7230SS Enclosed Cabinet Bench with stainless steel work surface and our TLC-4 total lock casters. 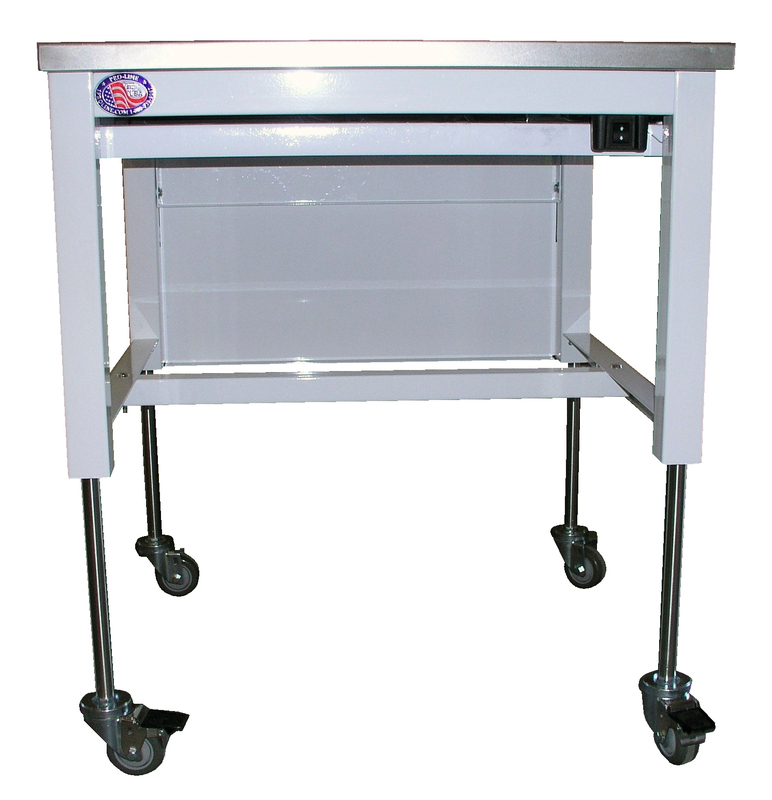 With the lockable sliding doors, this bench keeps their tools safe and their shop clean. With the vise and air hose it is extremely functional as well. 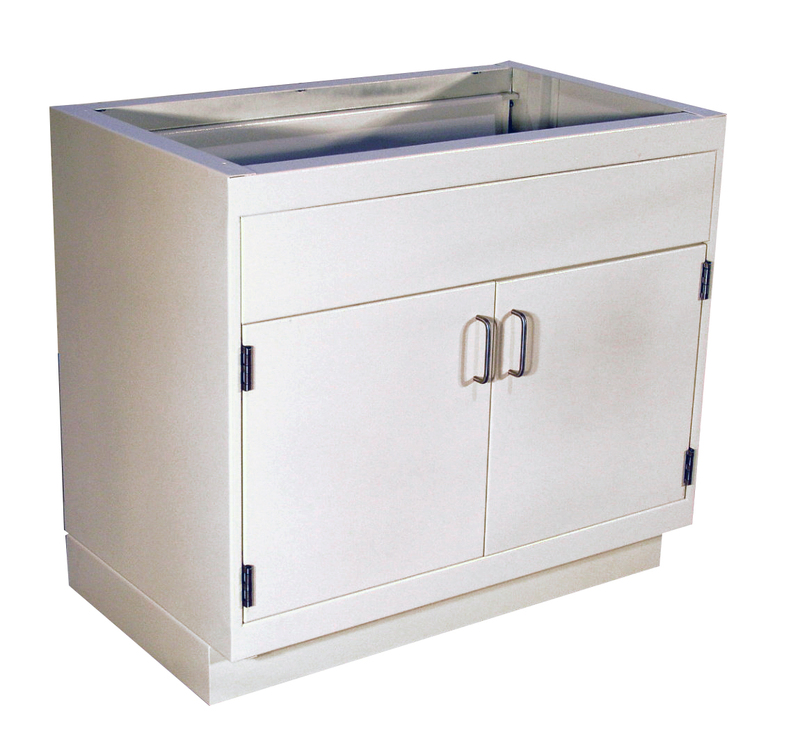 This photograph shows how the Prolab cabinet sink base is open on the top to except your sink in the field. 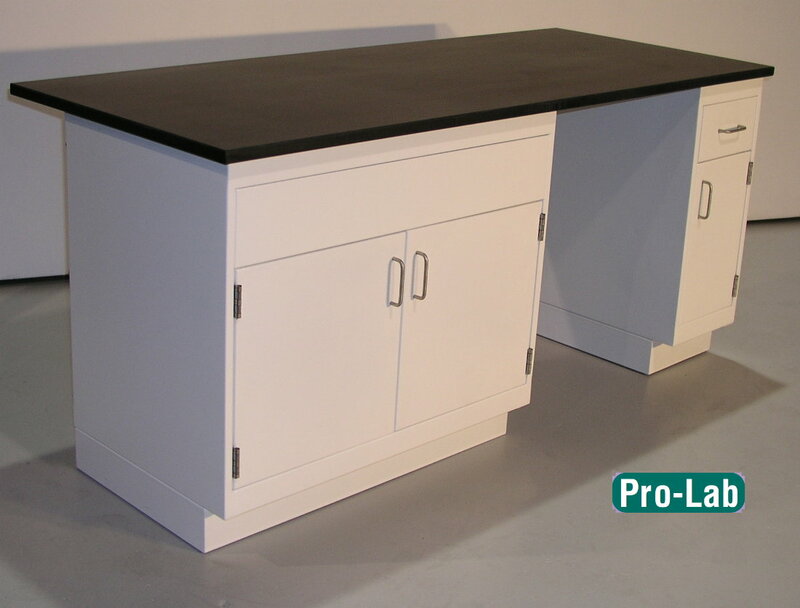 All Proline Prolab cabinets feature a removable back panel for easy access to add plumbing and other utilities. HD Workbench / split upright, deluxe light with parabolic lens. 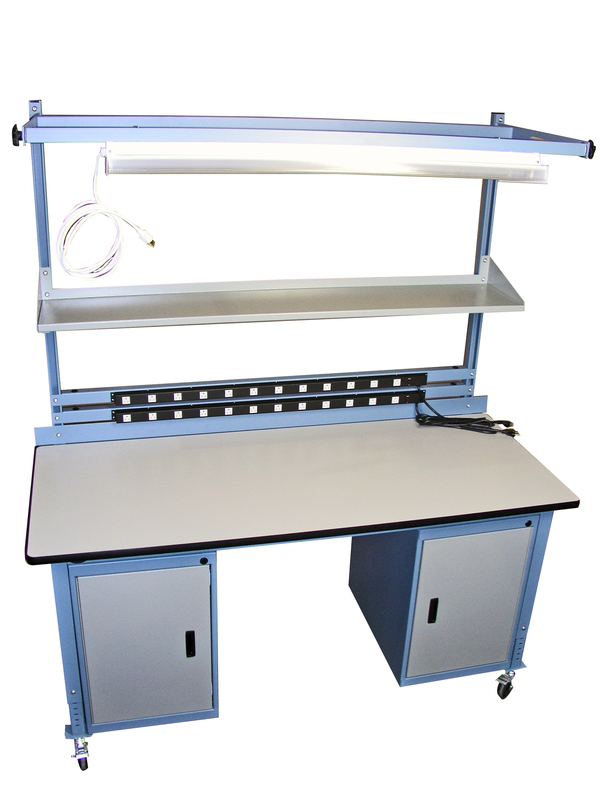 Shown here is our model HD work bench 60" x 30" x 30" with leg extensions making the surface adjust from 30" to 36" high, split upright, overhead light frame with deluxe light fixture and a parabolic lens. The work surface is white and the frame is painted textured black. This is a close up of our deluxe light fixture with T-8 ballast and a parabolic lens. 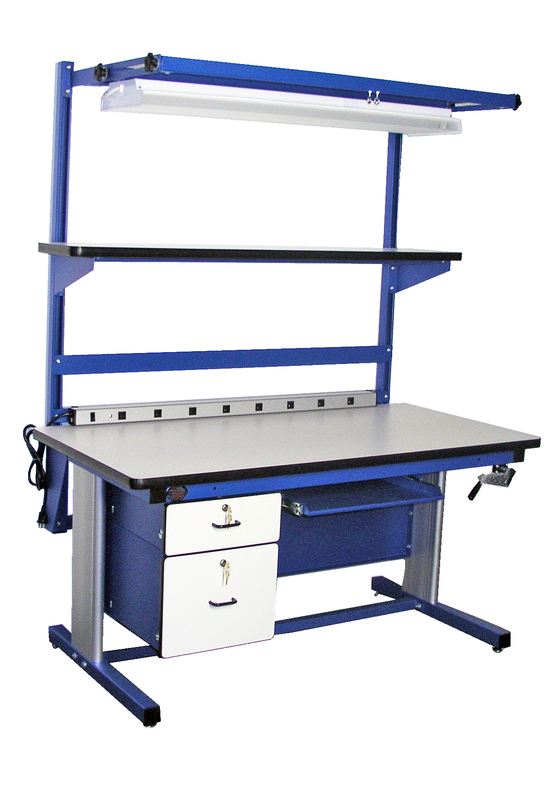 Our MVSII6036P 60" x 36" height adjustable work bench adjusts from 30.5" to 46.5" with 1,000 pounds capacity, shown with two cantilever shelves, Mag light and holder, power supply, over head light and a fixed footrest. 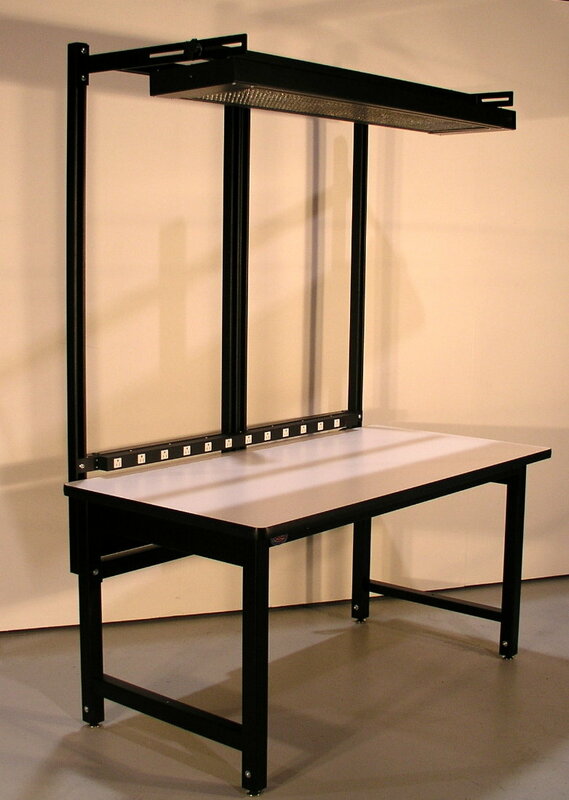 The Basics model work bench can be outfitted with split uprights as shown in this photograph. 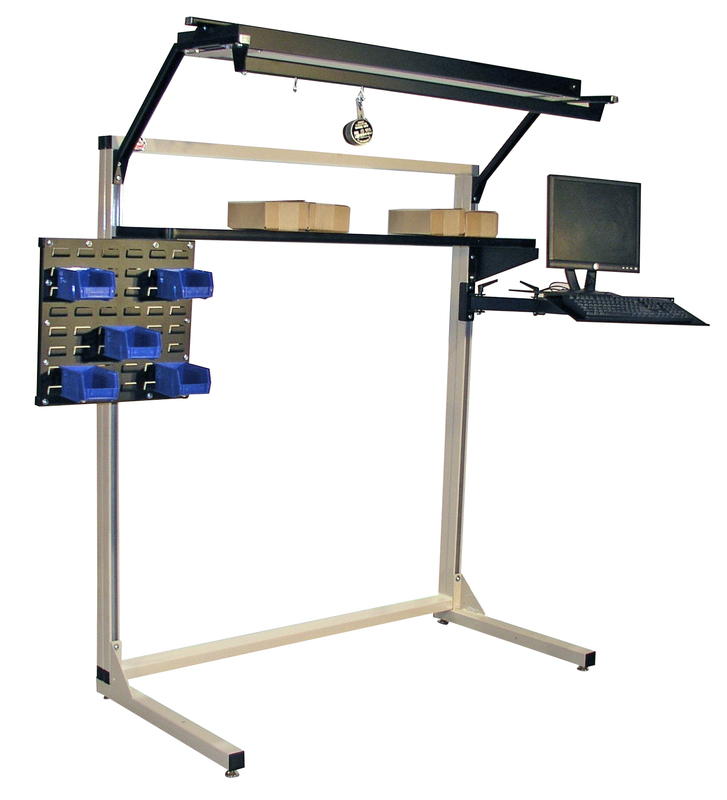 This model is an ESD work bench with a 90 degree rolled front edge work surface and our standard ground kit with two banana jacks. It is also shown with a 36" long tack board. The cabinets, shown here feature sound deadening doors, five knuckle stainless steel hinges, stainless steel wire drawer pulls and an Epoxy Resin work surface. These cabinets also feature adjustable leveling feet that can be accessed from inside the cabinet. Painted textured white. Grinding can be loud and dirty, with the optional accessories of a down draft vent and sound enclosure you can reduce noise and dirt. The vented down draft connects to your in house exhaust system, the sound enclosure is insulated to absorb sound. CHD Textured black with 90 degree ESD gray surface. Shown here is our Model CHD6030 painted textured black with 6" of adjustment on the surface from 30" to 36", with ESD gray 90 degree rolled front edge surface and ground kit with two jacks for the wrist strap. 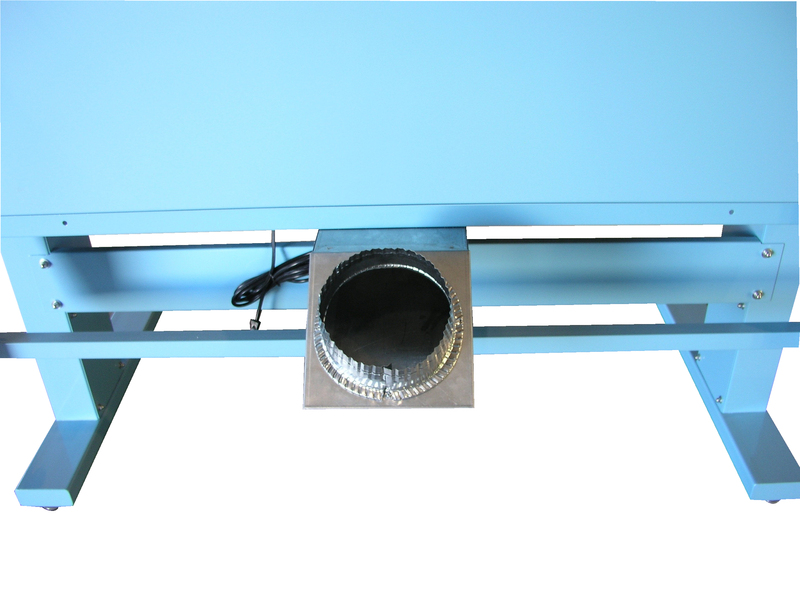 Shown on our MVSII platform this work bench features an HDPE work surface with a 12" x 24" down draft section, under the green grate is duct work that runs to 8" diameter duct to easily connect to your internal exhaust system, ideal for grinding applications. 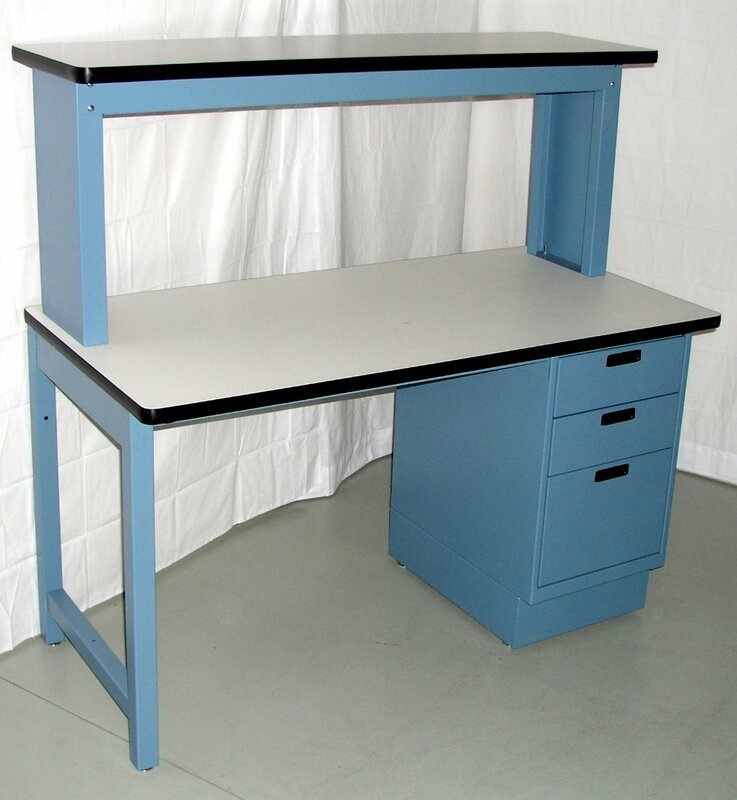 Two model HD workbenches back to back with shared upright. The uprights bolts to both benches to keep them together. Shared corrugated shelving saves space. With the model HD's modular design you can easily add additonal shelving, power supply, bin holder's or any accessory that you require to get the job done. 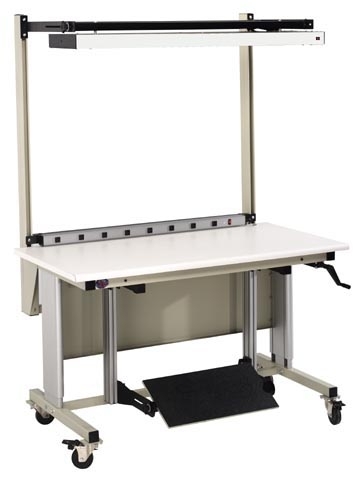 This mobile ergonomic work bench features hand crank height adjustability, 90 degree rolled front comfort edge, total lock casters, AT-20 ergonomic foot rest, power supply and s deluxe light fixture with a parabolic lens. 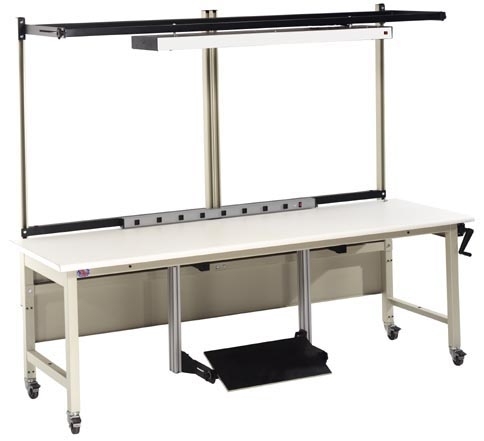 This work bench is our ELH series four post hand crank height adjustable work bench, at 96" long it offers a large work area, shown are the split upright system, elh-poc casters for the ELH series, light, power supply and the AT-20 foot rest that adjusts with the workbench. 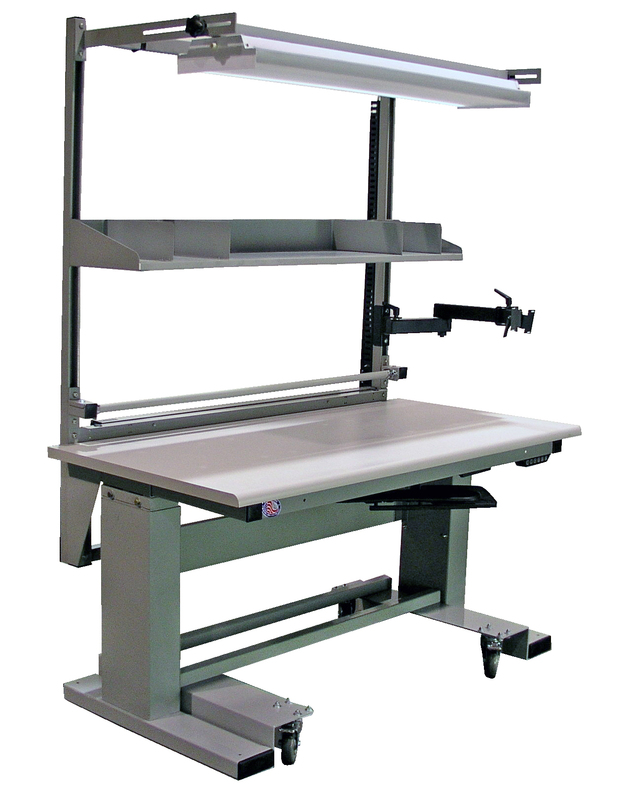 1,000 pound capacity electric height adjustable work bench with 90 degree rolled edge, AT-20 foot rest, power supply. light and total lock casters that locks both swivel and roll of the casters. 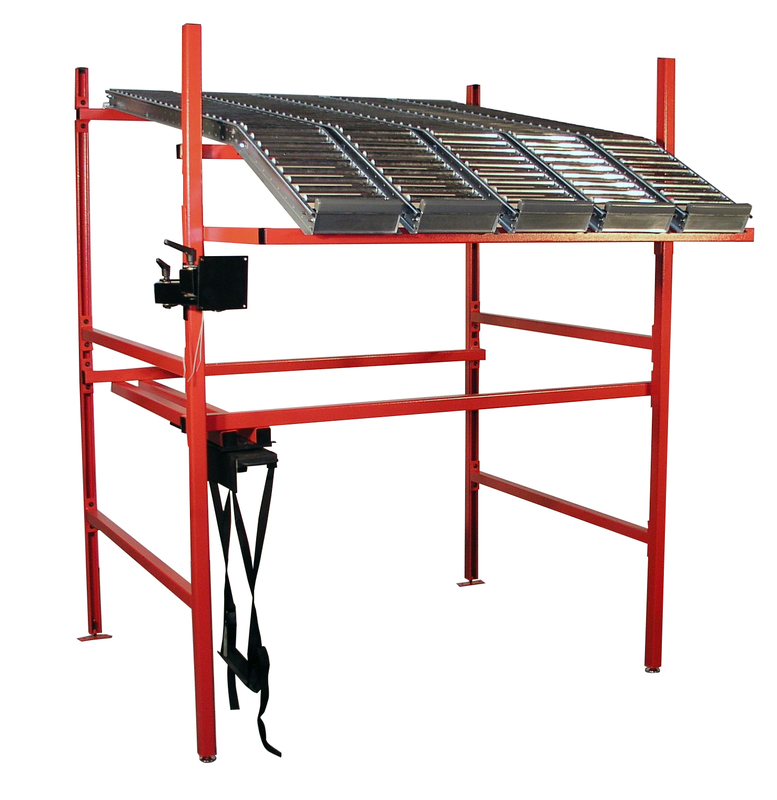 Do you work off your conveyor or perhaps another work platform not a modular work bench? Do you require computers in the process, yet have no place to mount them? This photo displays the freestanding computer stand, with monitor tray, CPU holder, power supply, and articulating work platform. All optional accessories adjustable on the column. 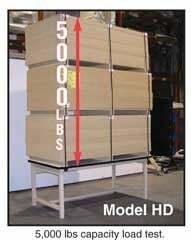 With our built in scale shelf you can avoid lifting heavy products to weigh them. Shown here mounted into a retractable ball transfer, the length and depth of the cut out matches the scale, the steel shelf depth is set to allow scale surface to be flush with the work surface or ball transfer. 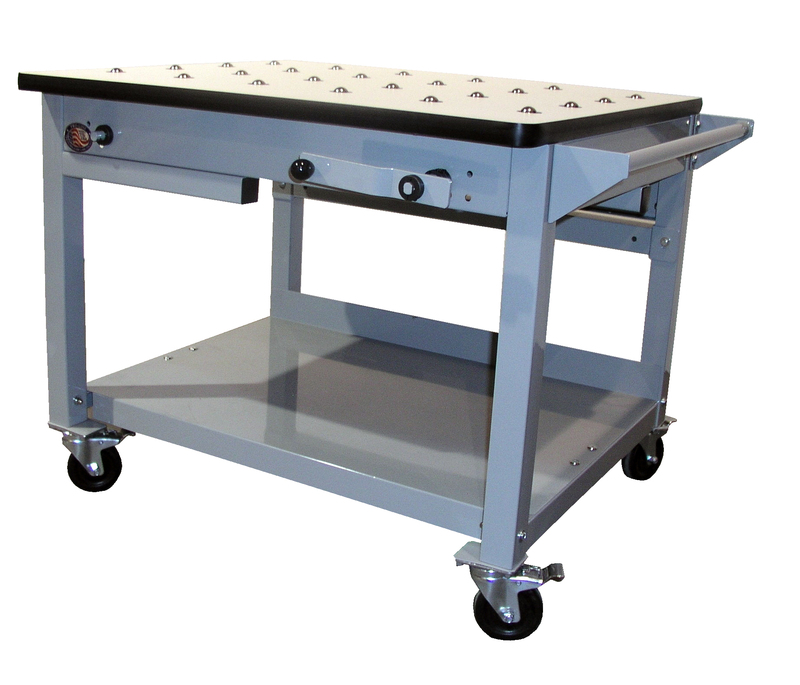 This photo displays an Electric Height Adjustable Stainless Steel Work Bench. Both the frame and work surface are made from stainless steel with the optional electric hydraulic push button height adjustment. 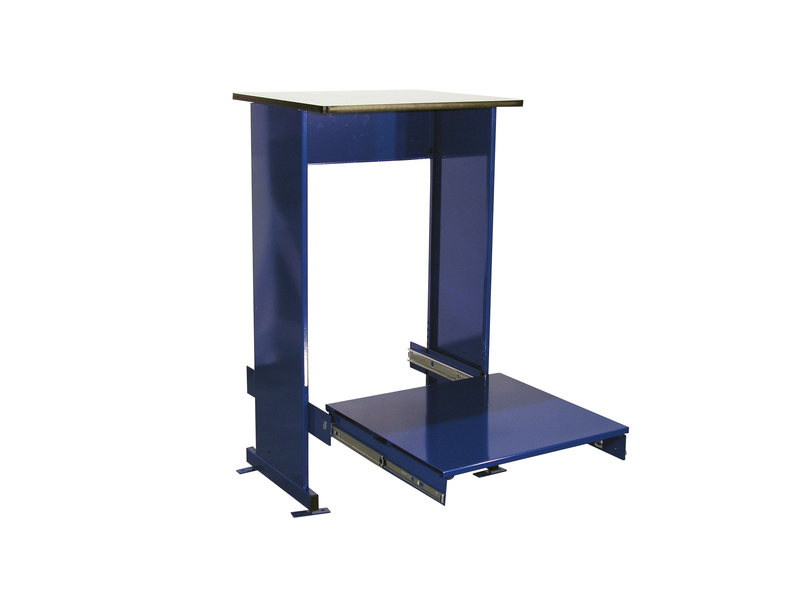 Heavy Duty Pedestal Work bench (PCP) series shown here is the model PCP7230OESD with the left leg, support frame running from the leg to the cabinet, ESD work surface and the optional riser shelf. This photo gives you a good view of the pull out shelf as well as Proline's steel housing drawer with laminate face and lock. Also shown is the hand crank mounted on the left hand side of the bench (default is right). 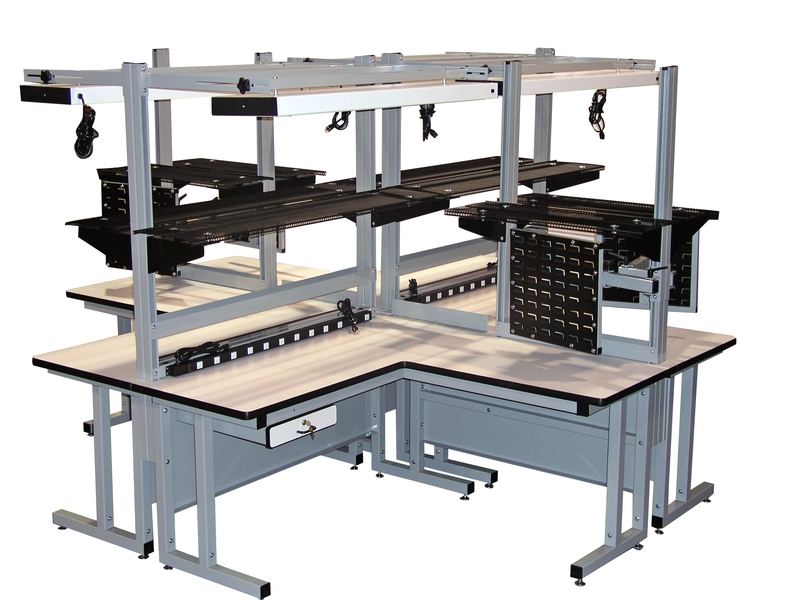 Contact us to help you configure your work benches. 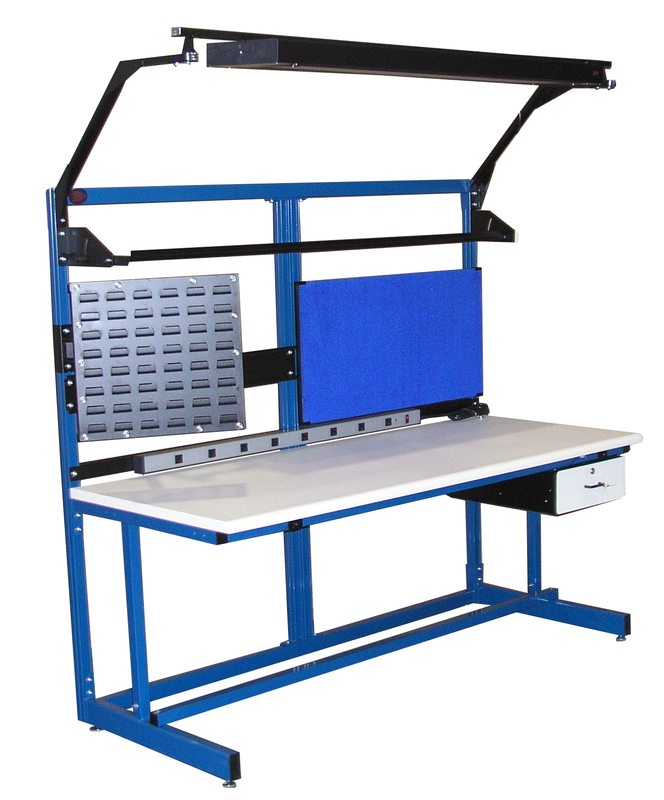 The model HD workbench is flexible and modular and with just a few changes can easily adept to different work environments. Shown here painted green to identify ROHS compliant areas, also shown are Kim wipe holder, solder spool holder, tool holder and the deluxe light mounted under the surface. Are you building long wire harness's? This photograph shows four 8' long wire harness benches that can be bolted together and work in unison. Each bench can be a " master bench or slave bench" We held a .125" tolerance over the 32' length. 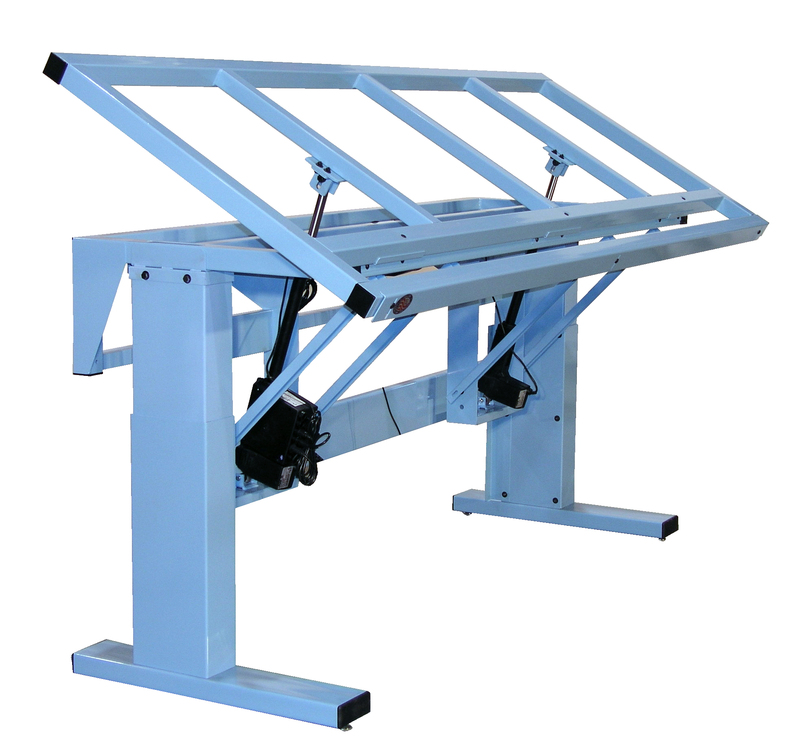 With this modified EL Ergo-line work bench the center of the surface has a 90 degree electric tilt, used with the EL hand crank height adjustment, articulating bin arms and overhead tool suspension frame and balancer, you bring the work to the operator. Many companies use large printers in the manufacturing and packaging of their products, many of these printers require access at the top of the printer to reload paper and replace ink. Proline’s pull offers two options for these printers, both feature 90% extension slides for easy access to the printer. MVSII with pull out printer tray. The standard upright for the Dimension Next series is 82.785" high, this photograph shows how you can specify the over all height that you require. And since we do all of our own painting in house you can select from one of six textured powder coat finishes for this model. 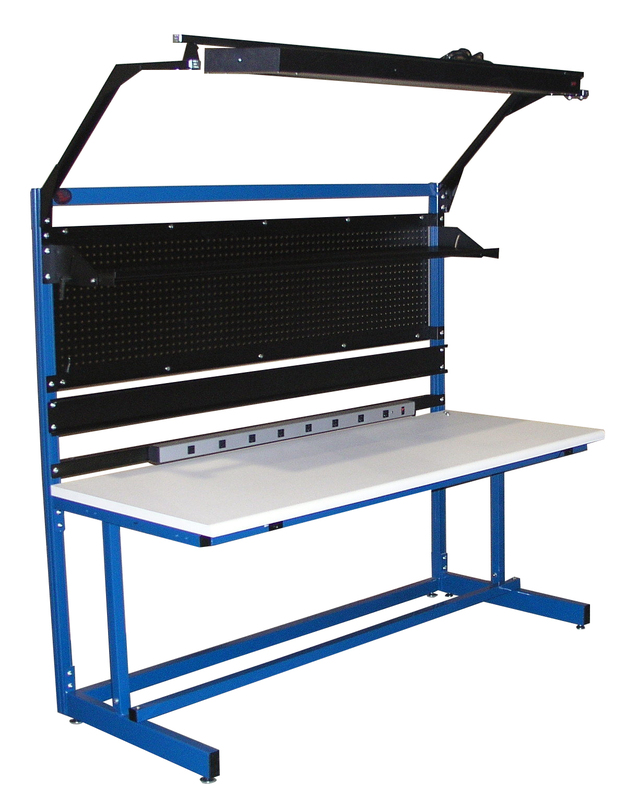 This Ergo-line work bench shown with optional casters, pegboard, deluxe light fixture, flat screen monitor arm with drop down keyboard displays a great example of a mobile ergonomic work bench, good lighting and your tools can be placed close at hand. This photograph shows how versatile the model HD really is. The picture shows the Model HD painted black with an optional wire rack mounted to the rear upright. 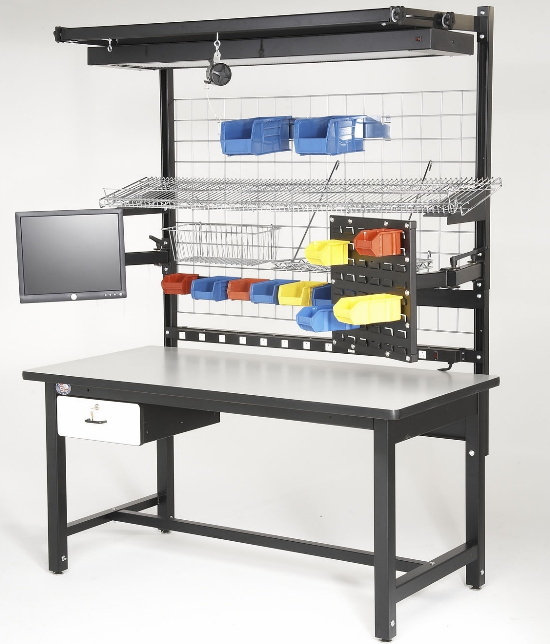 Accessory your HD work bench to meet your needs. We are often asked for a photograph of the base EL Ergoline work bench with out the accessories, so here it is. 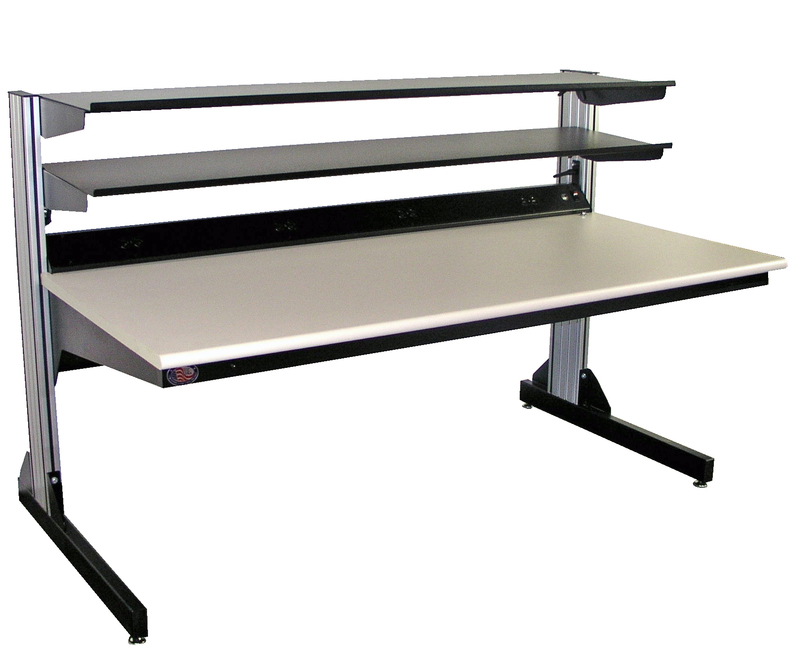 The photo show the base EL6030PL-H11, the building block of a great ergonomic work bench. 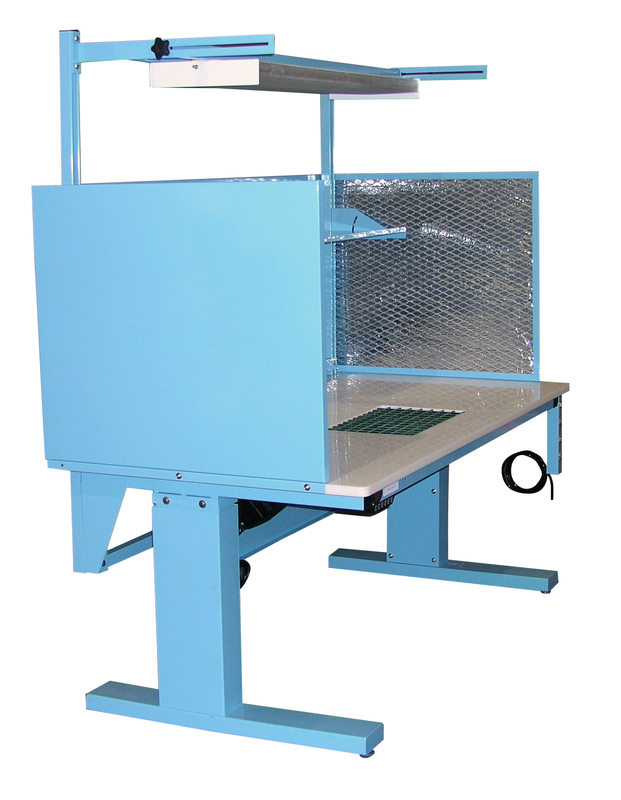 The 96" long x 48" deep Wire Harness Bench with electric tilt and electric height adjustment is ideal for companies working on large heavy wire harnesses. Our standard Model EWH7236 will hold boards up to 96" x 48" but we have been asked in the past to make the platform 96" x 48"" as shown here. 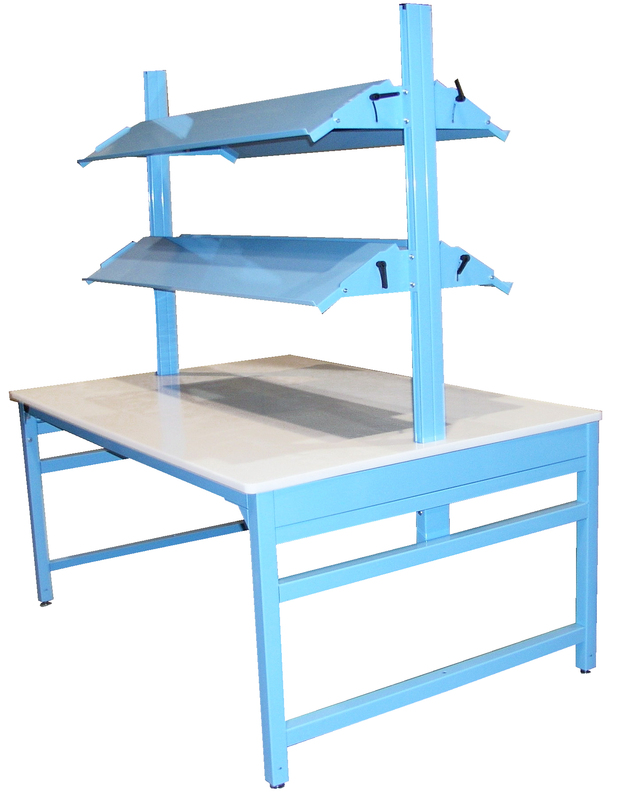 Built on our Model CHD platform, this quad unit uses four "L" shaped CHD benches as shown the footprint is 120" x 120" each unit shares double sided uprights to allow you to accessories the bench to meet your requirement.